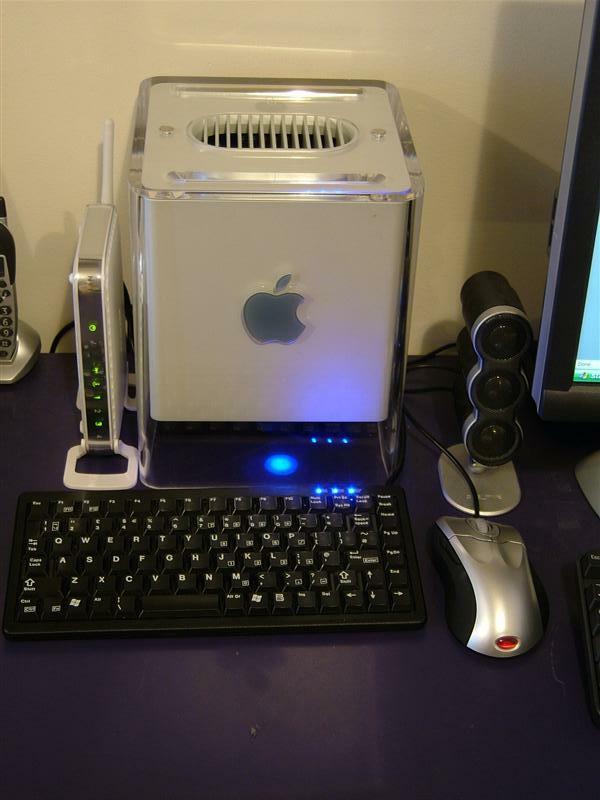 As most people who know me in person know, I’m a bit of an Apple fan. 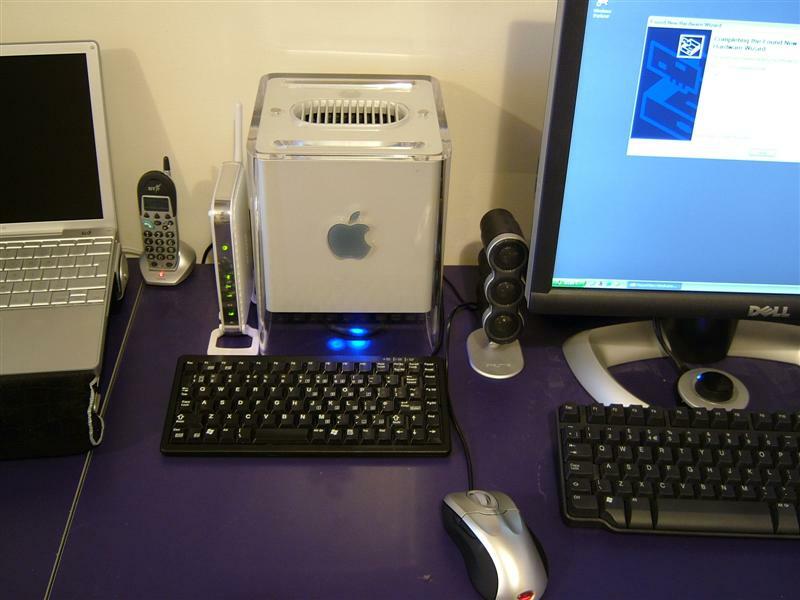 You only have to take a look at my desk to tell what a sucker for apple kit I am. 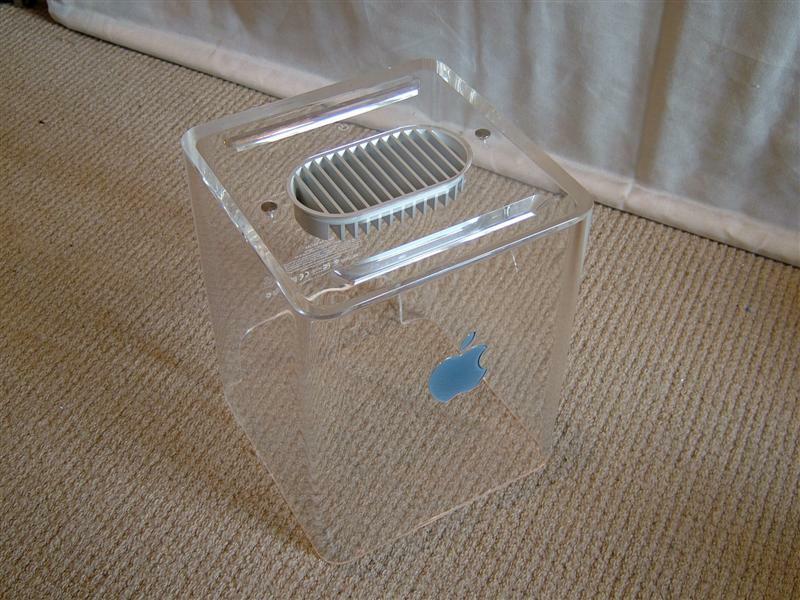 I’ve owned lots of Apple products, and I’ve yet to be disappointed with one of them. I’ve also loved the Genius bar service when I’ve needed them. Two weeks ago my beautiful Apple 24in Cinema Display had to be taken into my local Apple store. It had been suffering from strange cut outs in sound. So I booked a genius bar appointment and took it in. 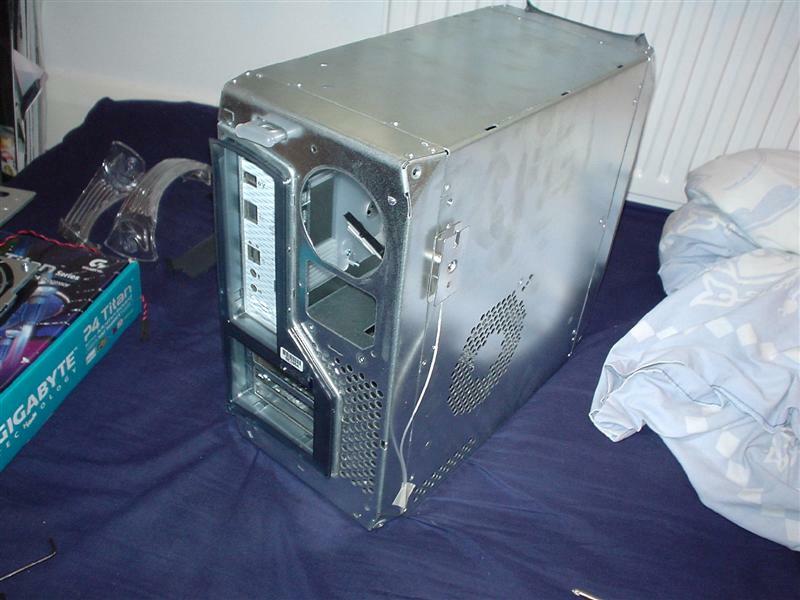 The Genius was very helpful, booking it in for repairs, but I took it home to use it until the parts arrived. A day later I took it back in for the repair. It was all so easy. They fixed it on a Sunday so I could collect it on the Monday. Sadly however repairing the logic board failed to fix the issue, so I took it back in the following week. They tried to fix it again, but in their testing they could replicate the issue so it hadn’t worked. Normally at this point I’d be worrying about what the company was going to do about my issue, however with Apple I was positive they would sort things out. Now seeing as the 24in ACD is no longer made, the genius’s couldn’t give me a replacement. So they said right we will replace it with the 27in model instead! Now the 27in ACD is far more expensive and a massive upgrade. I was over the moon! 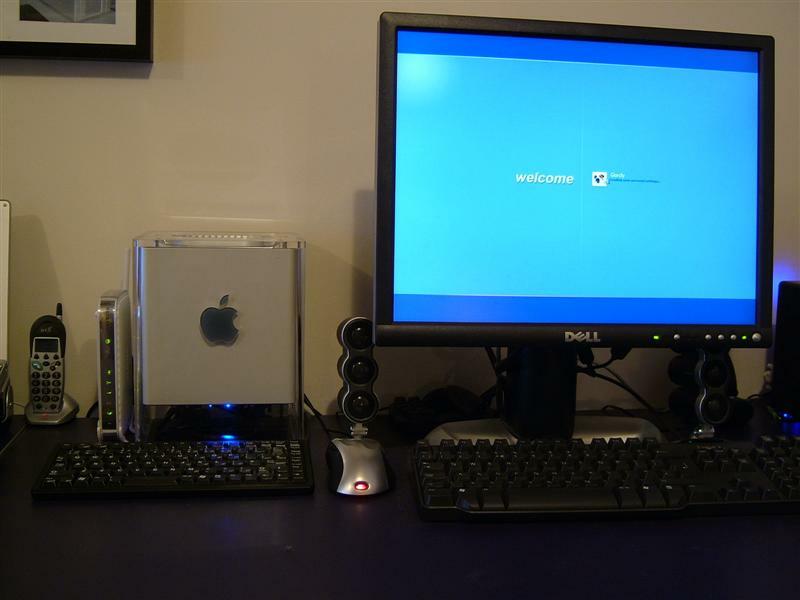 I’m now typing away on my mac mini using the new 27in ACD. It’s simply stunning to behold! And of course massive! So top marks for Apple and in particular the Cribs Causway Apple store staff who were superb. There is only one downside to the new 27in ACD and that’s me wanting to pair it with an 11in Macbook Air! 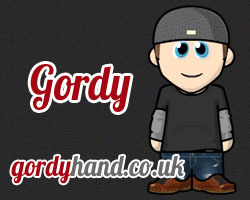 Ah Gordy you nugget. Having owned an iPad since it was launched in the UK, I’m a big fan. However I find myself recommending that clients and friends don’t get one. I think my main reason behind this is that for most people they are a luxury item. 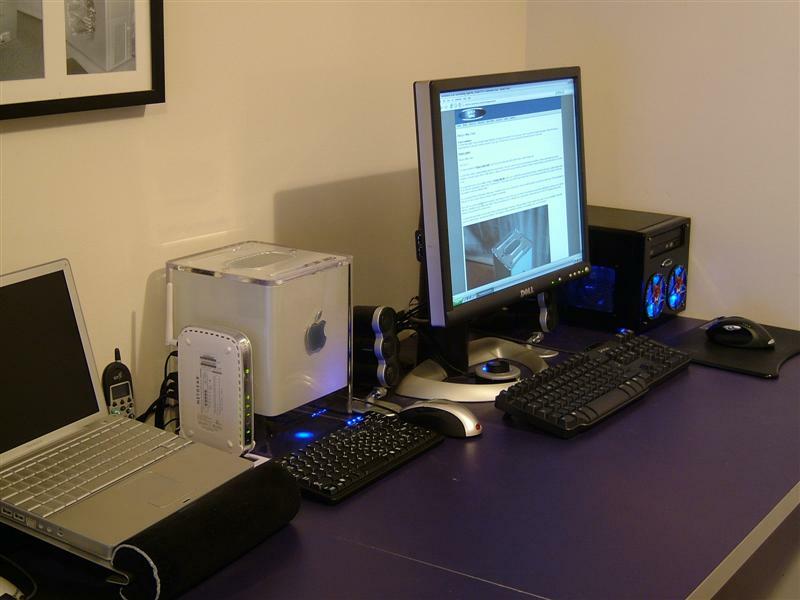 It is not and never will be in it’s present form a replacement for a laptop/desktop. The lack of the webcam is probably it’s biggest failing. I’d love to use mine for skype without having to get out my wife’s MacBook pro or use my Mac Mini’s webcam. With skype’s iPhone app being updated for video I’m delighted that I can now use it properly on my iPhone. I can see using this far more than FaceTime. Whatever the difference between the 1st gen iPad and the 2nd. The current model is still an amazing device. I use it whenever I have the chance and after many months of using it I still really enjoy doing anything on it. I love being able to quickly do what I want and not wait for it to wake up or worry about the battery state. There are going to be some good bargains to be had for used iPad’s on eBay, next year. With I think a fair portion of current owners upgrading. Microsoft, Android and Blackberry are going to have to do someone very different to take any sales away from apple. They will take Market share simply because apple have the Market as it stands sown up. I hope they do up their game and it will only spur apple on to make the iPad better. Competition is great for us customers. I’m nearly finished on Project Little Devil I just have a few minor bits still to finish when I pull my finger out. So with that in mind I started thinking about my next project, I have two other ones on the back burner but neither of them really inspire me at the moment or suit my needs. 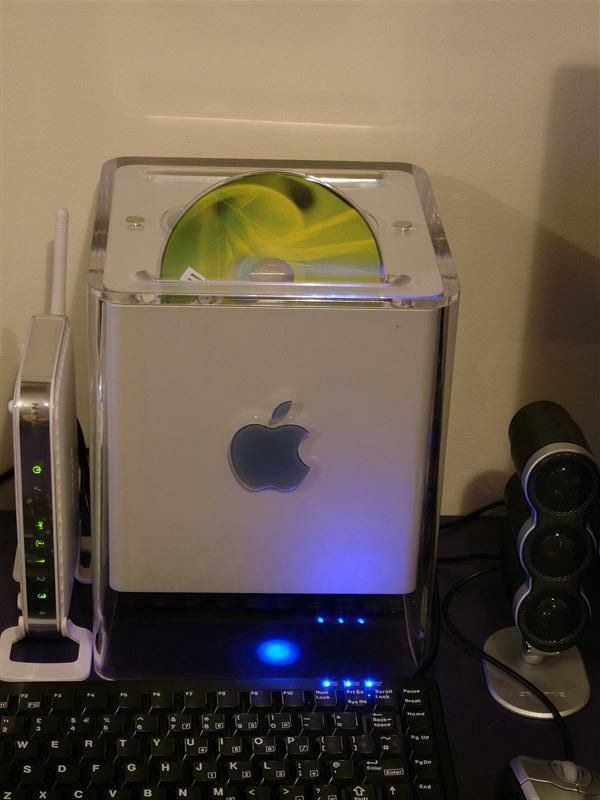 What I really need is a fileserver that small and good looking. With this in mind I started coming up with some idea’s as to what to do. 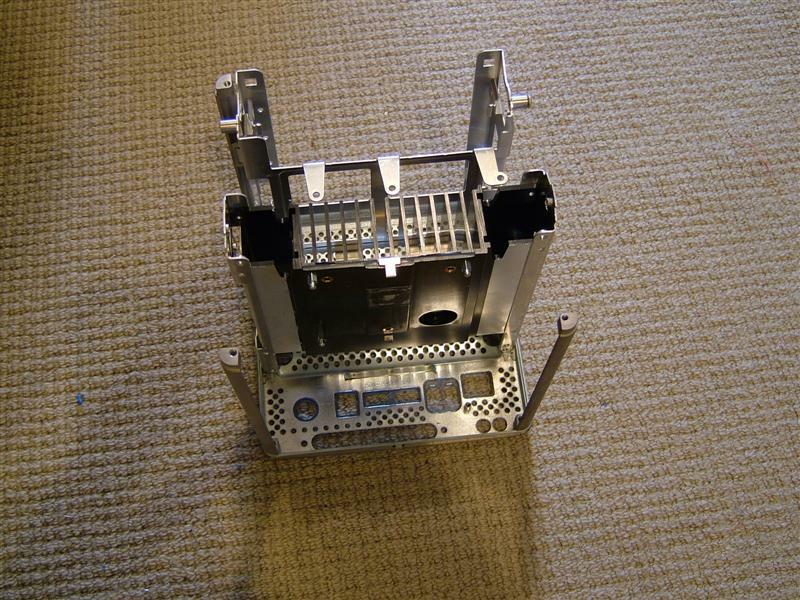 My original plan was to do a smaller version of Project Mini Me which was a shuttle flex atx sized based project. I liked this idea but I couldn’t decide what to do with the externals to make it nice. The plan was to spray paint it but after Project Little Devil I’ve had enough paint fumes in my lungs over the last few weeks to last me a lifetime hehe. 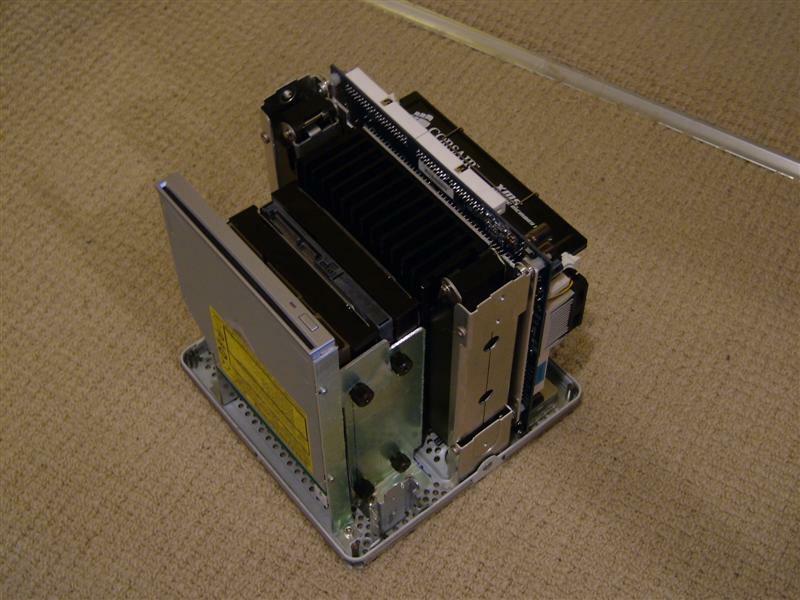 So I set about trying to find some other idea, I stumbled across Sun’s Cobalt Qube 3 these would be great to convert into a file server. The only problem is they go for far too much money on ebay to make it worthwhile. 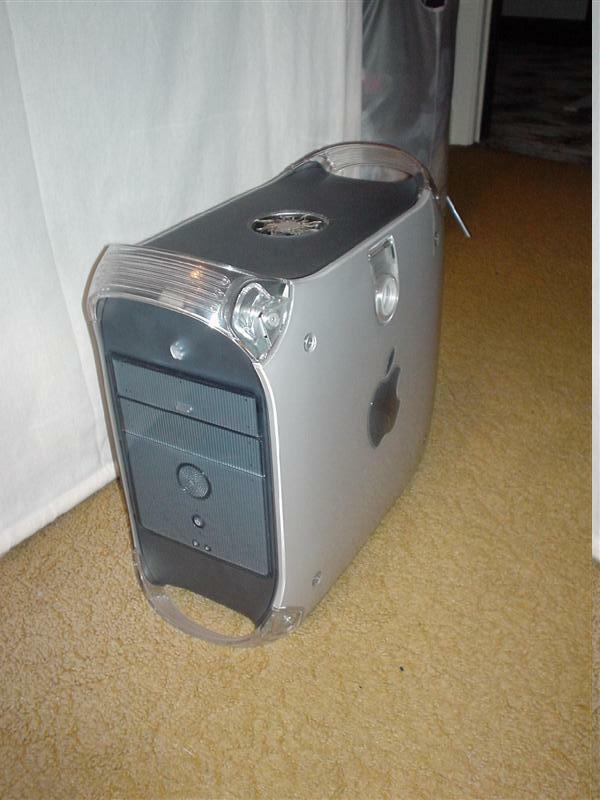 Now with my current Apple switch in progress I was having a look at older mac’s on ebay to see what we could sell my girlfriends Powermac G4 for. 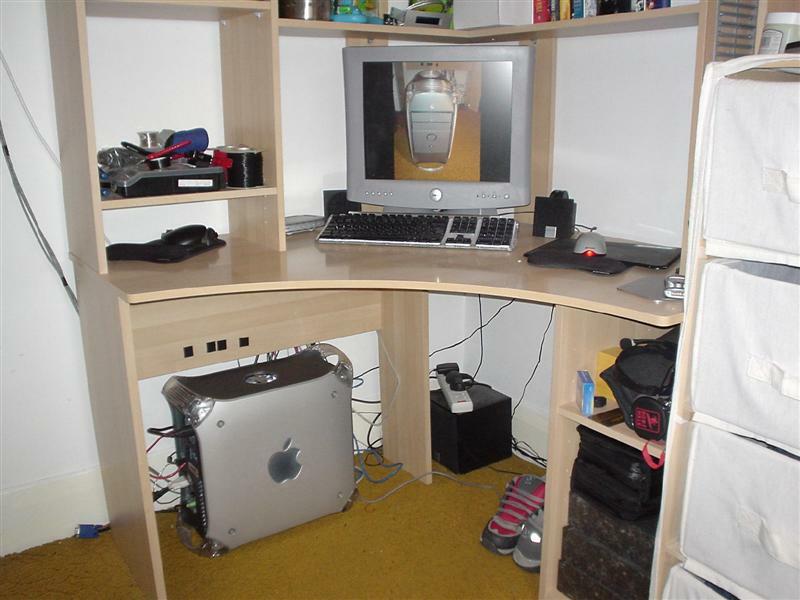 When I did this I stumbled across some mac cubes. 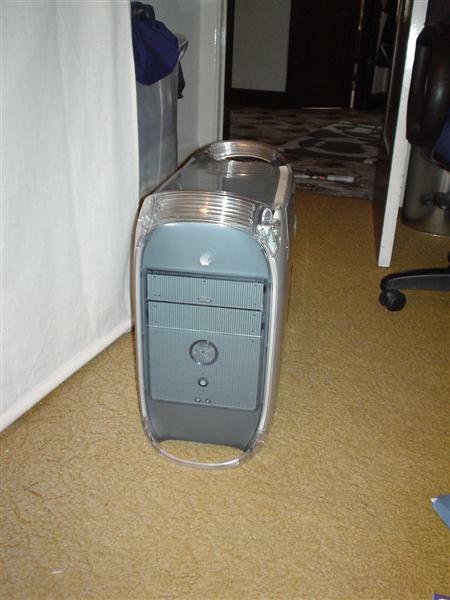 They are Powermac g4’s crammed into a cube space. 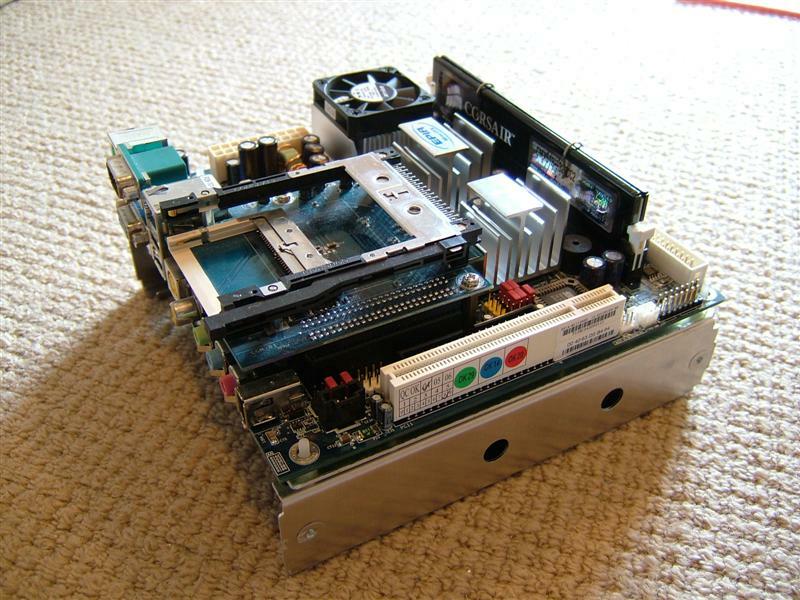 These were the very first SFF computer and are still ahead of the current sff’s in many ways. 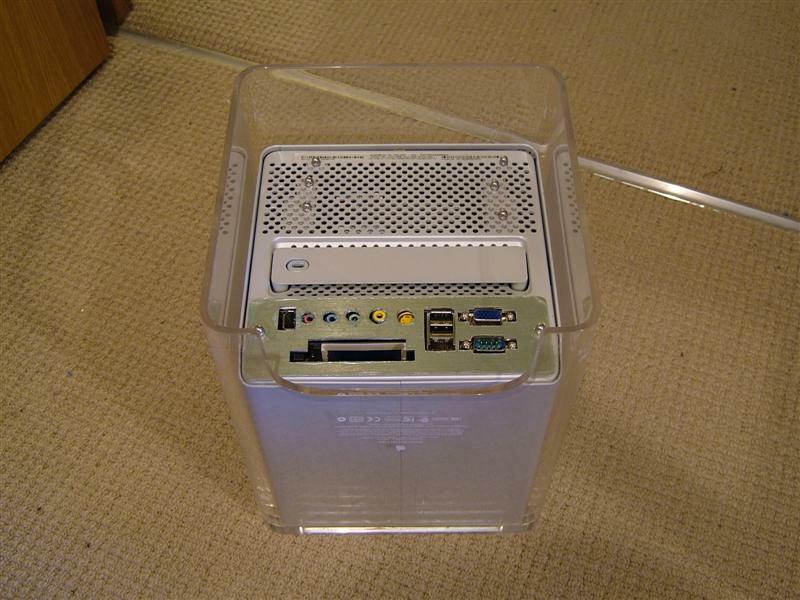 I’ve spent the last month or two trying to find a well priced Apple Powermac Cube and finally I found a great donor case. 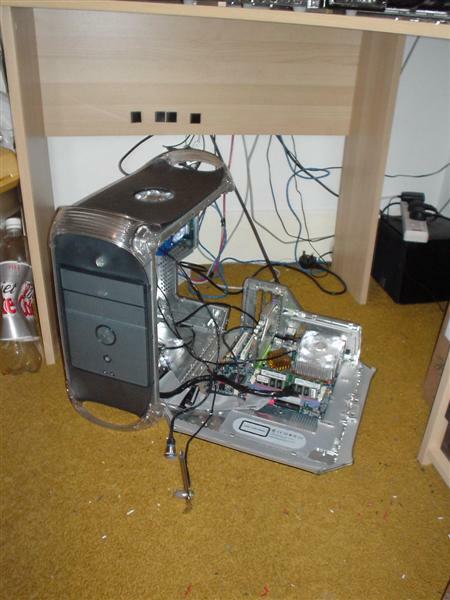 It was a incomplete cube with just the motherboard , cpu and psu included. This suited my needs perfectly and after a short bidding war I won the auction! I picked up the cube two days ago from the courier and set about taking it apart. 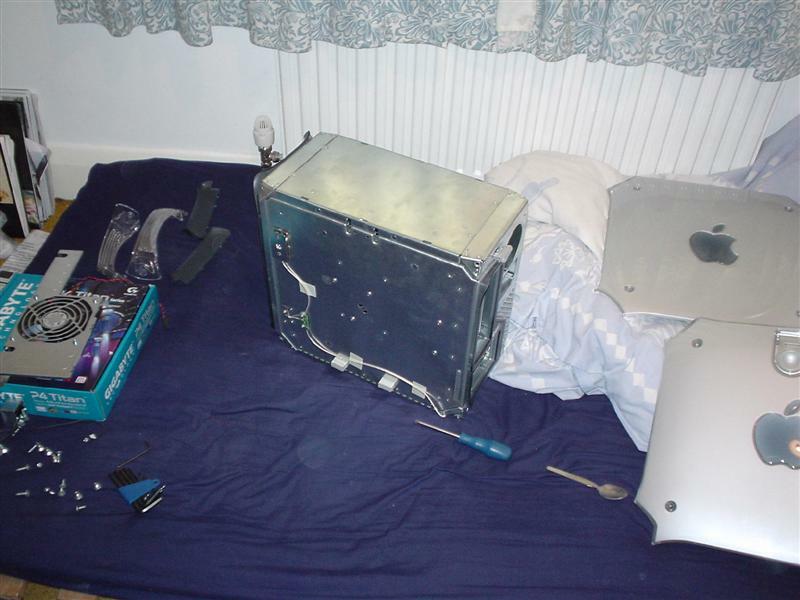 I realised the previous owner had really abused it when removing some of the components, the inner chassis was missing some parts and others were damaged grrrrrrrr. 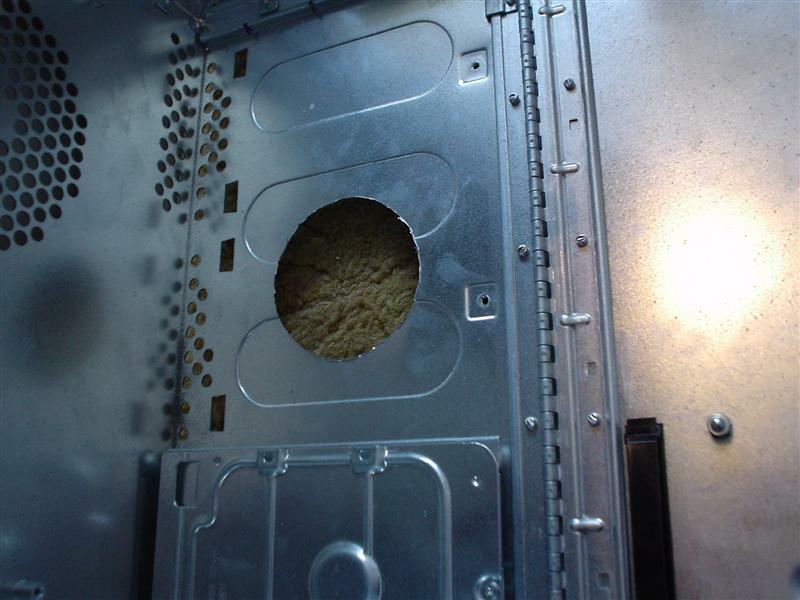 It didn’t bother me too much as I wouldn’t be using most of the insides anyway. I started taking the cube apart which is no easy task, the cube drew blood in my battle with it but I finally got it into is components. 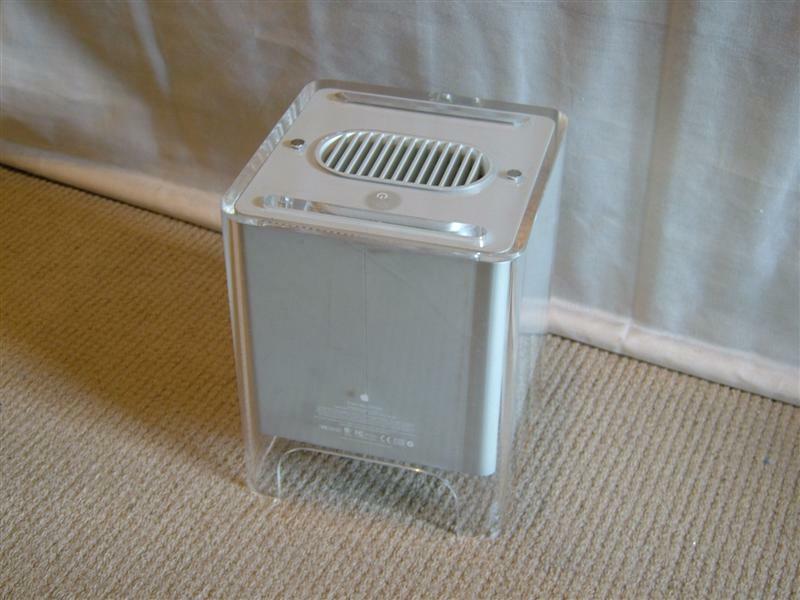 The perspex has a few scratches and has some dirt so it needs work but for the most part its in excellent condition considering its age. I’ve taken out most of the parts I won’t be needing now here’s the parts I will be using. including the very clever handle and locking mechanism which is going to be hard to use but worth the effort. 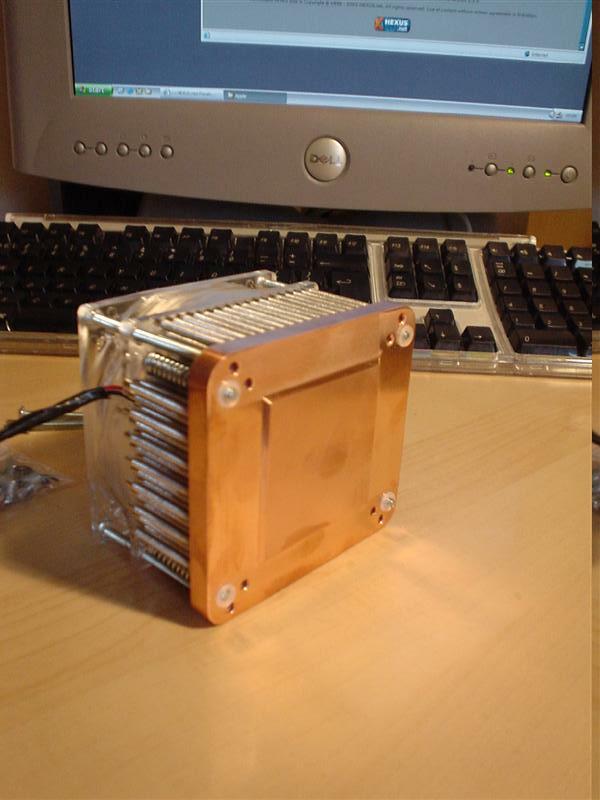 The black item in the first picture is the heatsink believe it or not! Its massive and a structural part of the chassis. So I will have to make something up to replace it as it takes up too much room! 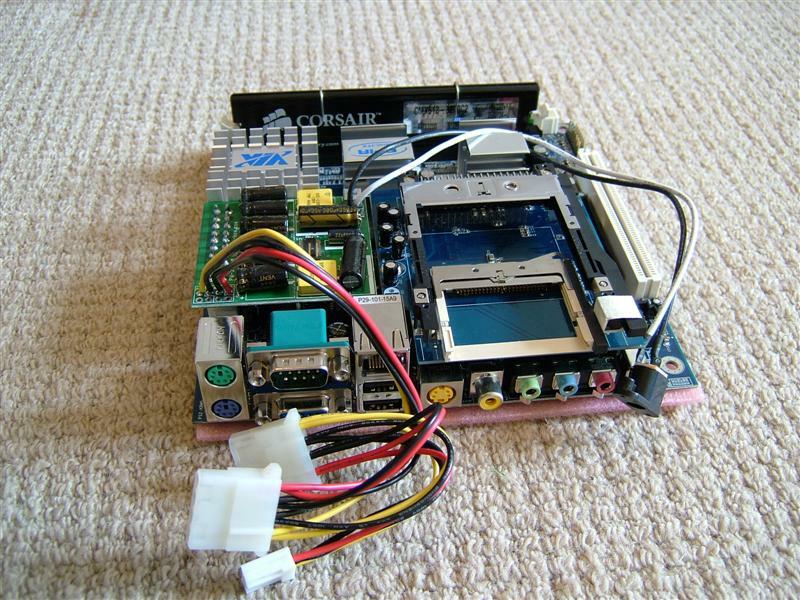 The original cube is very well built the motherboard is amazing its very nice indeed. 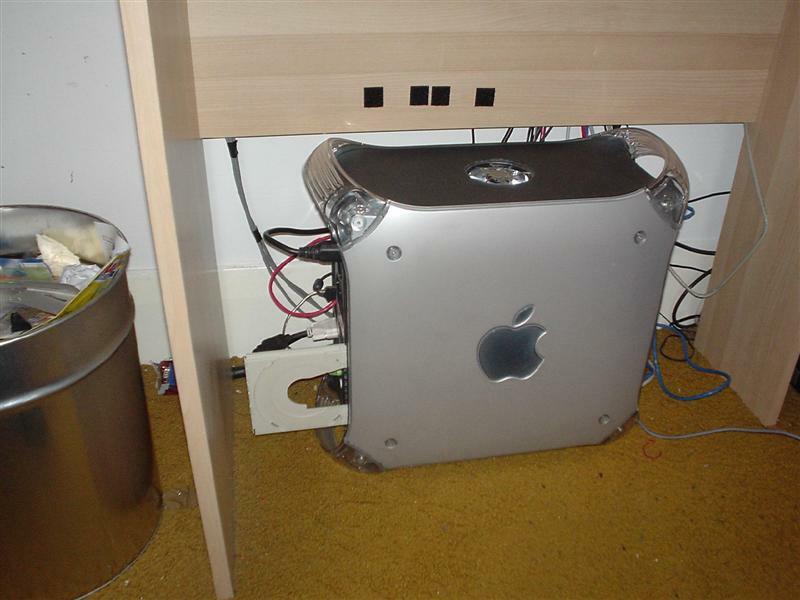 How they shoehorned a fully working g4 in there all those years ago is amazing particularly when it was running 100% passive. 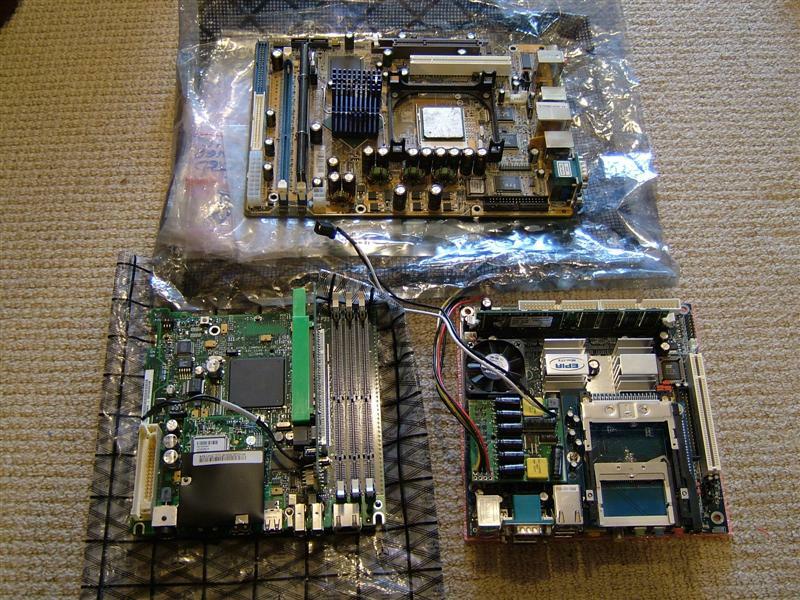 Here’s a couple of final shots of the motherboard to compare it to the mini-itx board that will be replacing it and a shuttle motherboard for comparison. 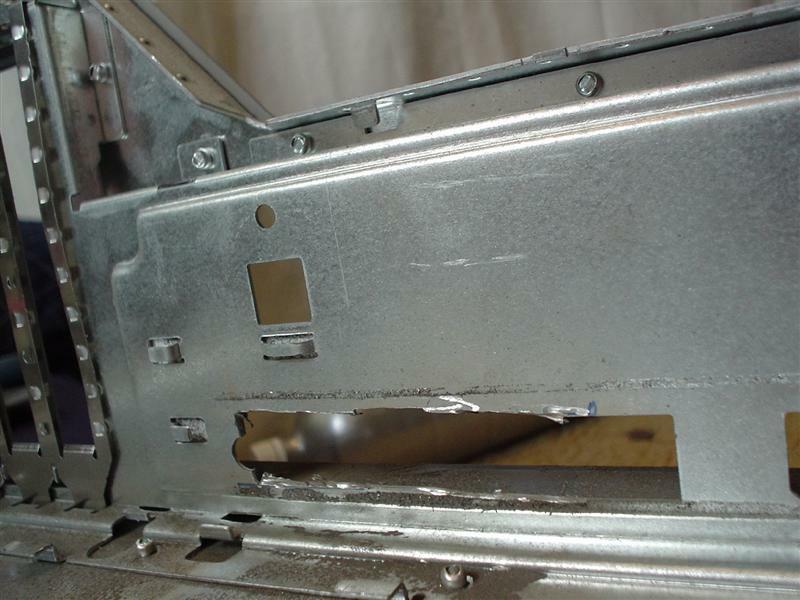 The first task for me to complete was to replace the missing top chassis plate , I’ve started work on cutting and bending a piece of aluminium to replace this section. 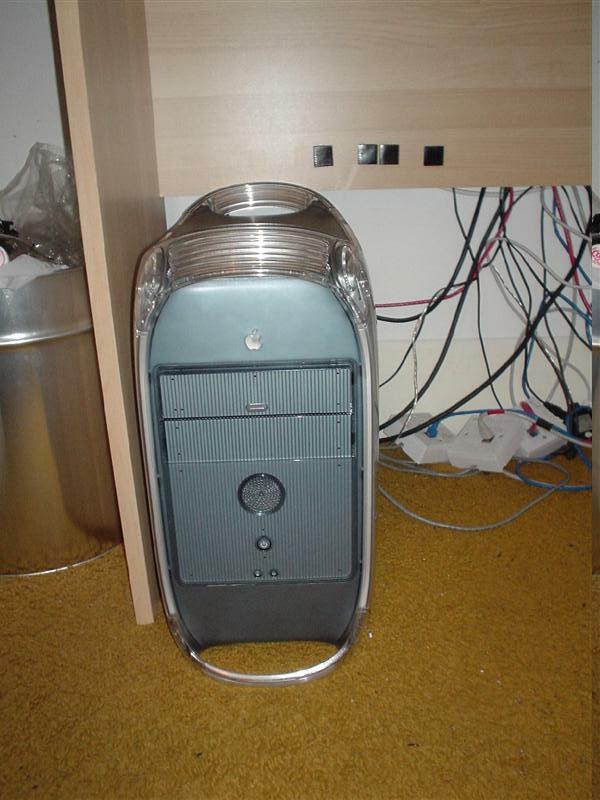 After that I need to find a way of replacing the huge heatsink to allow me too shoehorn 2 hard discs in there. 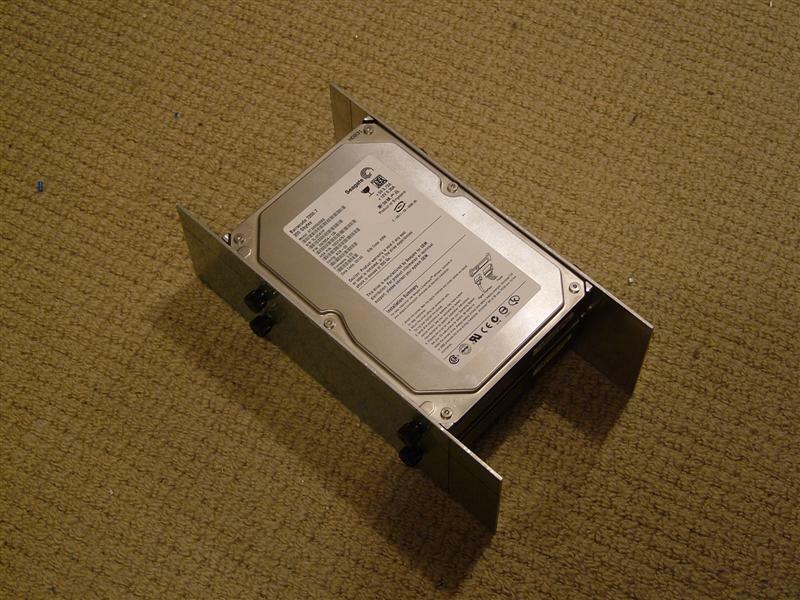 I ideally want 500gb of storage in the cube so I will use 2 x 250gb ide hard discs along with a laptop combo drive for optical storage. I hope you like the project so far let me know what you think. 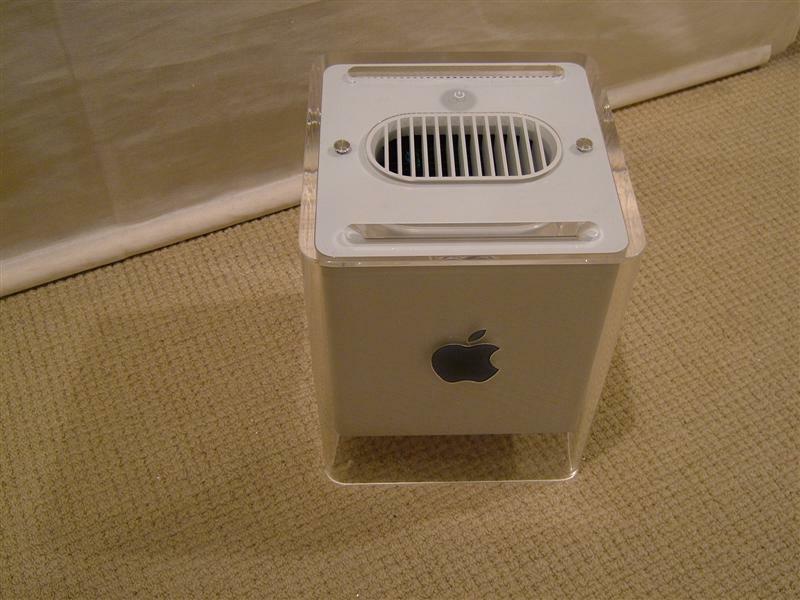 Project Mac Cube: First update modding with Ovens! Well its time for the first update on this project and its something I don’t normally do thats for sure! 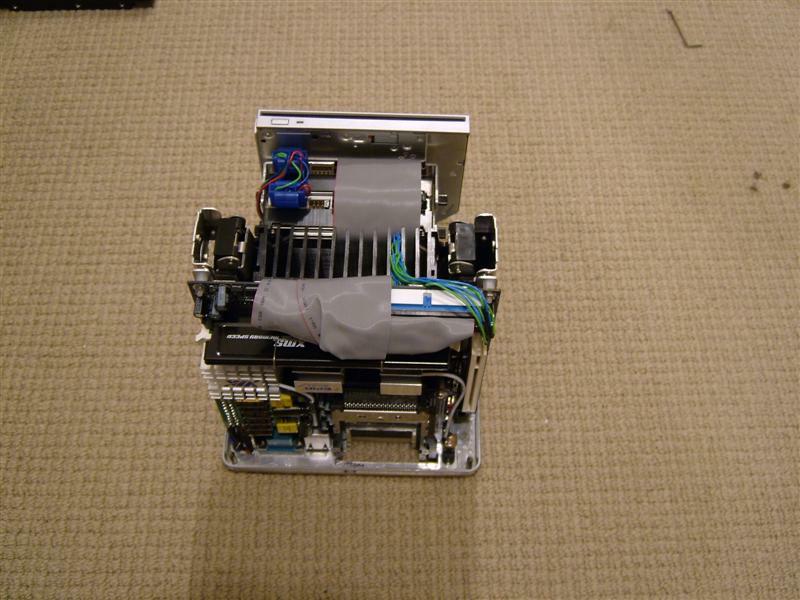 I had a play with the internal layout and I worked out that I can fit 2x hard discs and one laptop optical drive in the cube chassis whilst still using the heatsink/structural element with a few changes. The advantage of this is that I dont have to machine a whole new structural element. It would be a nightmare to recreate. 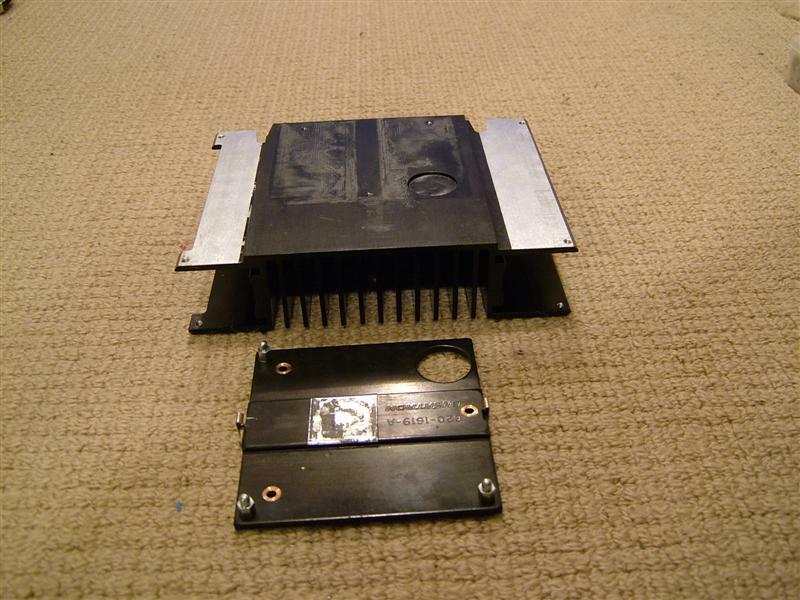 The only issue was that the bottom section of the heatsink would have to be removed. You can see the bottom section in the second picture above. At first I thought it was screwed into place but I quickly realised it was soldered in place. 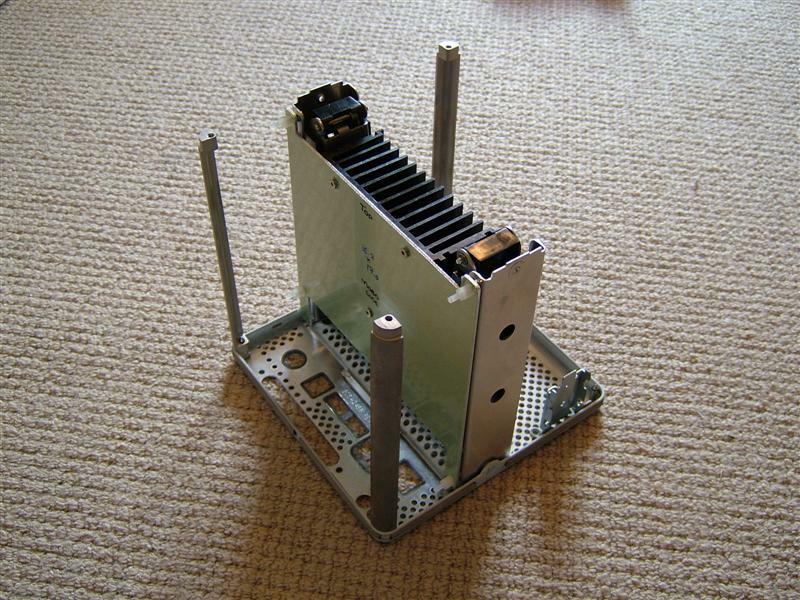 This gave me some second thoughts on the idea but I came across the idea of heating the whole heatsink till the solder melted…. 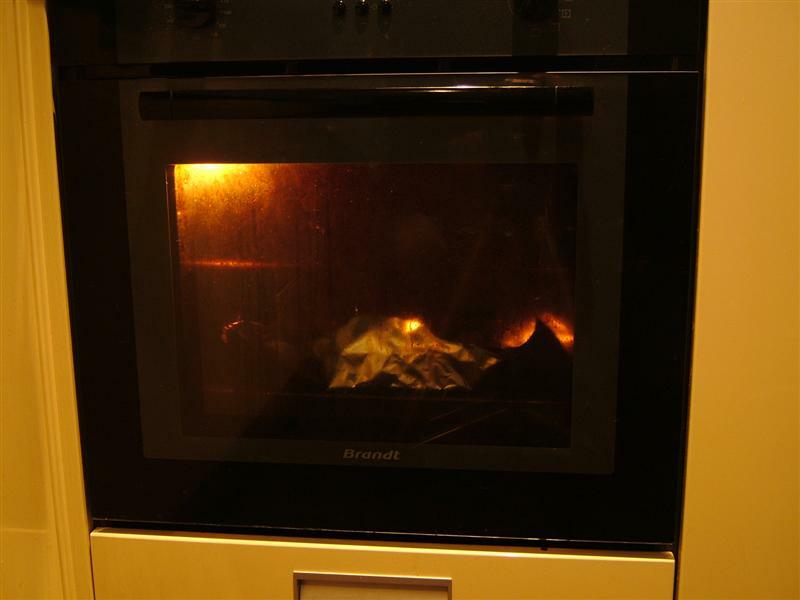 So for the first time ever for me I had to use my oven for modding 280 degrees of modding power hehe! 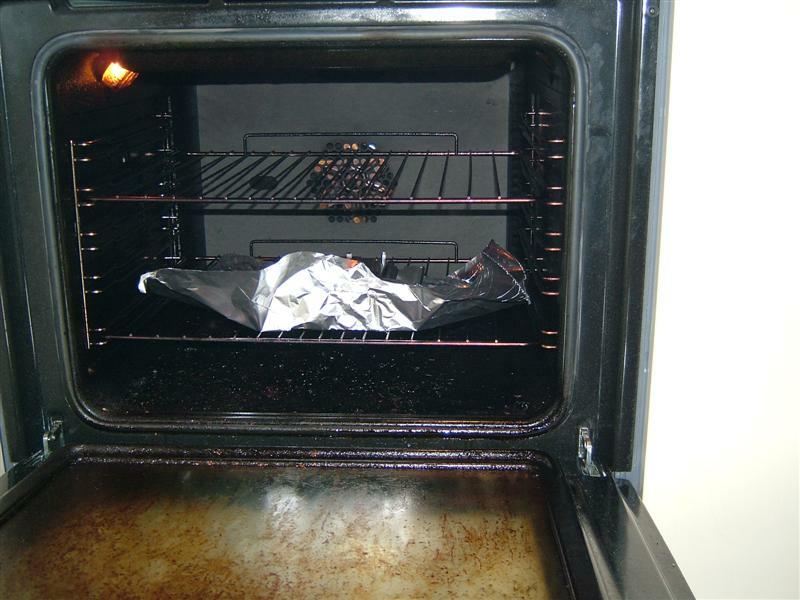 I wrapped the heatsink in foil to save my oven, apologises for the sorry state of the oven its in desperate need of a clean hehe. After five minutes in the oven the parts fell apart in my oven mitts! 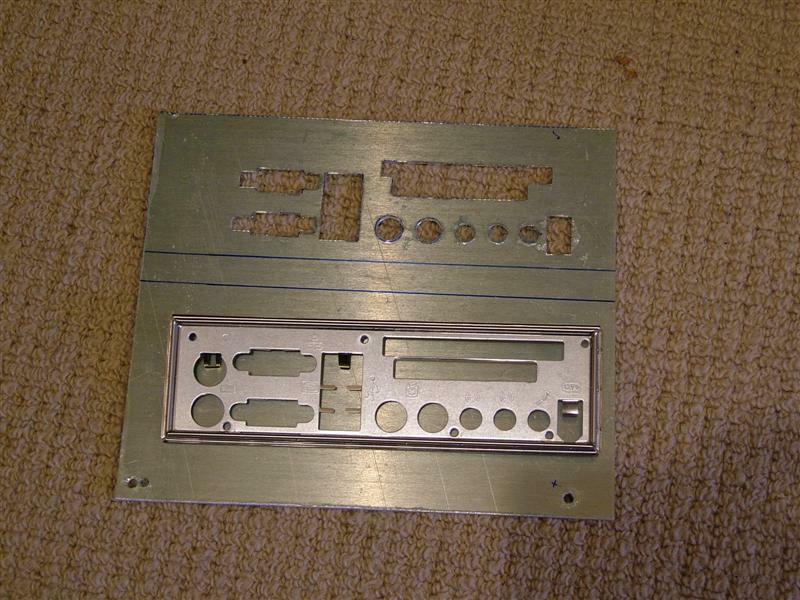 I’ve also started to create the new top chassis plate along with the motherboard plate. 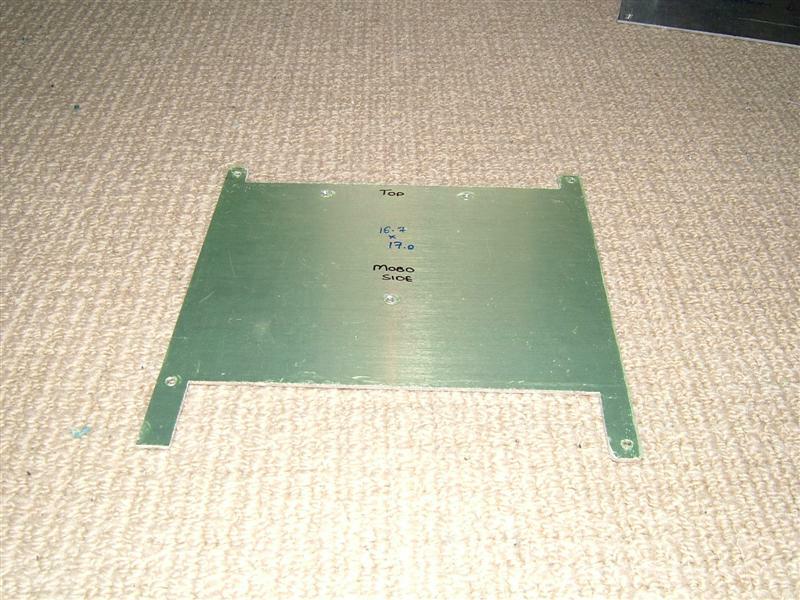 During the creating of the motherboard plate I discovered that the chassis is 16.7cm thick on the base and barring in mind the dimensions of the motherboard is 17.0cm that creates a small problem. 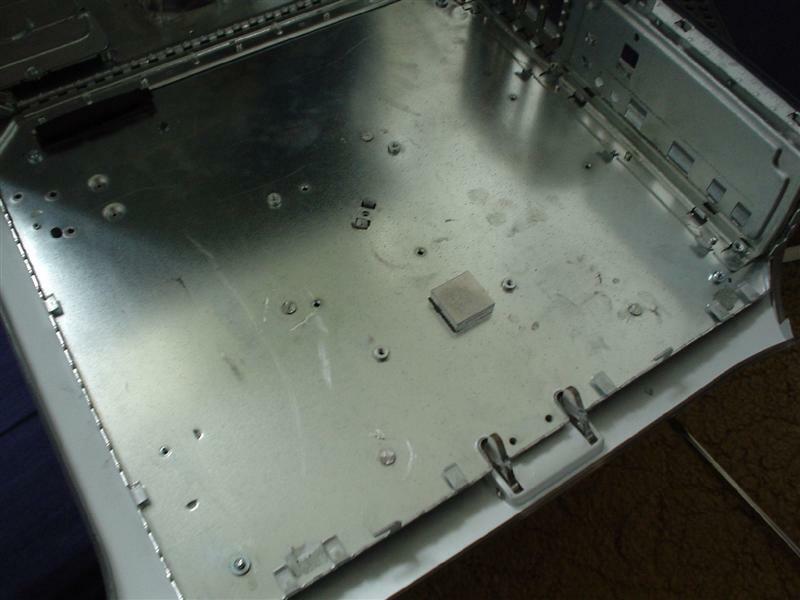 I will have to sand back the area where the motherboard will fit to squeeze it in. I’ve not taken any pictures of the plate so far, but I will do that tomorrow. I’ve had a chance to do a few more bits on this project, first thing to do was to make a motherboard tray after a couple of different designs I got one that worked. 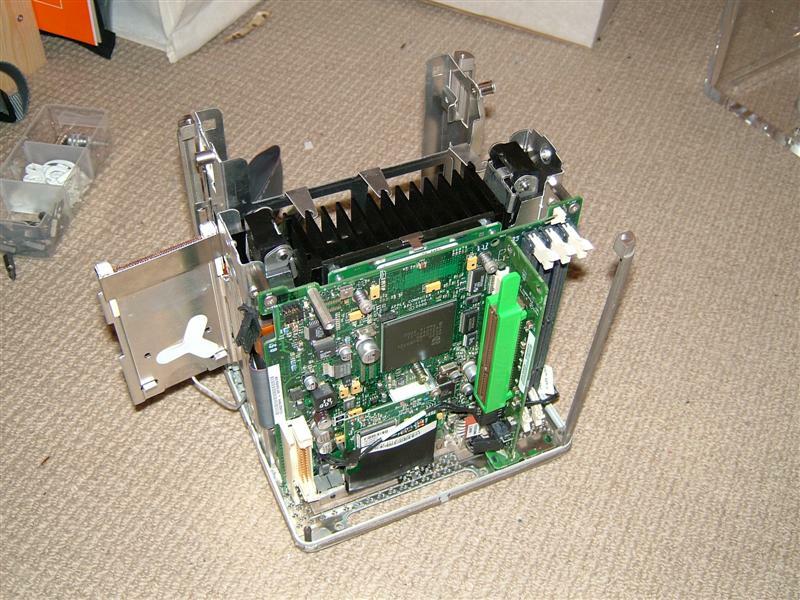 I had trouble finding a method of fitting it to the heatsink whilst still being able to mount the motherboard standoffs. I realised the best way round this was to use existing threads and I found three in the middle of the heatsink and even more luck they were m3 threads! 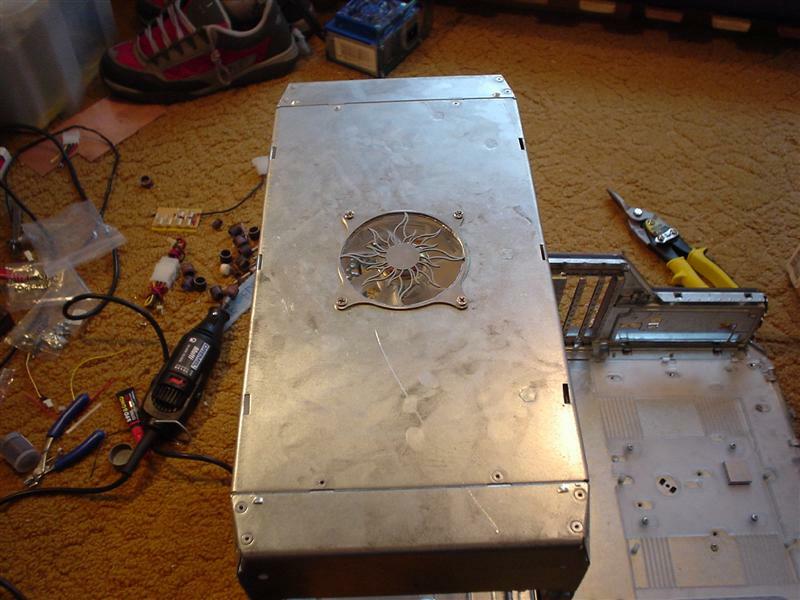 So I went about putting the heatsink and the handle mechanism back together this was far from easy! 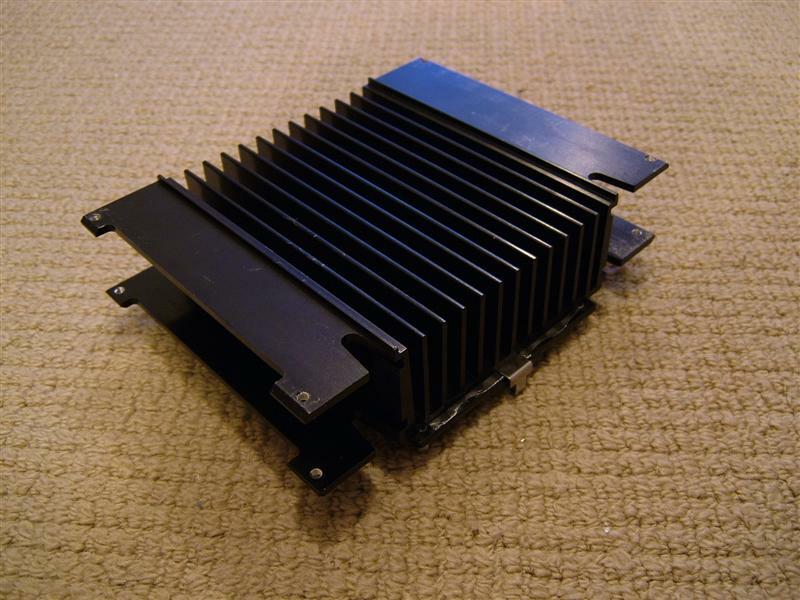 Then the motherboard tray was attached to the heatsink. 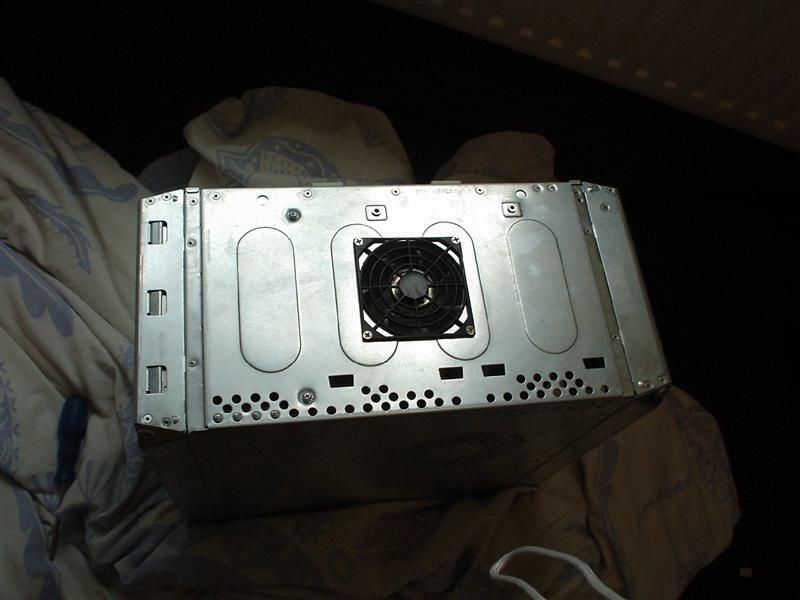 It sits flush to the heatsink which will help cooling I hope. With the motherboard in place it works a treat. 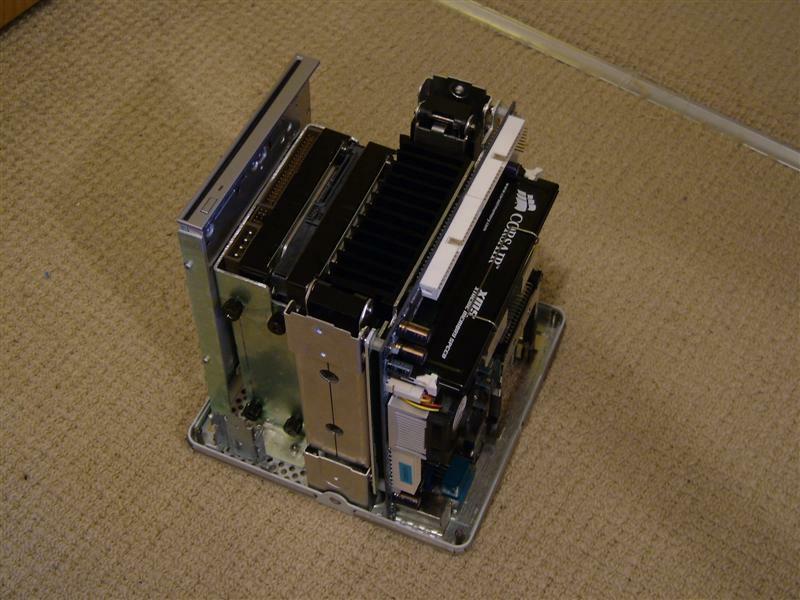 I then did a test fit of the heatsink/motherboard tray combination and it fits perfectly. 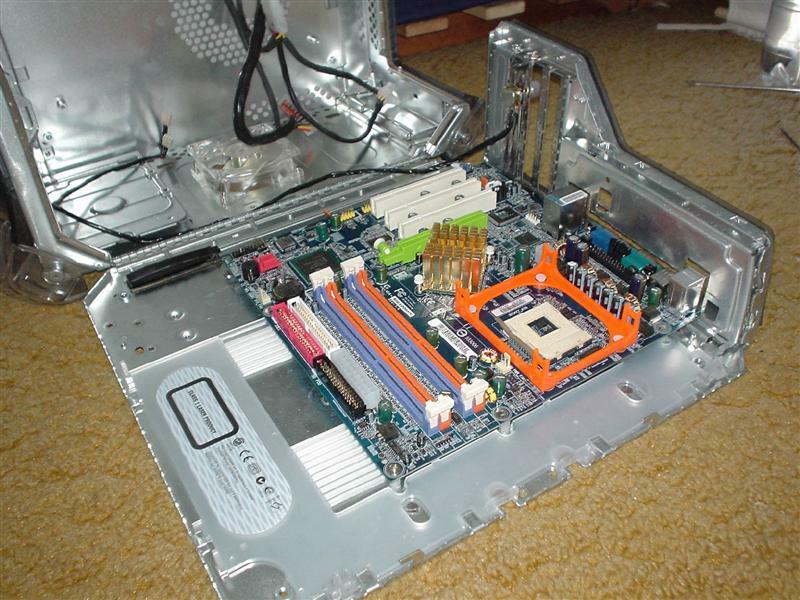 I didn’t test fit the motherboard as it wont fit without the port cutouts that was next! 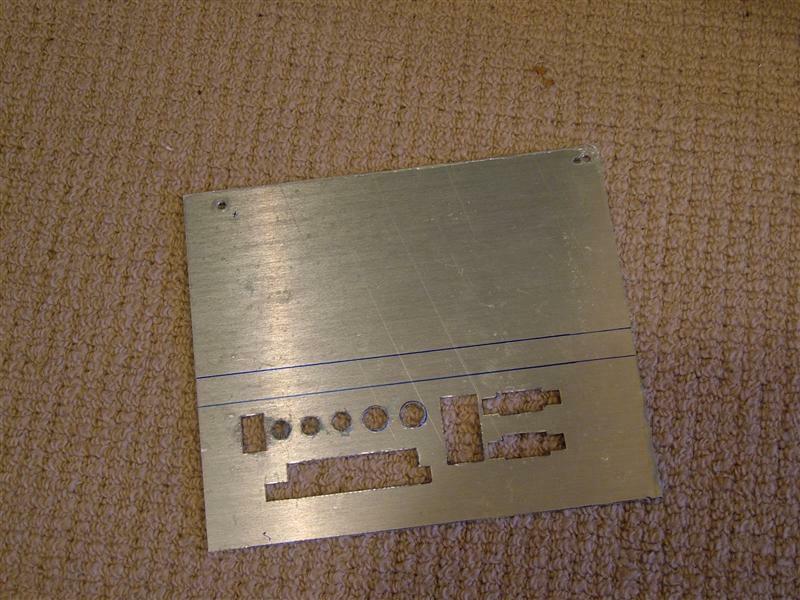 I’ve started on cutting a rectangle into the chassis, I used a nibbler tool which takes little “bites” of metal so its great for this sort of thing. The only problem is that it gives nasty blisters without gloves and I hate using gloves grrr. I’d forgotten how hard steel is compared to aluminium this was hard work. It needs finishing yet but a particularly nasty blisters has stopped me for the day. Thats all for today I hope to get the motherboard into place tomorrow and then finish up the motherboard tray. 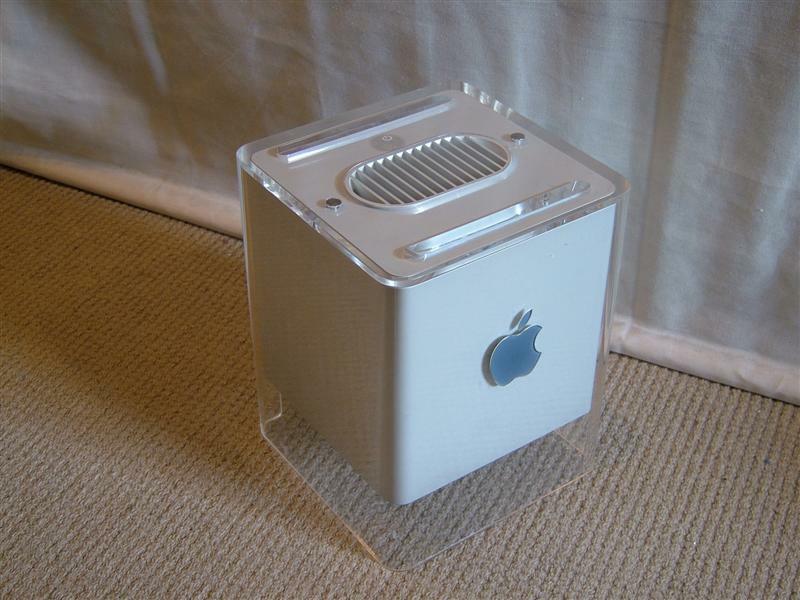 After working on project little devil mainly over the last week or so it was time to get back onto Project Mac Cube. I’ve made some real progress over this weekend. 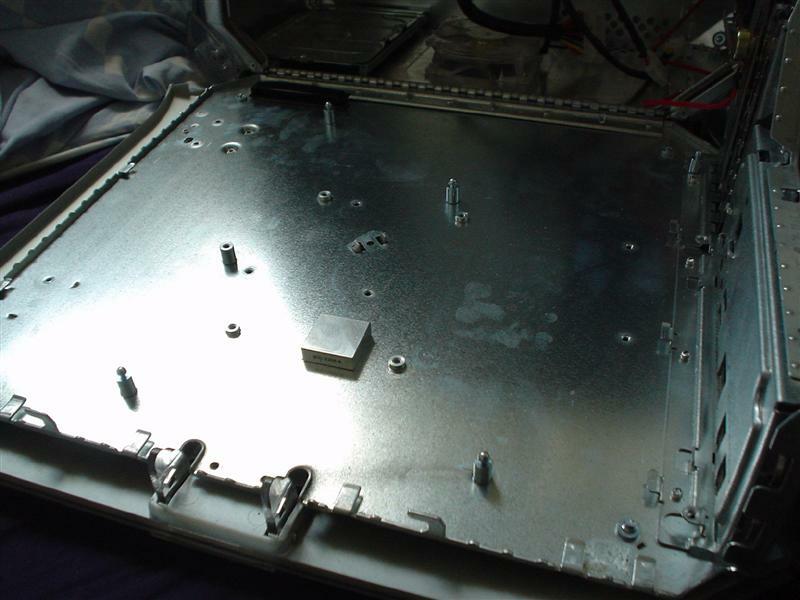 The main task was to get the optical drive and two hard discs mounted onto the chassis, along with making a blanking plate for the motherboard ports and stuff. 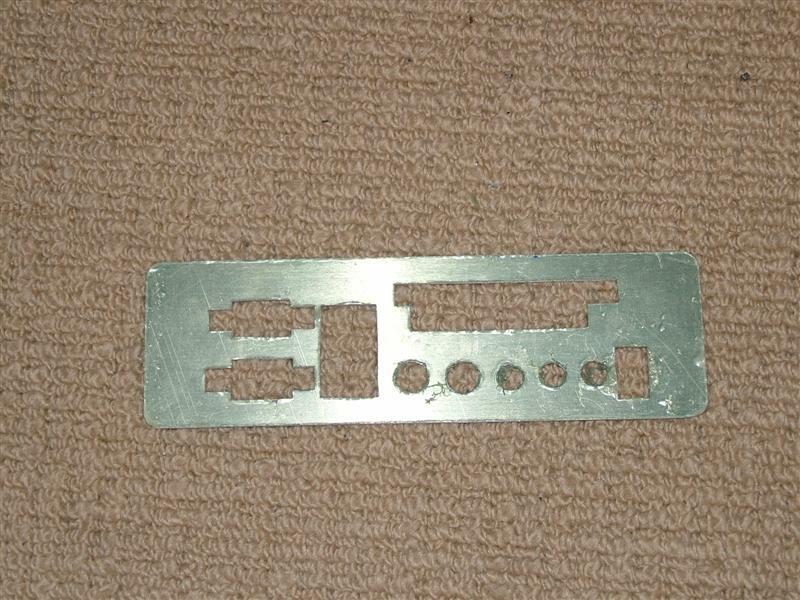 The first thing I made was the blanking plate, for this I used the proper one as a template to make a copy out of aluminium. I used a nibbler , a drill and a set of needle files to create it. 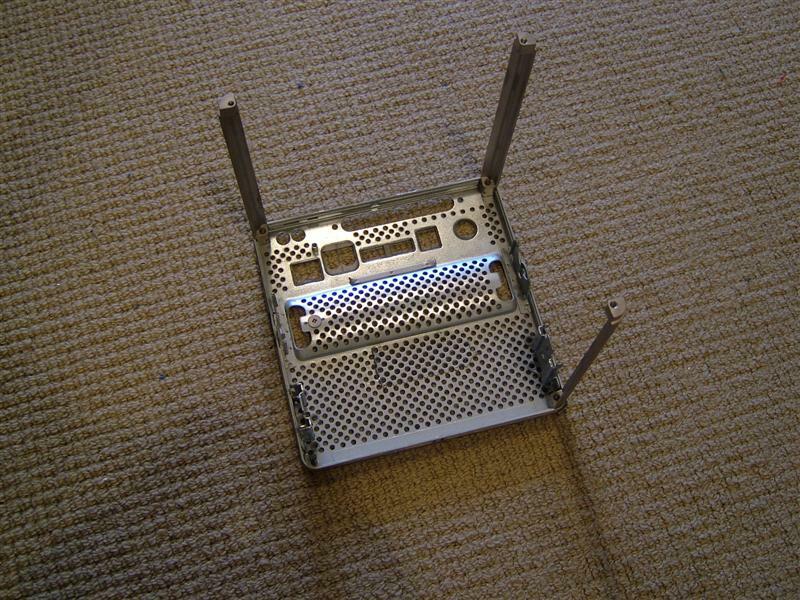 I then sanded back the interior of the chassis to gain the 2-3mm I needed to fit the motherboard into the chassis. I did a quick test fit and it was perfect. As you can see the two ps2 ports are blocked but I don’t have any use for them so I’m not bothered in the slightest. 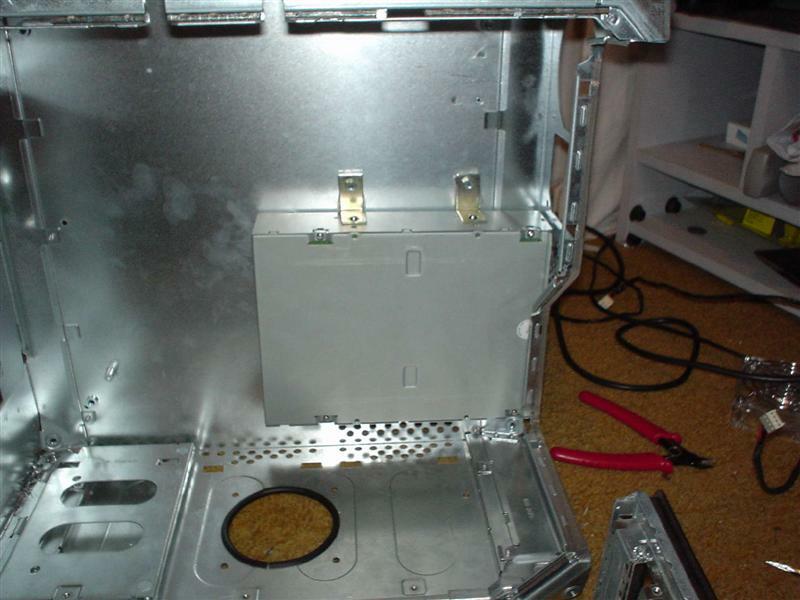 I then mounted the blanking plate for a test fit. It needed a bit of fiddling with but now fits perfectly. After this I set to work on the mountings for all the drives this was far more work than I imagined. At first I tried to make it as simple as possible with all 3 drives held in by just two brackets. 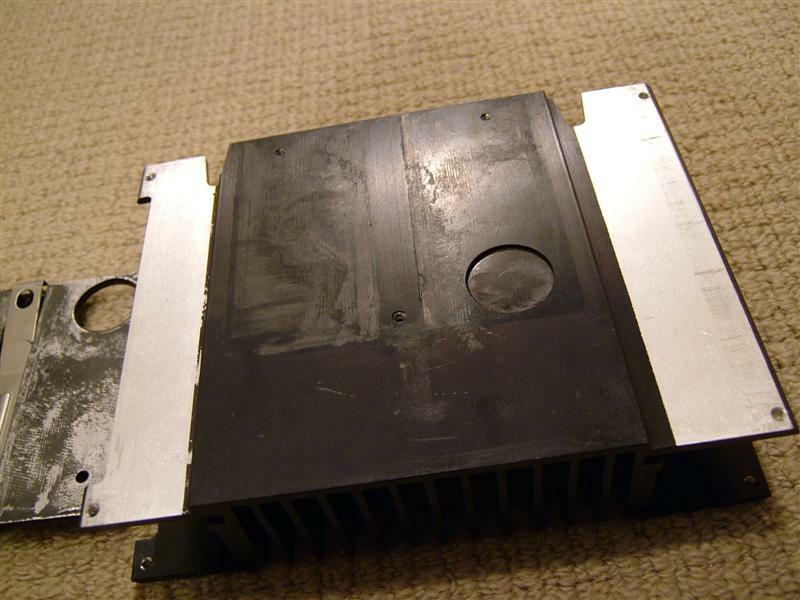 So I had to make set of plates for the two hard discs and a separate mounting for the optical drive so I could place it centrally without having the two hdd’s off center. 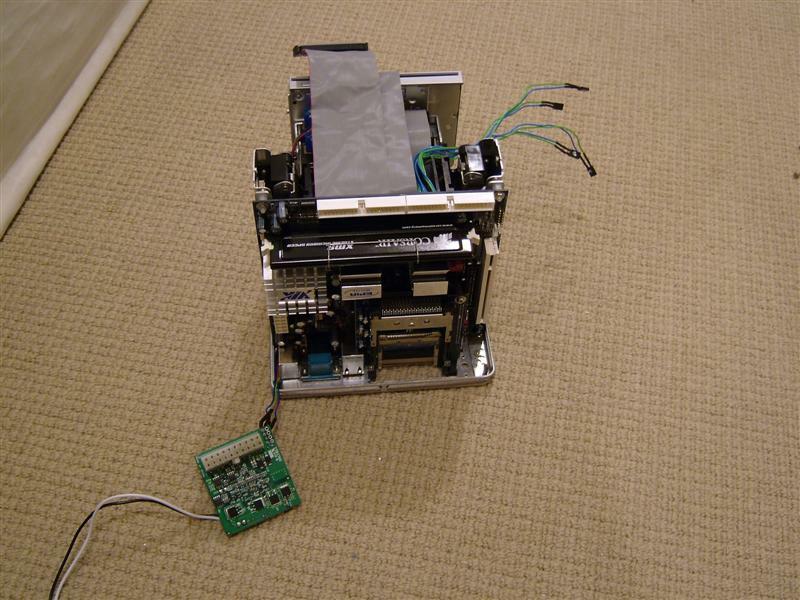 In order for the optical drive to be mounted correctly I had to use three brackets but it works perfectly and the drive allows you to insert a disc when dropped in with no problems yeaaaah! Its a cosy fit with everything in place but when I did a test fit into the cube chassis it works perfectly! You can see the original handle mechanism is still working you whip the cube over and push the handle in and it pops out. Then pull the inner chassis out. A great design. This works just as it does in the original. Thats the progress to date, next up on the list of things to do is to mount the power switches and led’s and to look at the cabling. 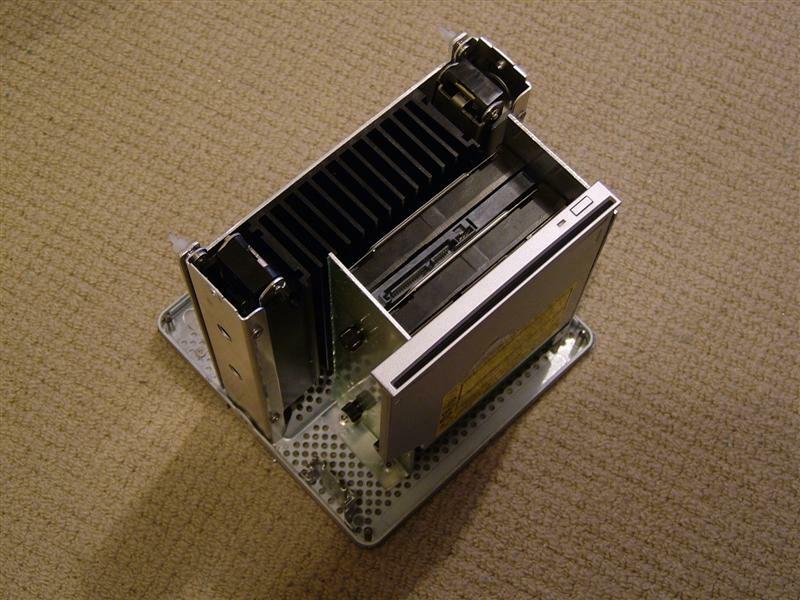 In the original cube design there is a plate on the top of the inner chassis. I’m not sure if this is actually needed other than to hold the power switch in place so I’m going to look at what is actually required. 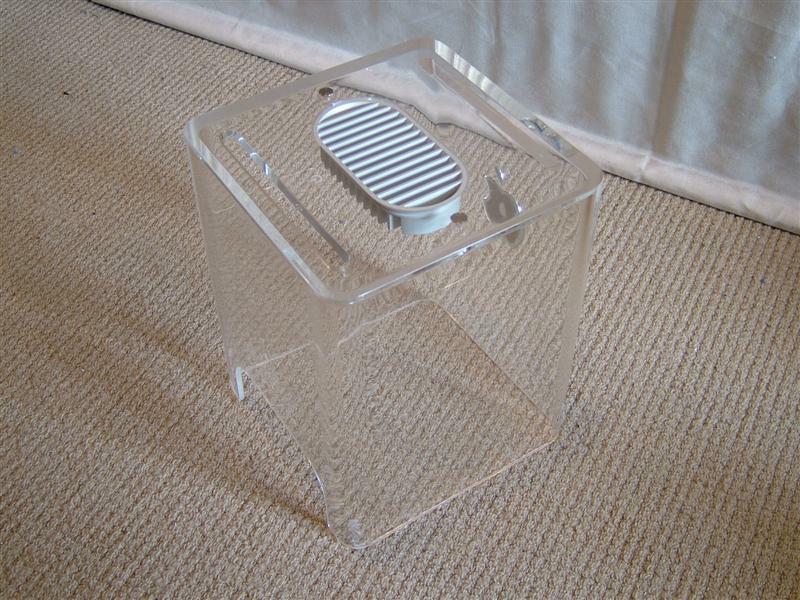 The cube came without this piece so I’m going to have to make my own if I do want to use it. This project hasn’t had an update for the last few days or so because I’ve been waiting on parts and hit some problems. Last time I had completed the wiring rigs with some nice blue cable, this was fine until I tried doing a test fit of the cube and the wiring rapidly became a nightmare. 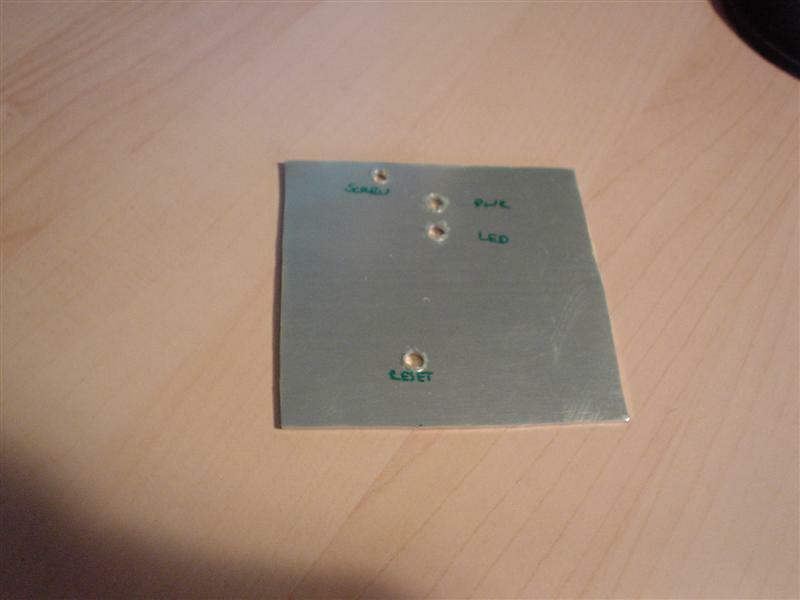 I also created a plate for the switches and led’s to fit into. 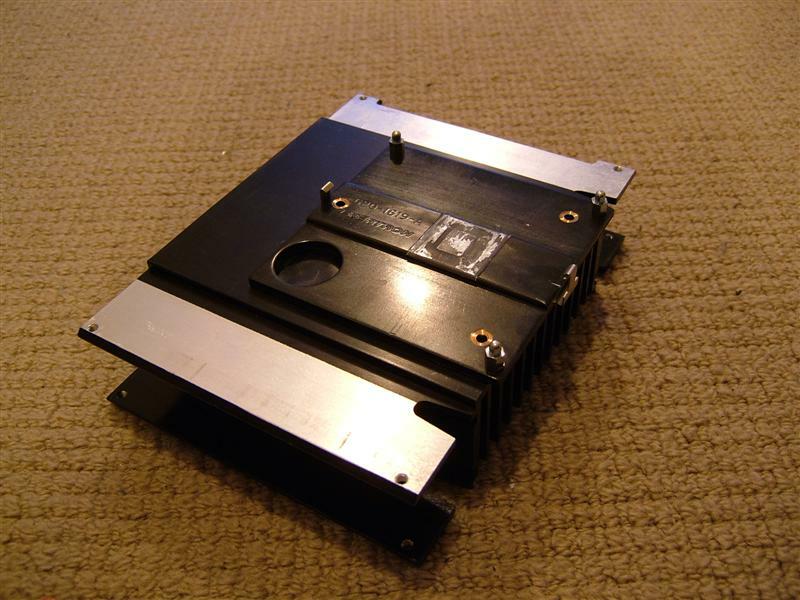 I wanted to use the chassis itself, but drilling the led holes showed that that wasn’t possible so I created a little plate to go onto the chassis like the motherboard I/O plate. In order to fit the wires for the switches in I had to redo the wiring loom with far thinner wire. I used some nice blue and green wire but I wish I could use the blue see through stuff but it cant be done. 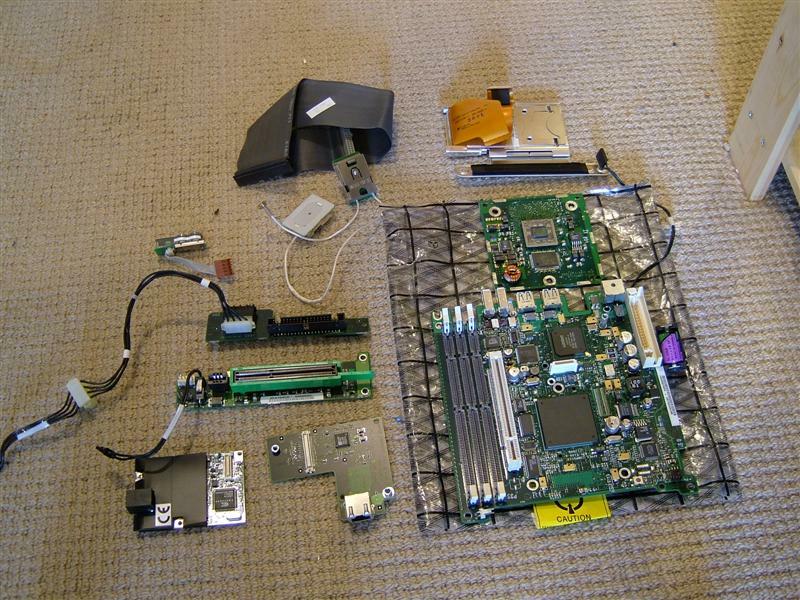 So I had to go back to my original plan of a VIA Epia MII6000 board. 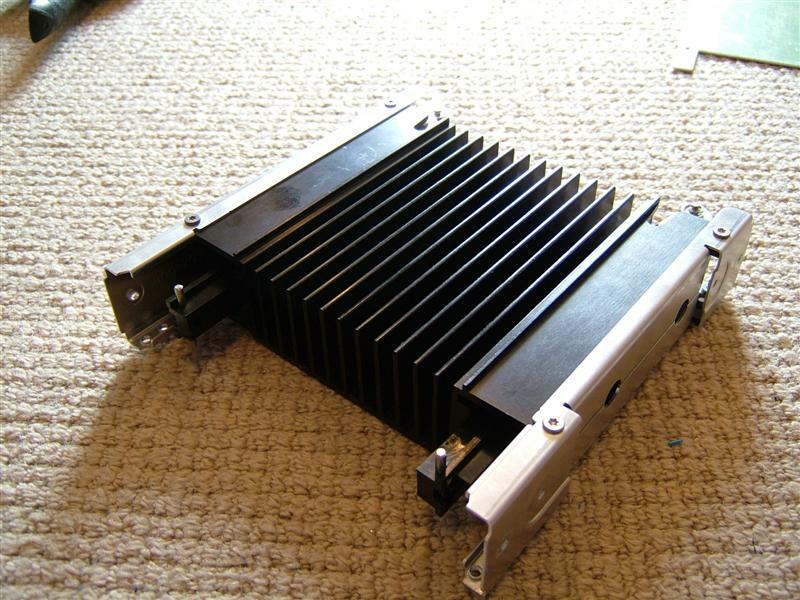 This is identical to the one I was using before but only 600mhz and passively cooled. I also got a new plug in psu for this board. I takes up no more room that the mini-itx board does already. I’ve got a few more bits arriving over the next couple of days, I will redo the wiring to try to make it more managable. I’ve worked out that the wires will fit if I use the smaller wiring so it should all be easier this time. Ok a short text update on my progress pictures will follow tomorrow. The first thing is that it is now on and booting! The end is near! 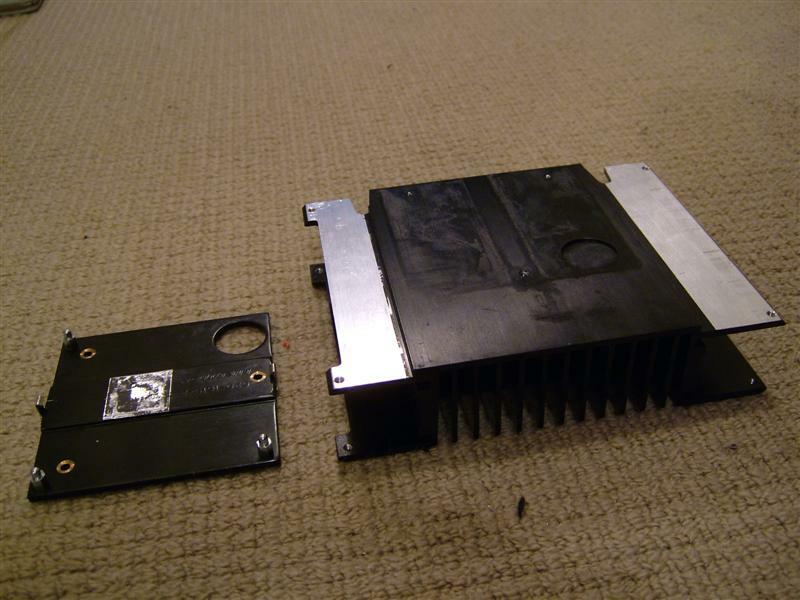 I’ve had a few problems since my last update, the first was that the I/O I made was made worthless as the psu manufacturer decided to change the connector design grrr, So I had to remake the I/O plate with this change. Next all the wiring was redone to allow me to fit it all in. Making all the wires fit took me several hours this evening but I got there in the end! It booted up on first try (thats a first for one of my projects hehe),but I’ve hit a snag the two 250gb drives are being detected as 137gb drives 🙁 I believe there is a solution using partition manager so I will have to see if it can be overcome. So far the cooling seems to be fine its not getting too hot but I will have to monitor this when I get it fully up and running. Time for the pictures. I’ve not got any shots of it hooked up yet but it looks ace. I’ve been out since 5am so I’ve not had a chance to do any proper in situ shots yet. I also need to play with the power led as its lighting at present. 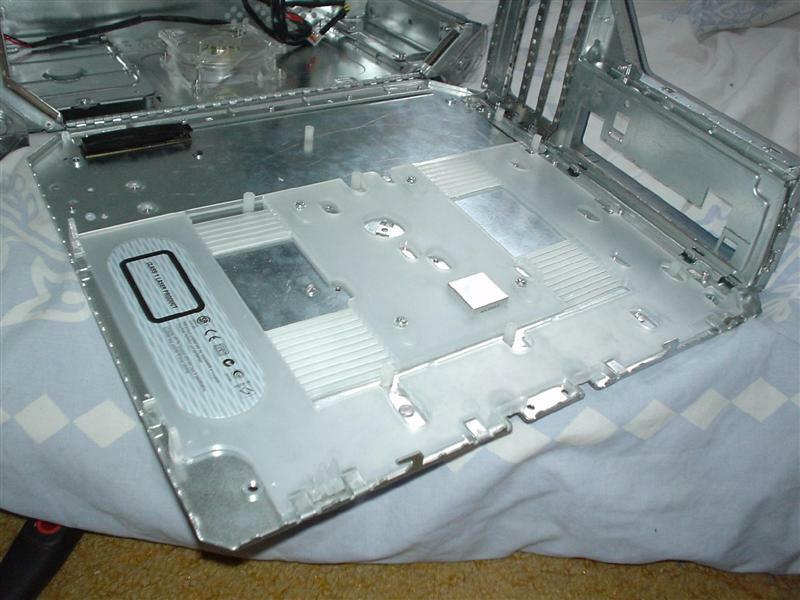 Pictures of the building and it all inside the chassis, the wiring is mostly hidden from view when you remove the inner chassis. Just the bare minimum shows. Now that the project has been completed I have taken some more shots of the cube in place on my desk as well as a couple of other shots. I’ve also done two video’s one of me removing the components from the cube to show how easy it is and another to show the cool effect of the leds. And the two video’s right click and select save as to download them. Well, WordPress keeps getting better, I’m now using the iPad app. This makes updating the posts a real breeze. Hopefully this will mean more updates in the future! 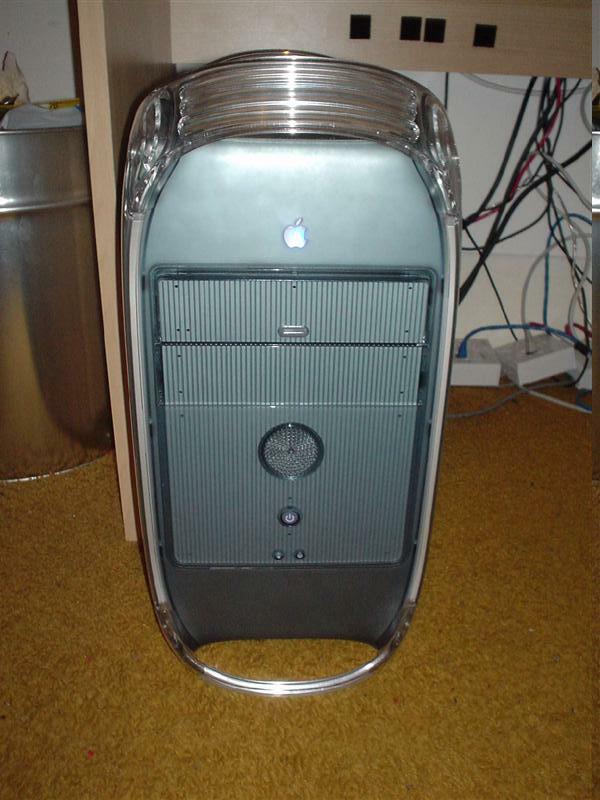 Apple computers have for a long time now led the world in design. 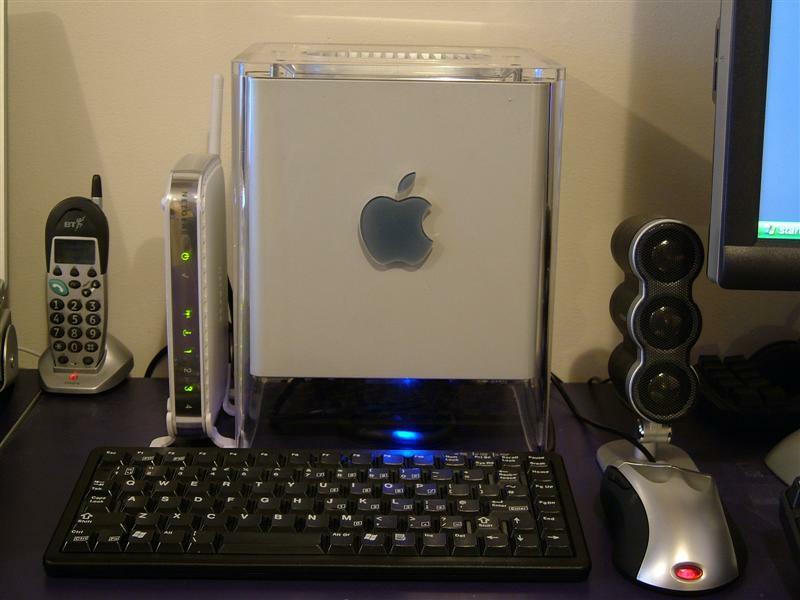 They were the first mainstream manufacturer to make a pc look any good. They rewrote the rules for the beige box. 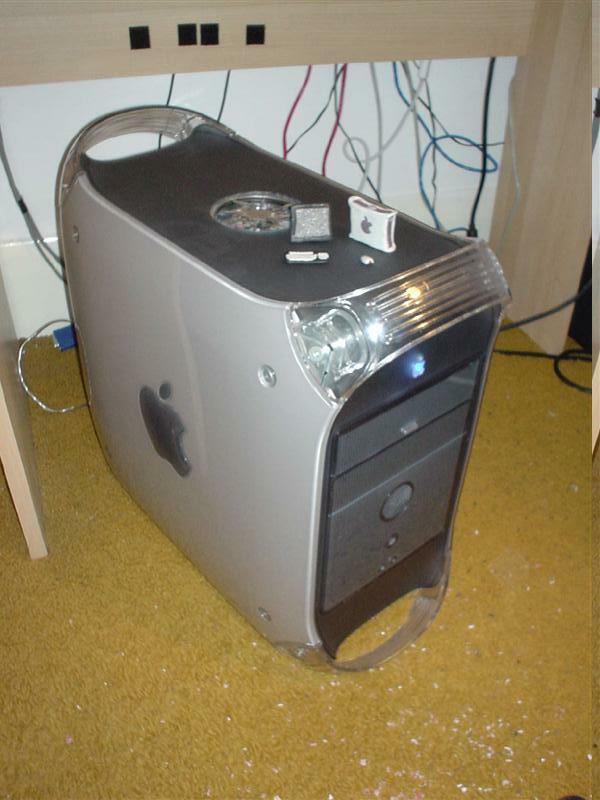 To get a pc that looks as good as a Mac is quite hard even nowadays. 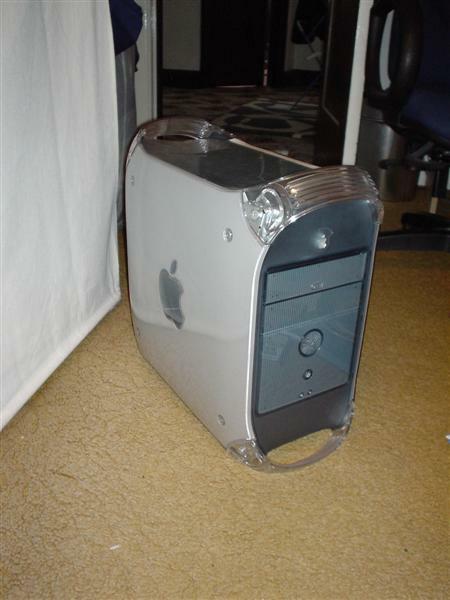 I’ve long been a fan of the G4 case and was determined to get hold of one for a project. After almost 2 years I finally got my wish. This article will describe the route I took to complete the project I named ‘Project Bad Apple’. A Quick Note or Two. This project guide is going to be slightly different to the normal project log: it is going to be very text heavy. A picture speaks a 1000 words and its much easier for you to get the idea of what I’ve done with them. I took well over 300 images during the build I have used the best ones. I’ve tried to explain how I did everything in the most obvious order not in the order that I did it so if I get confused about the time sorry. If you intend to copy or repeat any of the mods described in this article please be aware some of them have inherant risks and should only be undertaken if you know what you are doing. Please note I take no responsiblity for any damage to parts of persons as a result of this article, sorry we have to cover our backs nowadays. (Mumbles something about lawyers). 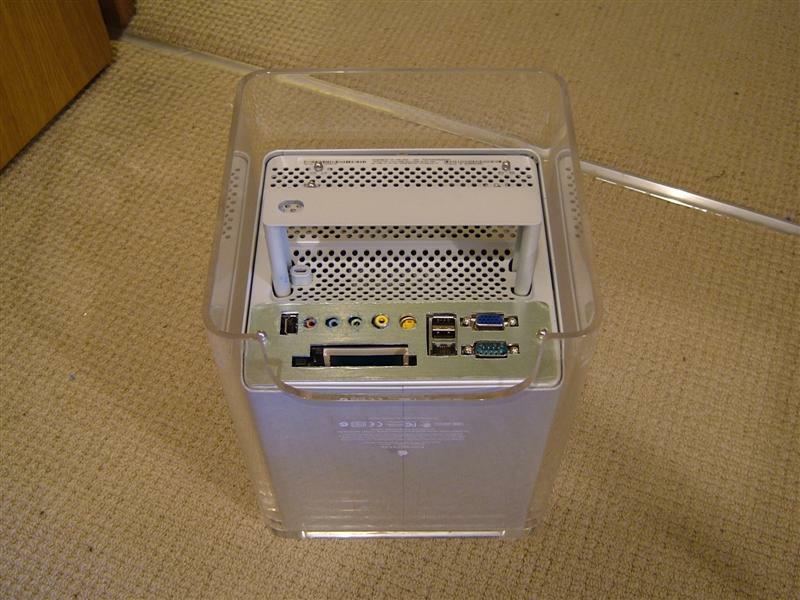 The stock G4 case is around the size of a MATX motherboard, with some main differences. 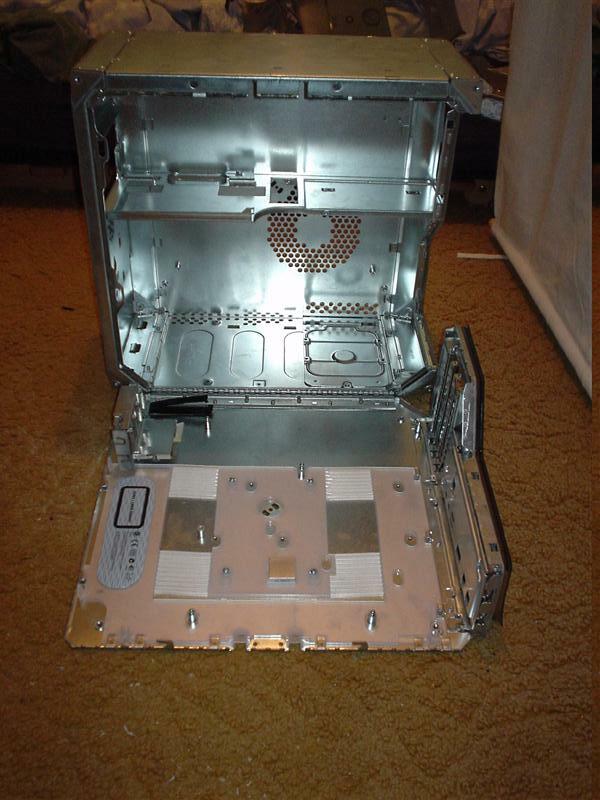 The motherboard ports do not line up with the ATX I/O plate at the rear of the case and the Motherboard standoffs don’t line up either. In order to convert the case both these issues would haven to be addressed. 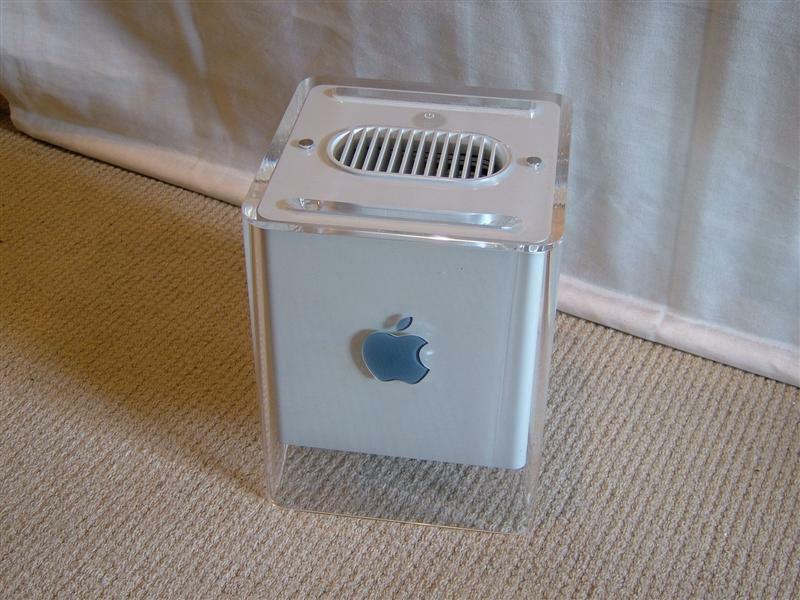 The case itself is made of stainless steel with perspex panels to give the case its great looks. 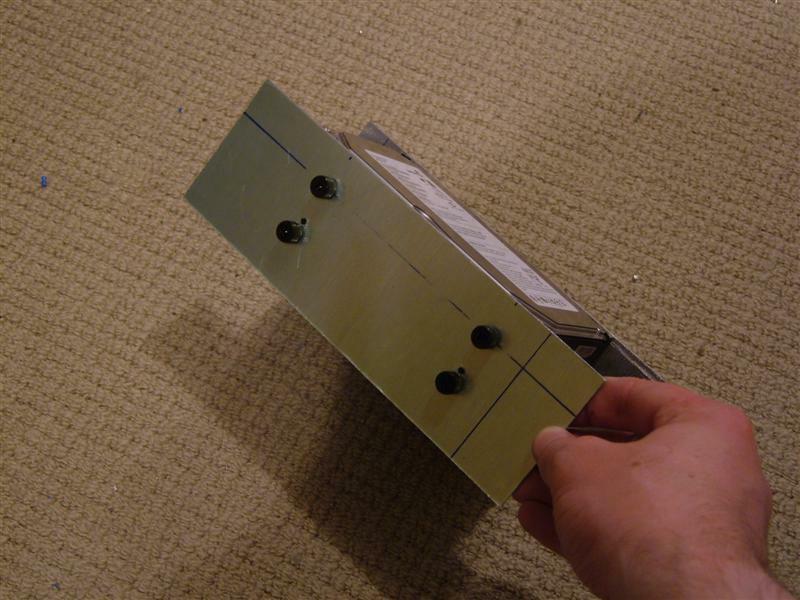 All of these panels can be removed very easily with a few clips and bolts. 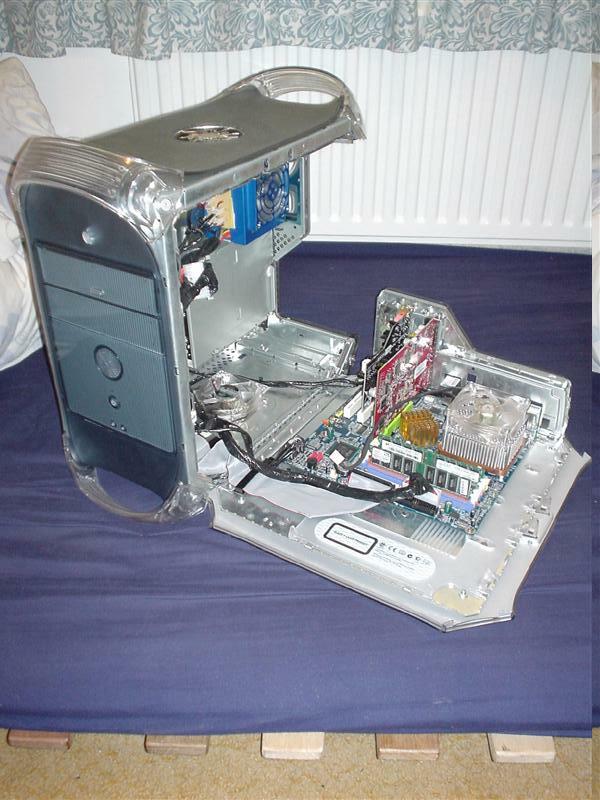 To access the inside of the case, there is a small lever and the whole right hand side of the case drops down with the motherboard in place. 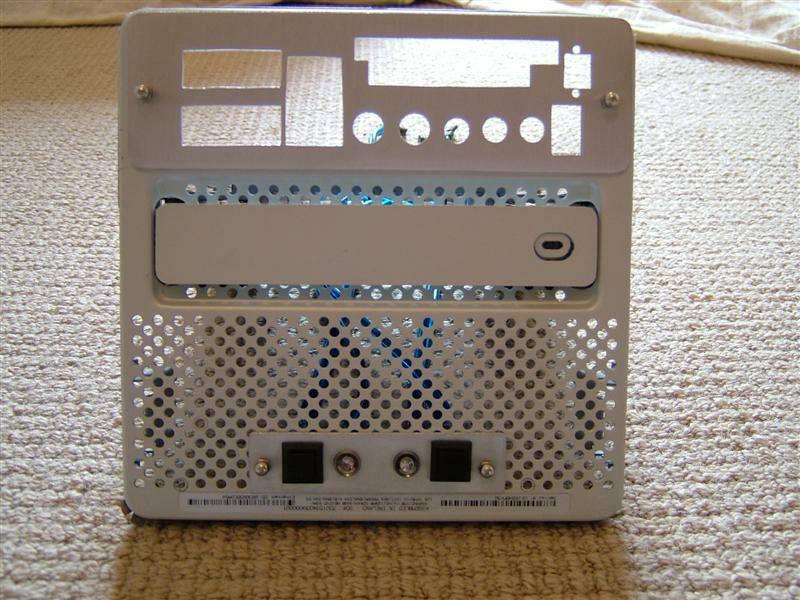 This gives excellent access to the motherboard, the lever can be prevented from opening for security reasons if neccessary by using the inbuilt padlock loop at the rear of the case. A great addition for LAN parties. Here is the case fresh out of the box, it looks great. 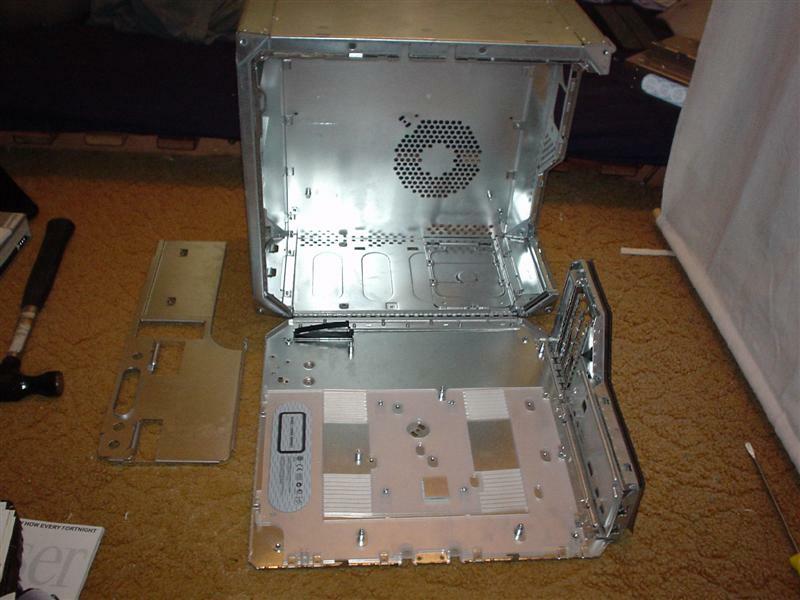 Next I opened up the case and look at what I was going to be modding. 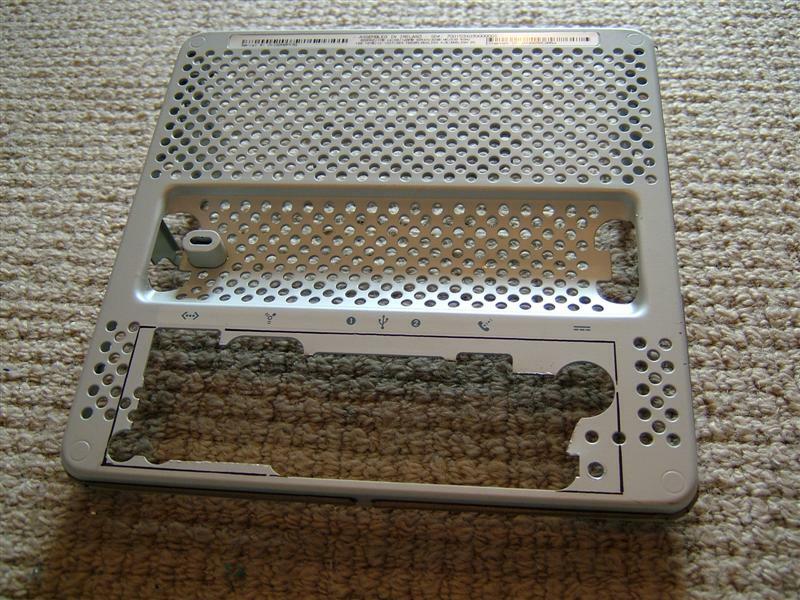 I then removed all the plastic parts from the case to get it down to its bare shell. 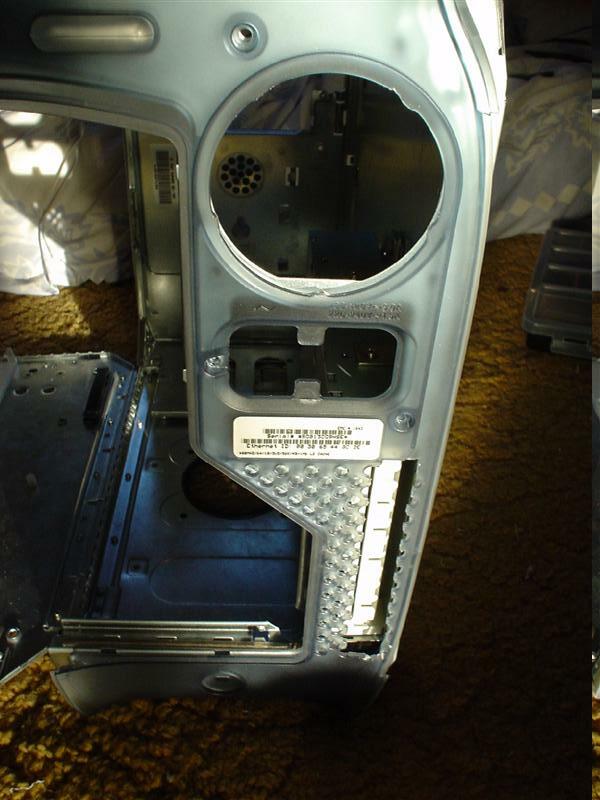 The bare shell from the front and two parts that need to be removed. 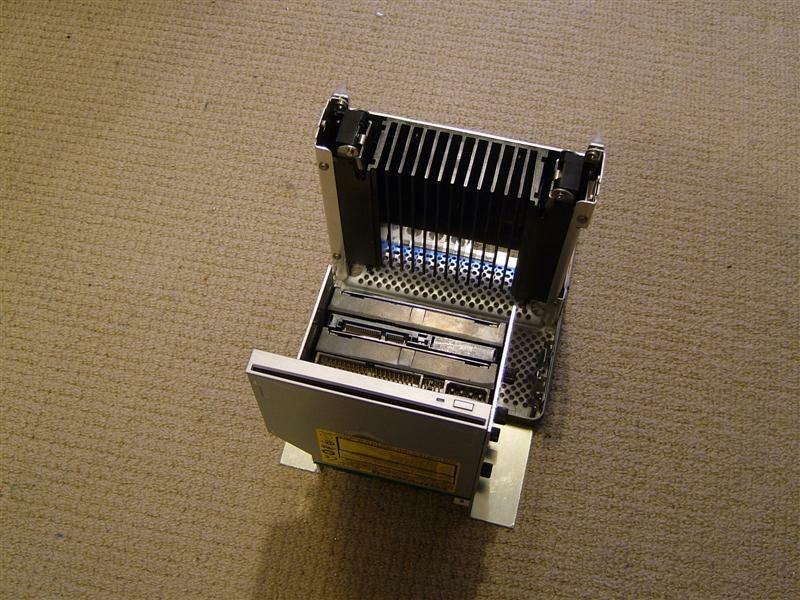 The first is the wireless network aerial, and the second is the support for extra long pci cards and the slot for the wireless network card. 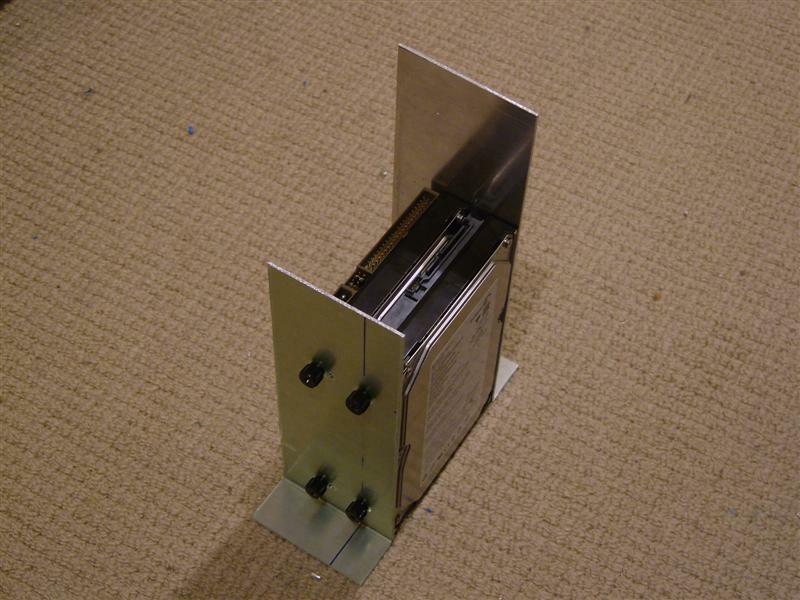 Also on this is a small magnet which prevents someone opening the case while its powered on. I will take these off later. The first part I wanted to fit was the Power Supply(PSU). 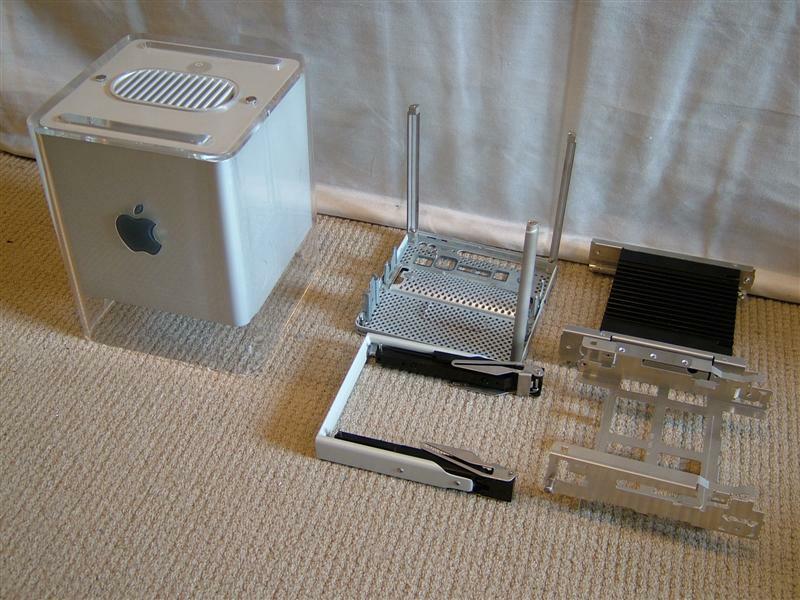 In the stock Apple setup the PSU is similiar to a ATX sized one from a normal PC case. 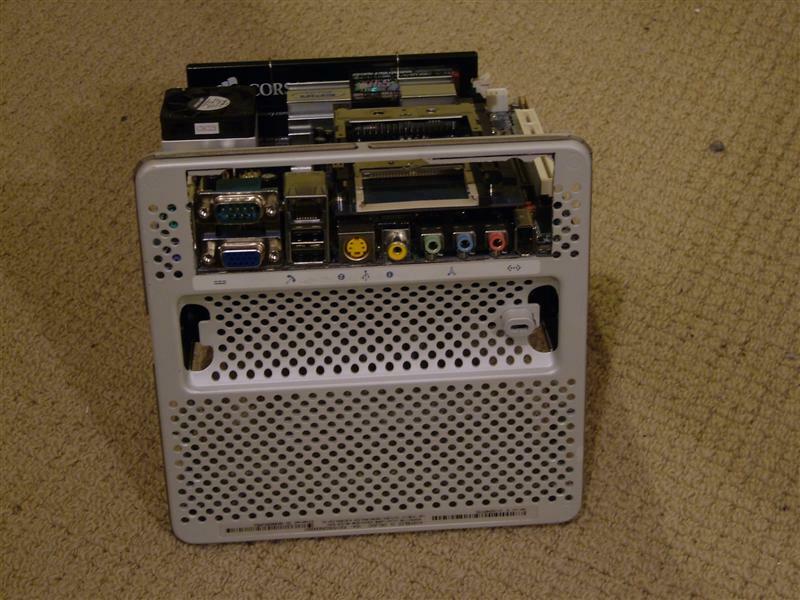 I didn’t need or want a PSU this large so I choose a smaller MATX sized one I had lying around from an earlier project. I decided to spray paint it a nice shade of metallic blue. I used normal car paint with a layer of primer then the colour coat and finally a clear coat to give a nice shine. 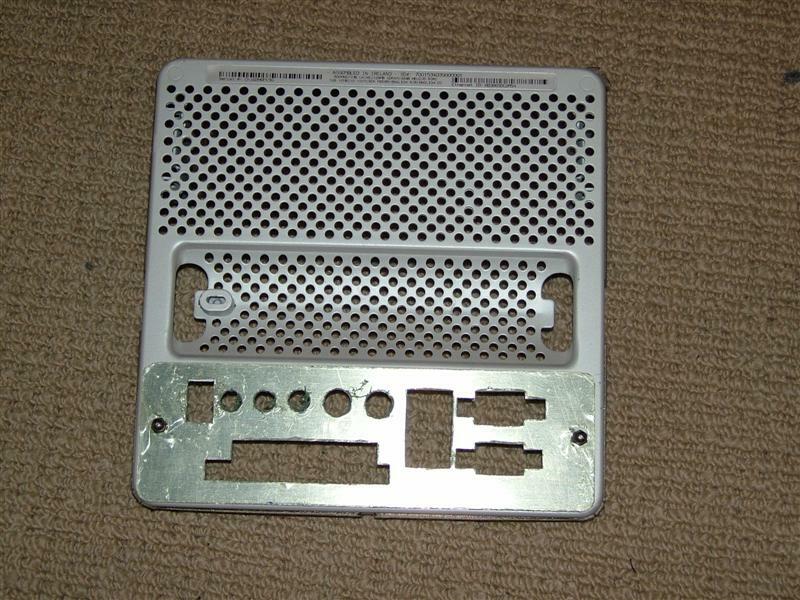 The PSU fan is a 80mm sized fan but its thinner than a normal 80mm fan. Luckily the fans I choose (Coolermaster LED fan) fitted. 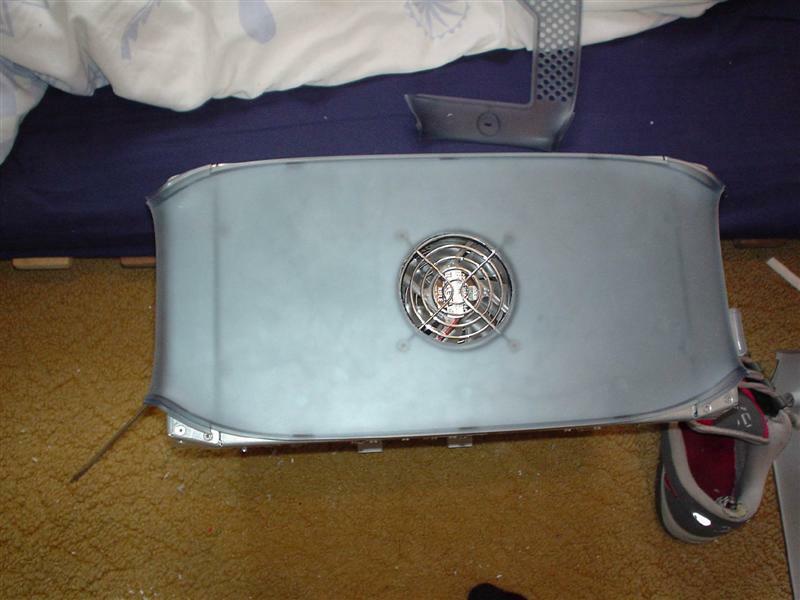 The fan was modified as described later in this guide in the fans section. 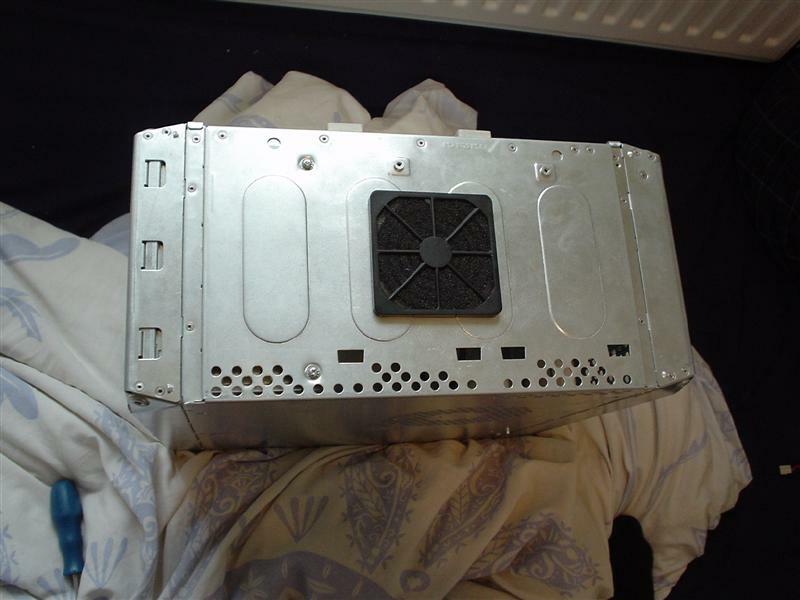 In order to attach the PSU to the case I need some kind of adapter, I had some spare perspex lying about and got out my Dremel and cut out a peice that would fit perfectly. 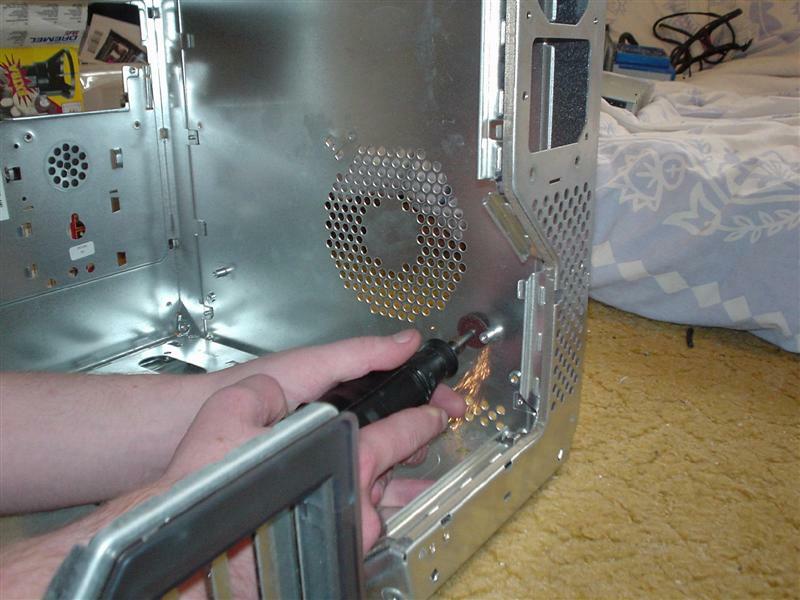 The holes were then measured and drilled out so that it could be attached with normal pc type screws. I am a real difficult person when it comes to fan choice, I want really quiet fans that look nice and can be controlled easily. I’ve not yet found my ideal fan but the best comprimise solution I’ve come across is the Coolermaster LED fans, they are clear fans with 4 LED’s for lighting (RED. BLUE , GREEN , WHITE or PURPLE in colour). 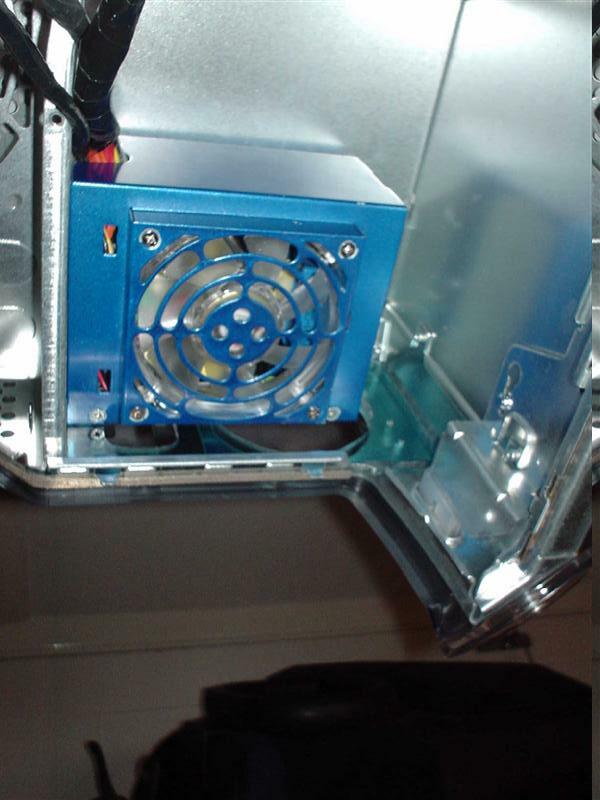 The fan is quite quiet at stock speeds and can be modified to make them quieter. They are more importantly very cheap in comparison to the normal quiet fan options. I sourced four 80mm white versions for this project. 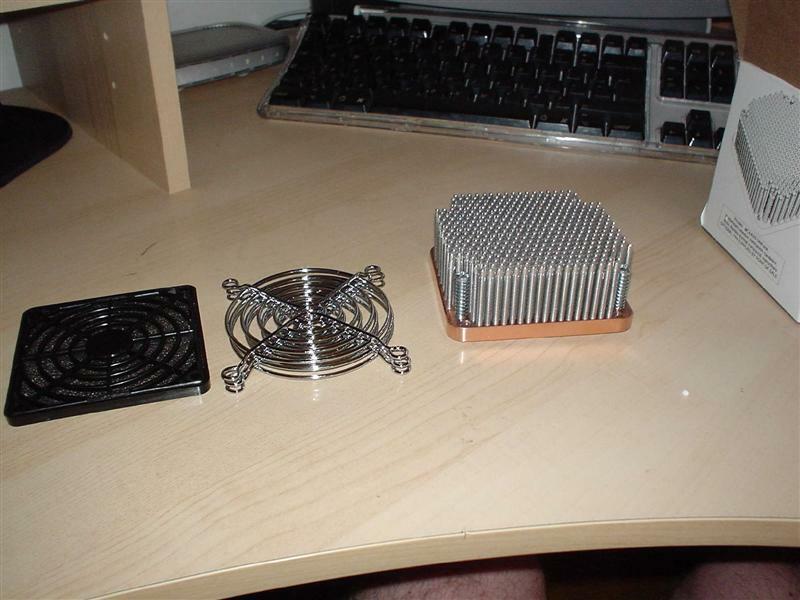 One for the CPU Fan, one for the PSU, and two for the case cooling. In order to control the fans noise levels I wanted to be able to control the speed of the fans. 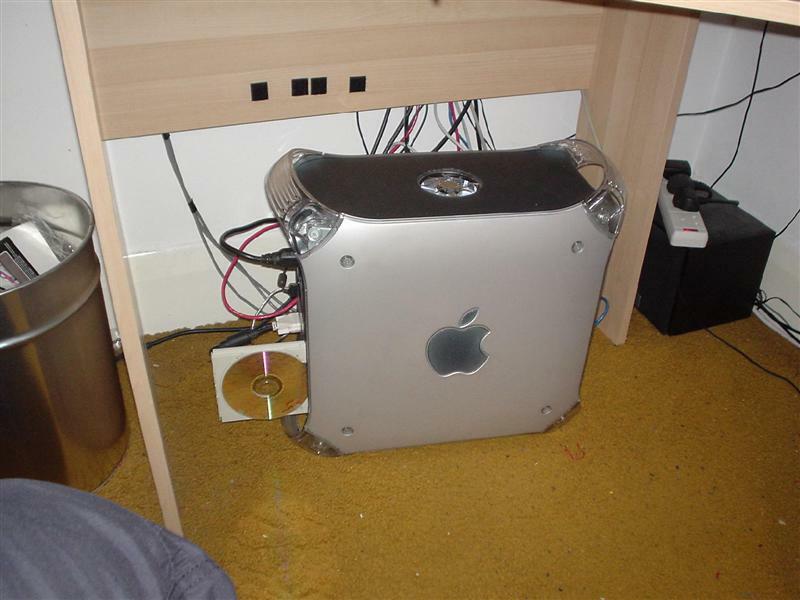 This means adjusting the voltage supplied to the fans. 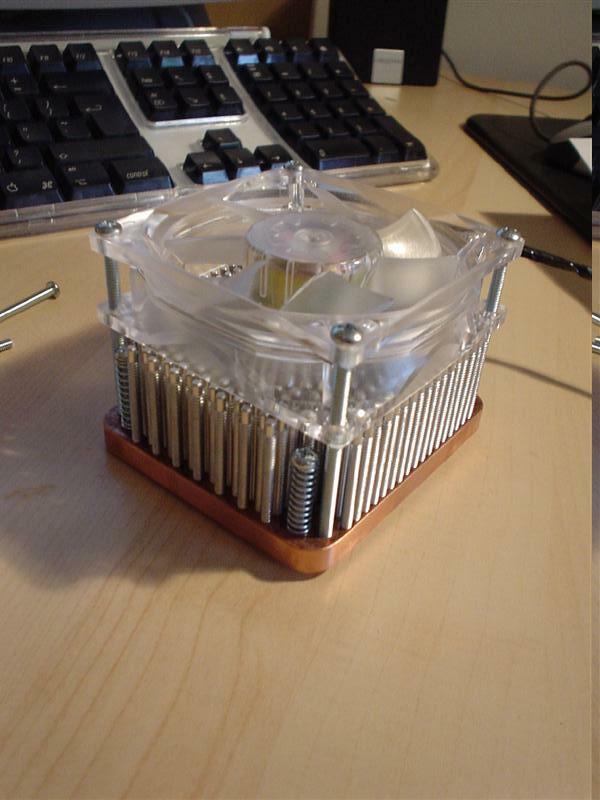 Now in a normal fan this is easy, in LED fans things get slightly more complex. The LED’s in these fans are fed by the same power as the fan themselves, this means that when you lower the voltage supplied the LED’s get dimmer. 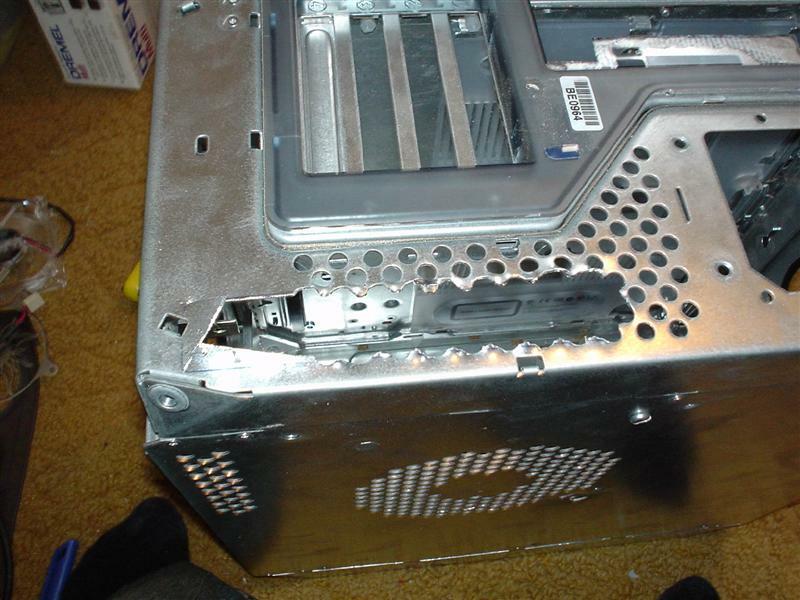 Clearly this wouldn’t do, so I set about modifying the fan so that this wouldn’t happen. 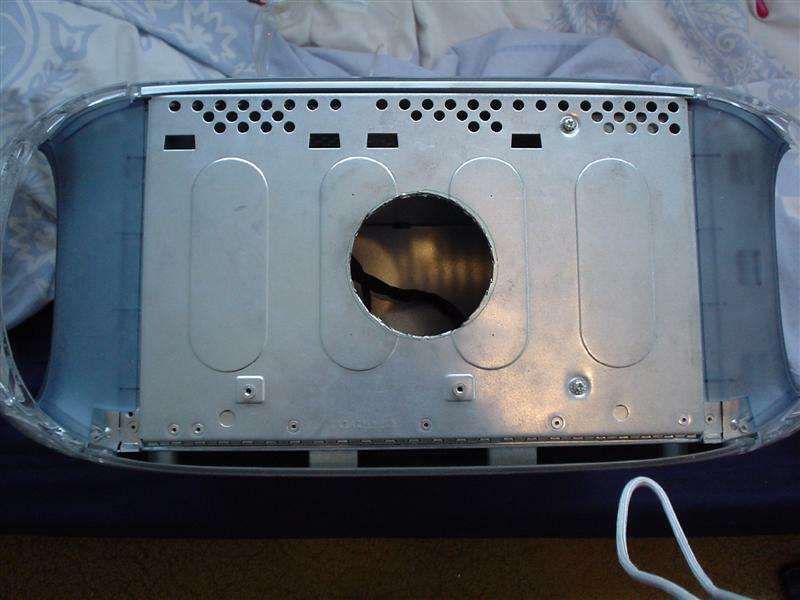 The first step I took was to peel back the sticker that hides the wires in the center of the back of the fan. I held it back with a small section of bluetac. The LED circuit is powered via three clear wires, so I unsoldered them from the fan keeping the two that were soldered on the same connection together (Positive wires). While I was at it I unsoldered the yellow wire as this won’t be used in the connector I am using. Now I soldered the Resistor to the two power wires I had unsoldered before. After which I added a length of wire after the resistor and solder it into place. 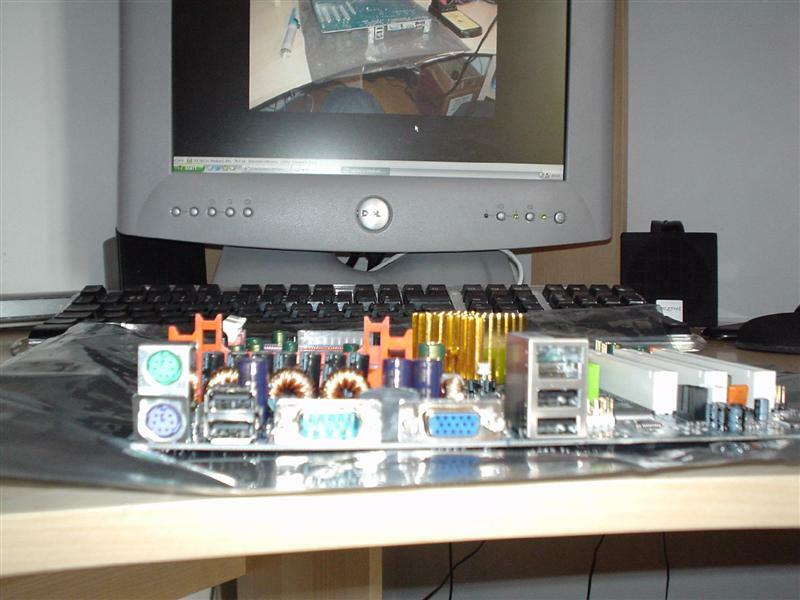 When I’d done this add some heatshrink over the bare wires and used the lighter to shrink it into place. Now solder a length of wire onto the negative LED wire and heatshrink the bare cable. Once this is done you are free to use the connector of your choice. I’ve used a four pin connector similar to the standard three pin one. With the 2 fan leads and 2 LED leads connected. To allow me to control the speed of the fans from one single point I devised a circuit that would allow me to power the fans from a single point. 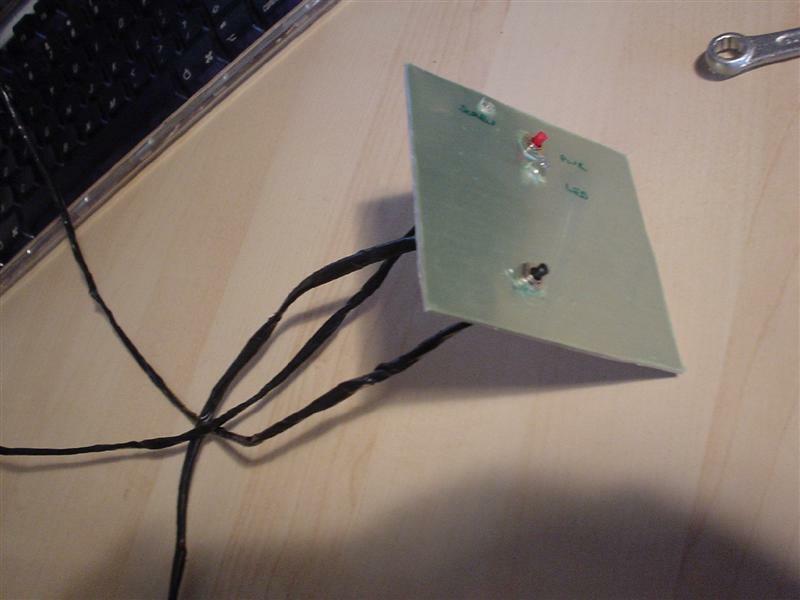 Its to be made of stripboard as its only a basic circuit. The first step is to solder the four 4 pin connectors to the section of stripboard making sure there is space between them and that the copper tracks are connecting them together. Parallel to the 4 pin connectors solder in the two 3 pin connectors again space them a couple of holes apart. Once these are done you can add the wires , you need two wires powering two of the four pin connectors tracks. The other two that take the power from the top of the three pin connectors to the other 2 spare tracks on the 4 pin ones. 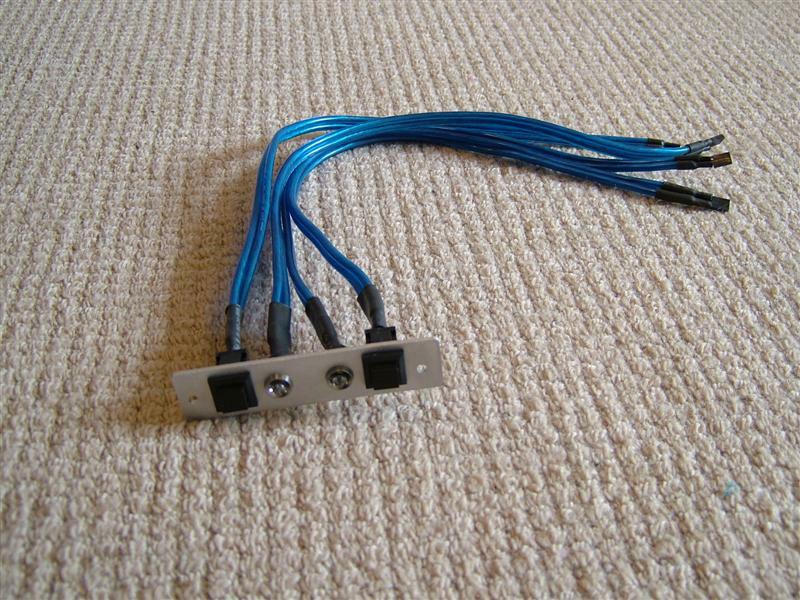 After this add a positive and negative pair of wires that connect to a molex connector. 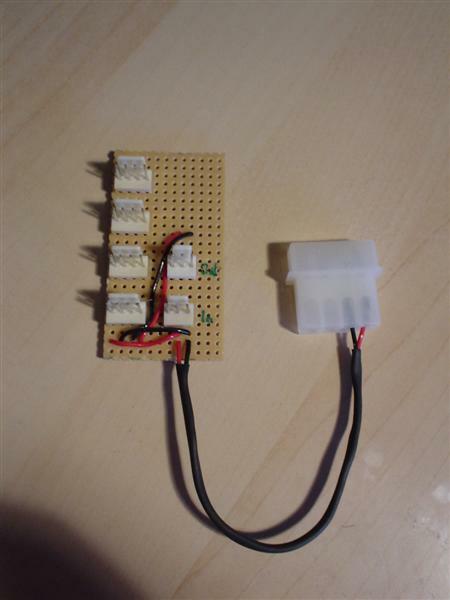 The basic circuit is now done, I have a rheostat which has 3 pin input and output which slots into the three pin connectors. 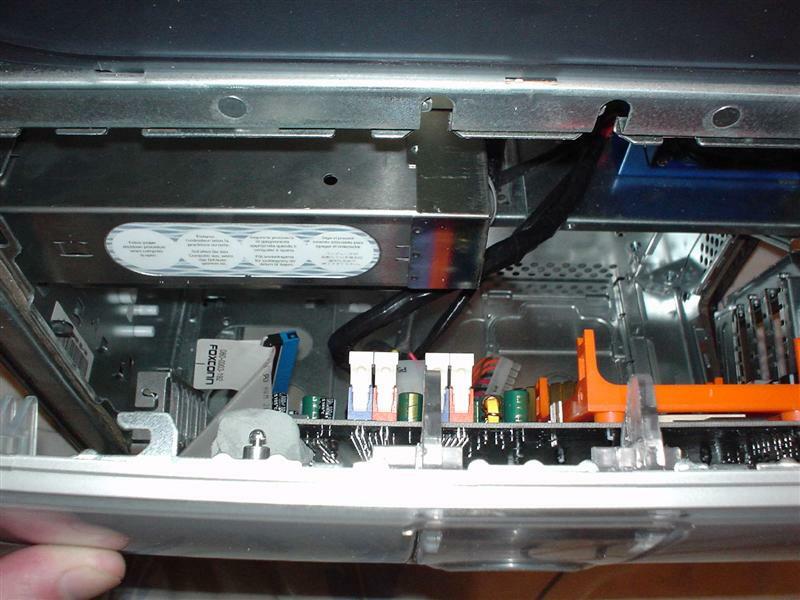 This rheostat is mounted in a spare pci slot as its a convenient way of hiding the switch but it still being accessible. I tested the circuit out on my shuttle machine and it worked perfectly. 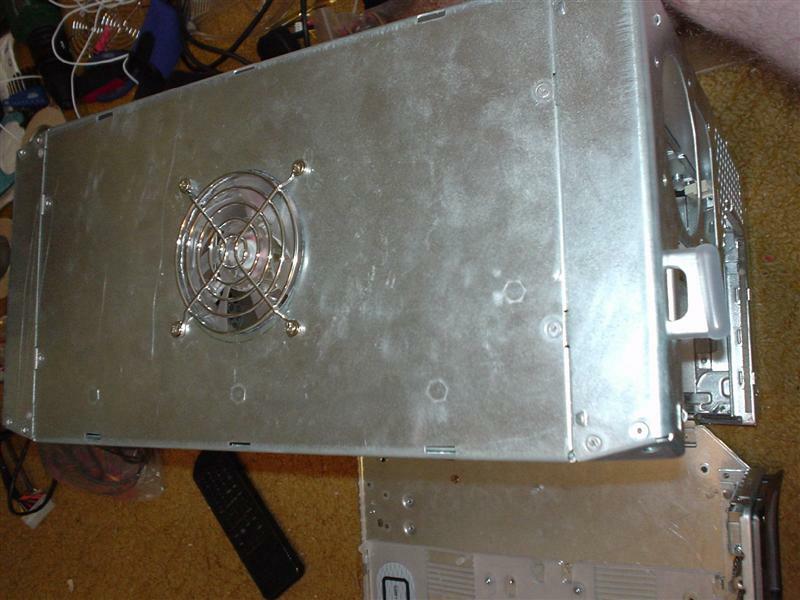 I then mounted the circuit using sticky velcro tabs onto the side of the PSU. All the fans in the system are hooked up to this circuit so one turn of the knob controls all of the fans. Lining the motherboard up for a test made me quickly realise there was going to be a major problem. 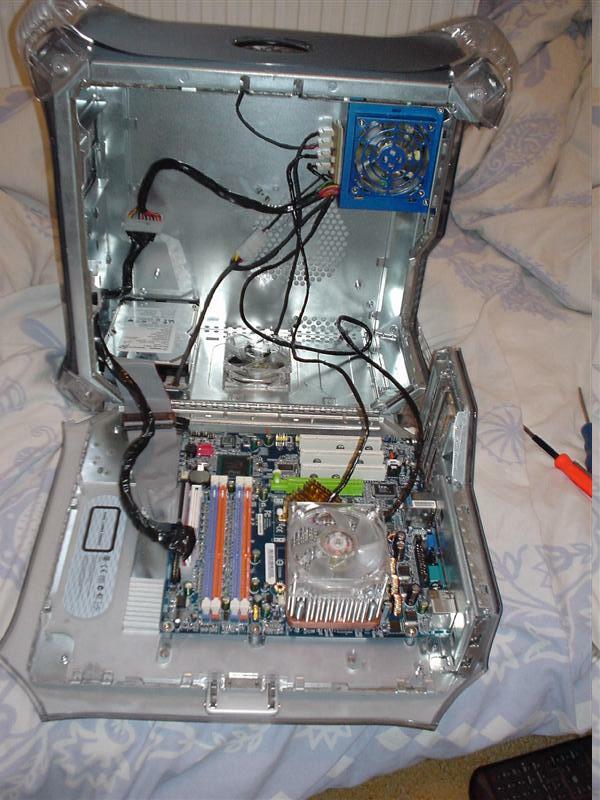 The motherboard wouldn’t fit. 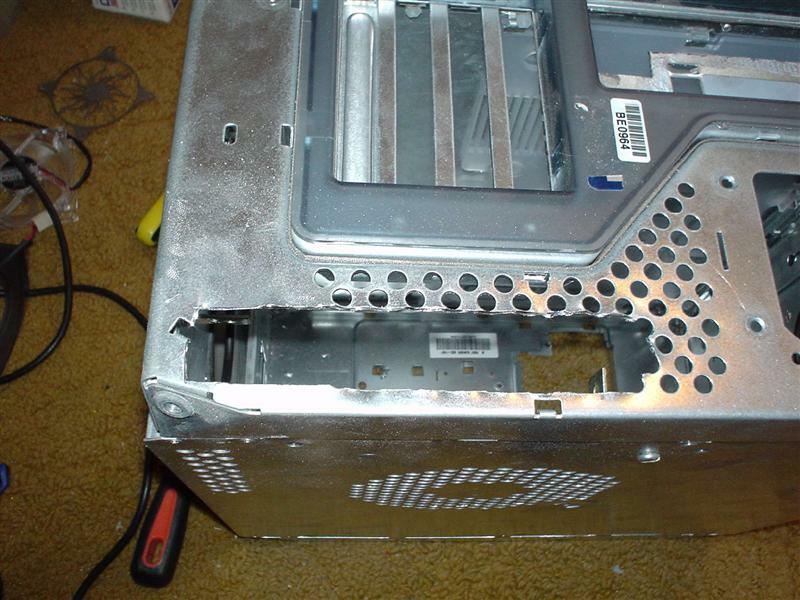 The memory slots were hitting the section of the case where the cd drive was due to go. This was going to be a major pain in the backside. 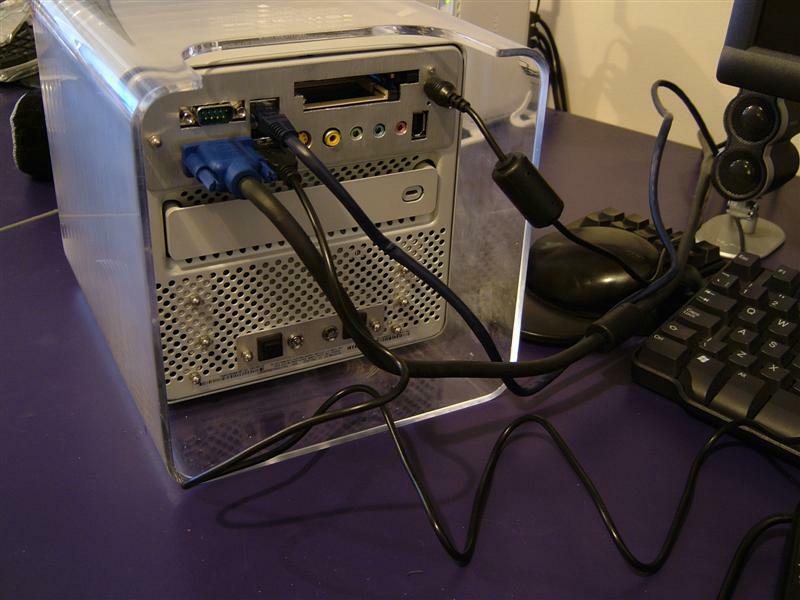 My first idea was to remove the central case strut and cd drive sections from the case, and run the Optical drive in an external case either USB 2.0 or firewire. With this decided I got out a drill and removed the rivets holding the central strut in place. 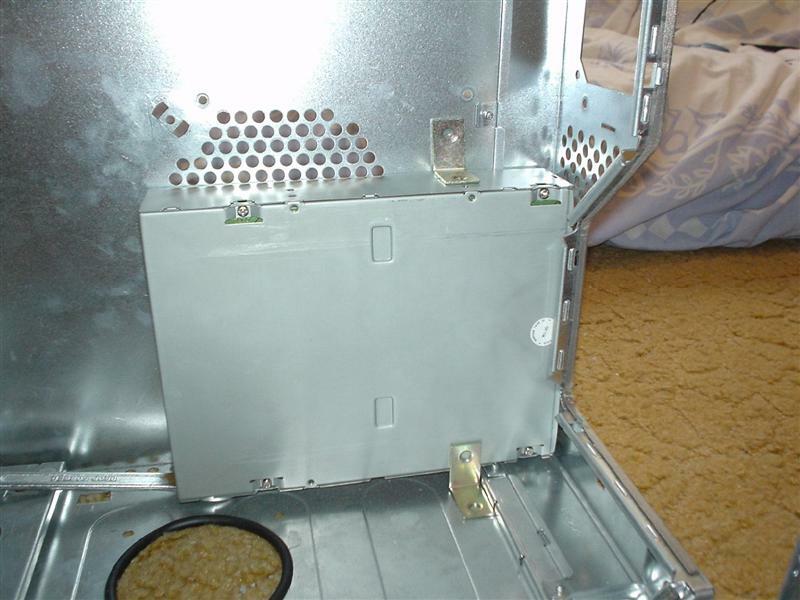 As you can see, in the picture above when I shut the side of the case, the memory slots hit the side of the cd bay; this would have to be fixed. 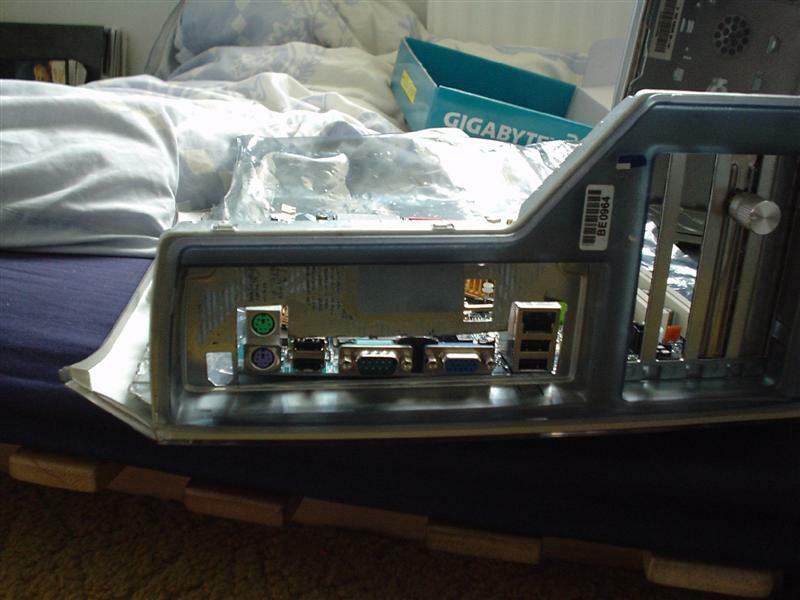 Then I removed the extended PCI card holder and wireless network slot again held in with rivets. This gave me a much larger space to work with. While I was at it I removed the aerial for the wireless network which is attached to the side of the case with small screws. Lining up the motherboard for the first time showed another problem, the audio ports where not going to fit. 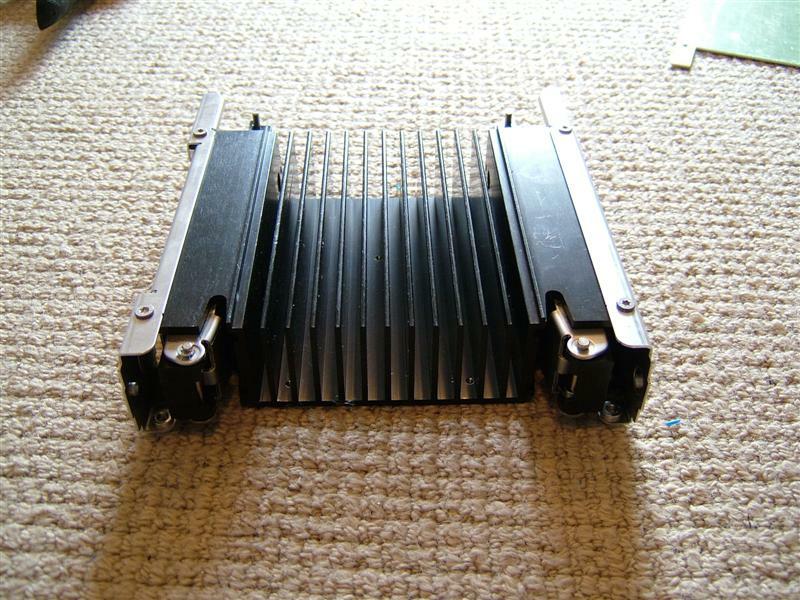 These were too low on the standard ATX I/O plate and would hit the back of the case preventing the motherboard from being placed in the right place. 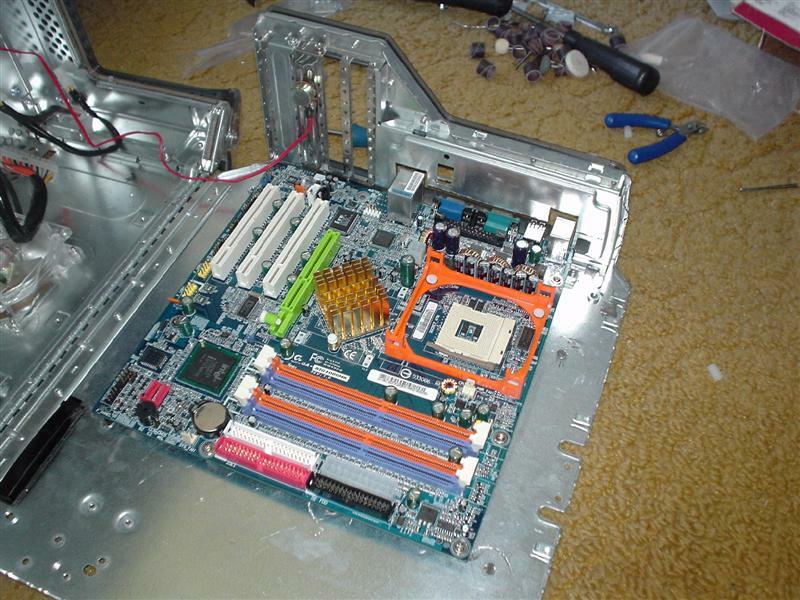 The solution is to remove them from the motherboard entirely, which means attacking it with a soldering iron and wire cutters. 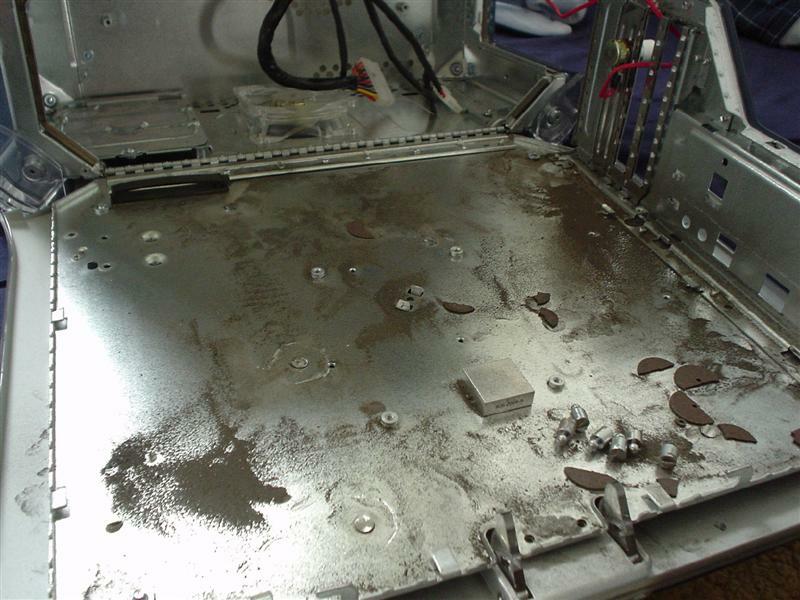 Its not an easy job and you are very likely to kill the motherboard if you are not carefull. 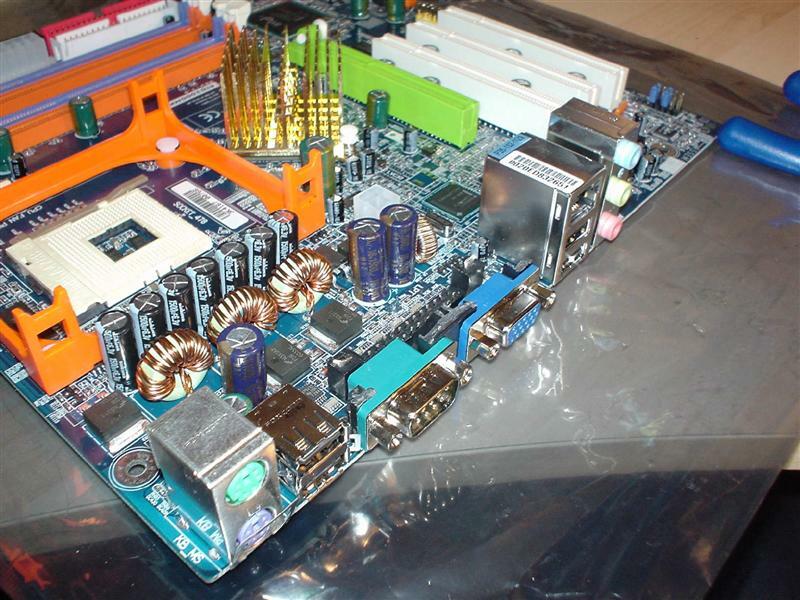 The motherboard I am using is a Gigabyte GA-8IG1000MK, its a Intel 865G MATX board. 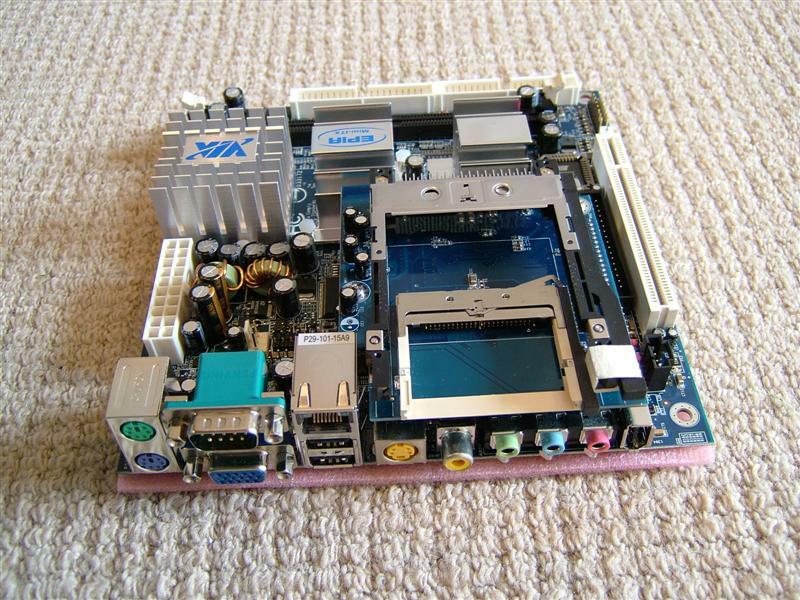 The board is the best specified Pentium 4 MATX board I can find at the moment with onboard audio/network/graphics and other goodies such as SATA. I really liked this board. 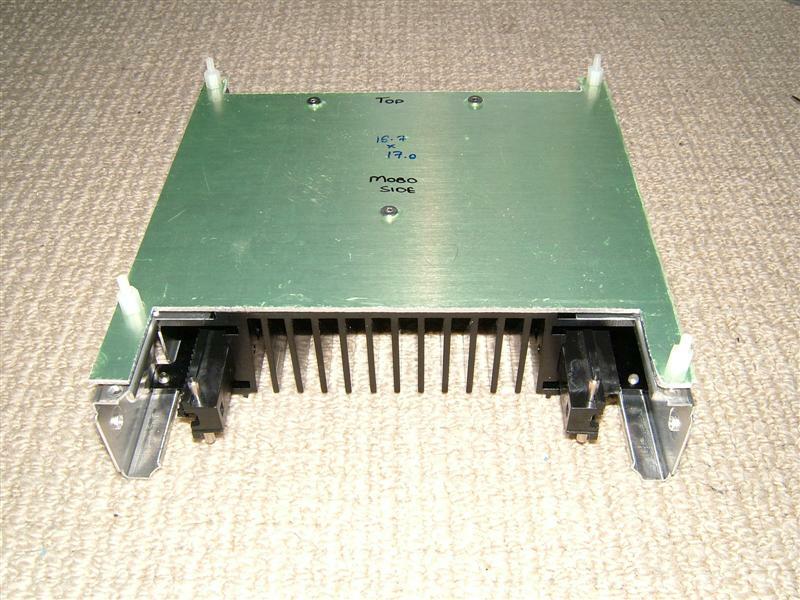 While I was removing the audio connector, I decided to remove the parallel port as well as I never use them. Next I attacked the audio port, the minor side effect being blood pouring out of my finger. This modding lark hurts more than they give credit sometimes. In order to fit the motherboard I was going to have to do a lot of work. 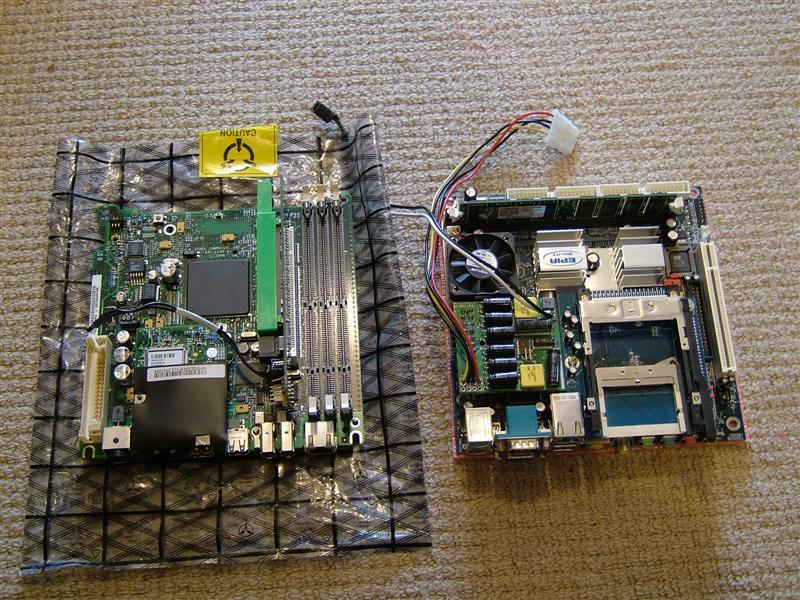 I needed to cut off the old motherboard standoff’s and fit new ones. Here the dremel fun begins, I have to cut off all the old motherboard standoffs with the dremel. Lots of sparks and dust later I had removed them all. 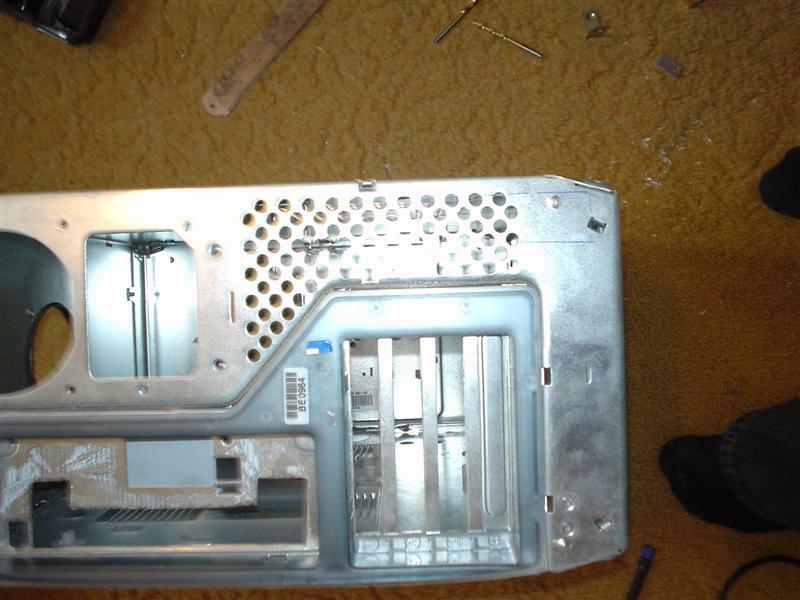 In order to get the motherboard in place I needed to cut the rear ATX I/O plate a bit, again I attacked it with a dremel. For the motherboard standoffs I used small 1cm hexagonal spacers. 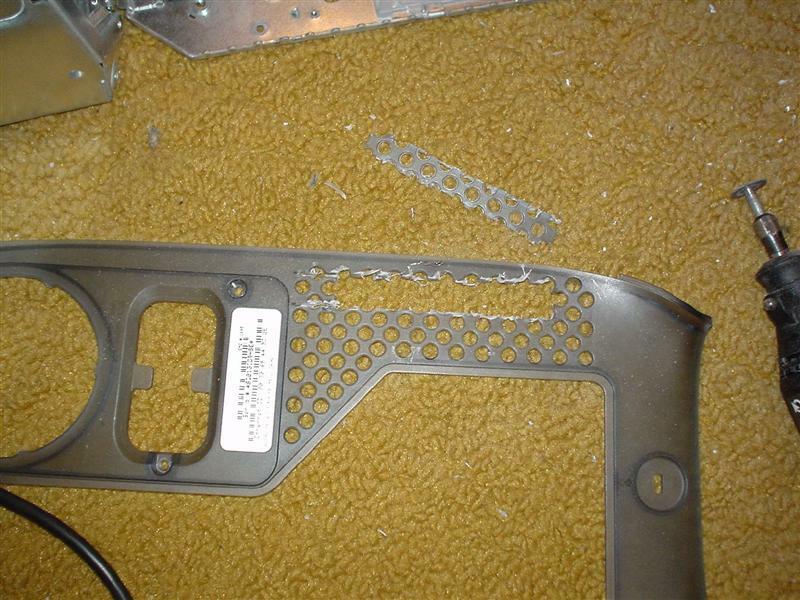 I had to drill the holes and make sure the plastic (Part of the door opening mechanism) was able to move as before. I finally got the motherboard in place. The project was starting to take shape. I wanting to find a great looking cooler for this project. 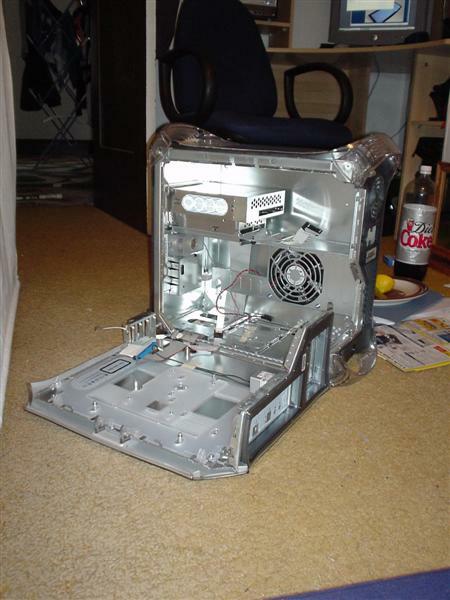 It needed to support 80mm fans and be an excellent cooler. The obvious choice was the Swiftech MCX 4000. 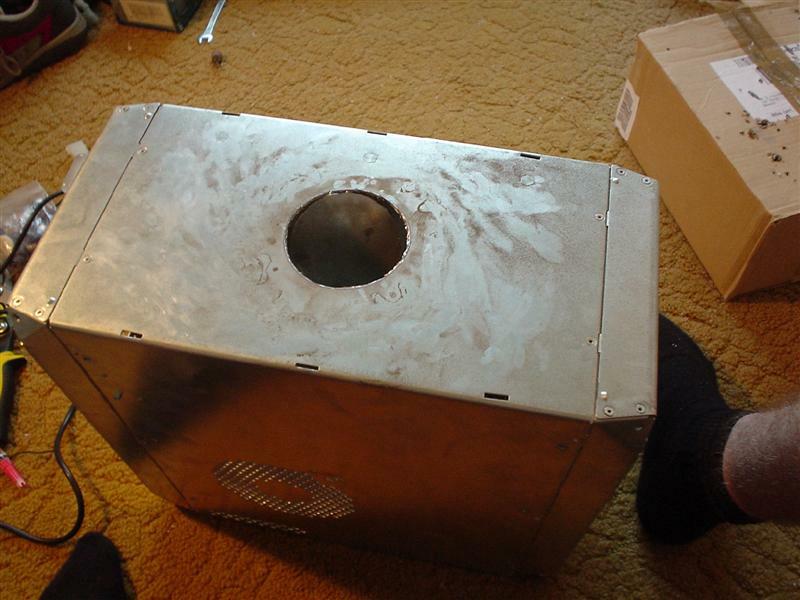 Overclock.co.uk, kindly provided the cooler along with a few grills and a filter for the bottom blowhole. 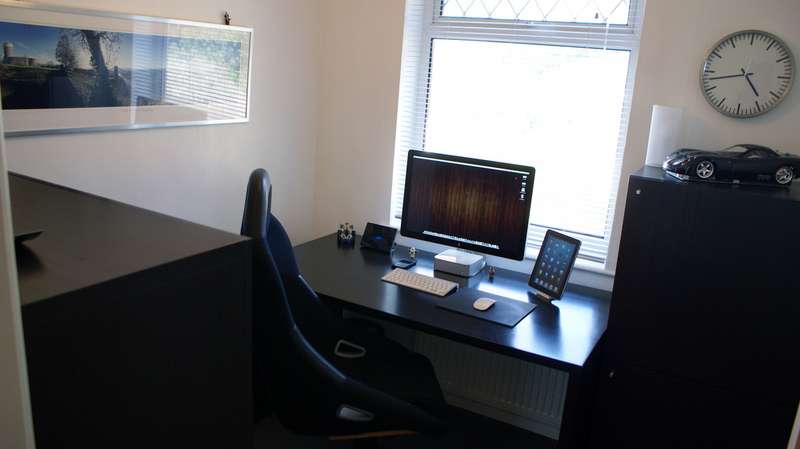 Its nice to get some support from stores like Overclock.co.uk and its greatly appreciated. 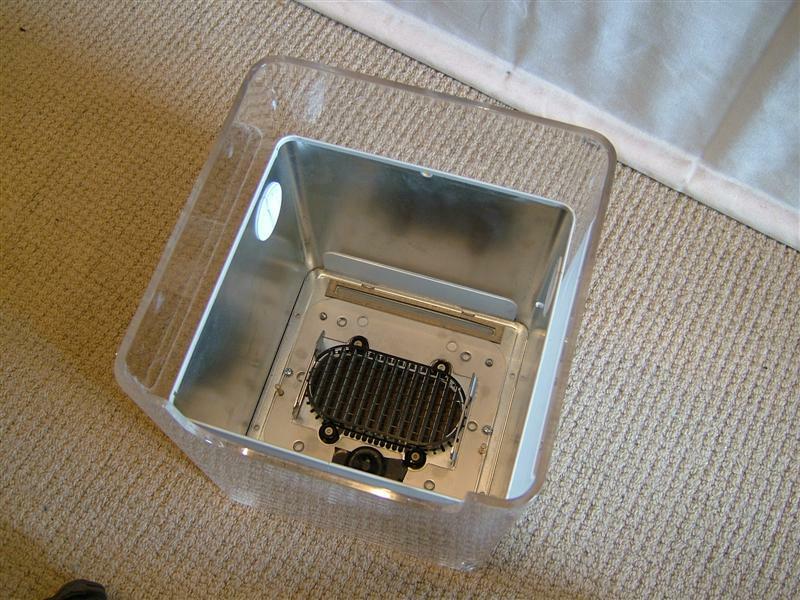 The swiftech cooler along with the grills and filter. 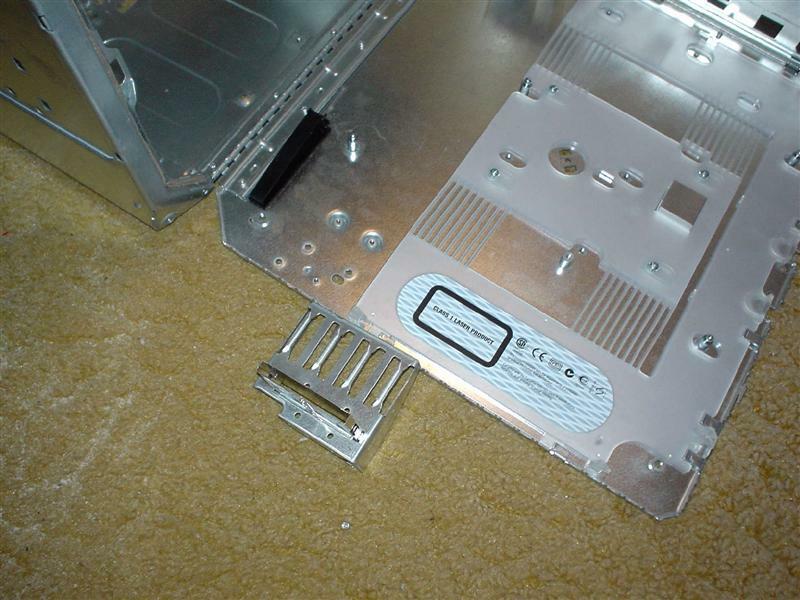 Mounting the cooler onto the motherboard requires the stock P4 mounting to be removed. 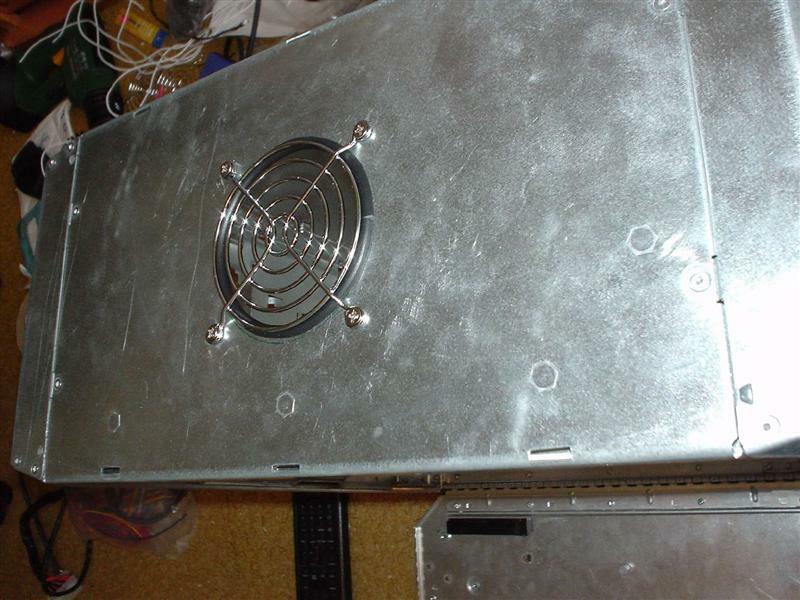 Then the cooler is bolted into place. It looks great with the 80mm clear fan. In terms of physical cooling the Swiftech is excellent. It is better than any other cooler I’ve used before. The temperatures with the fan on really low voltages is amazing. 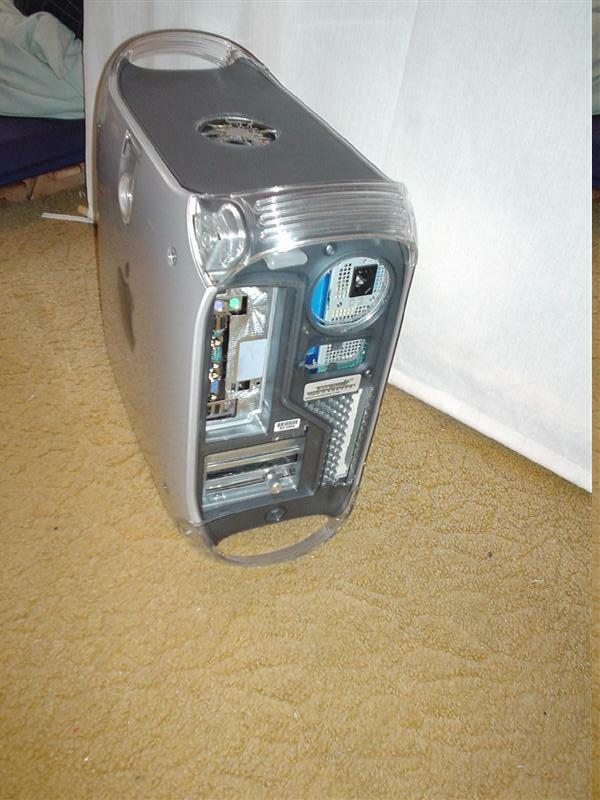 I originally planned to use the normal layout of the standard Apple Mac G4 with the optical drive but this was not going to be possible. 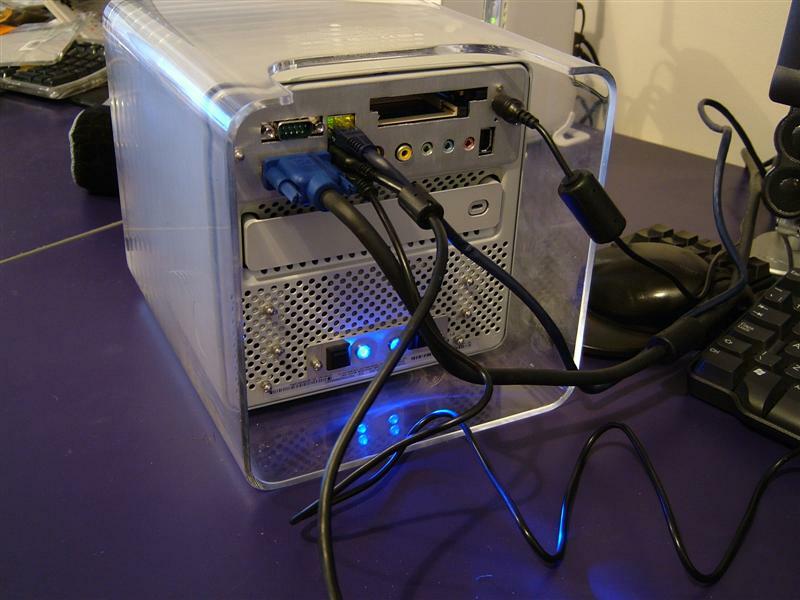 The next idea was to use an external drive bay but they are expensive and it wasn’t an ideal solution. 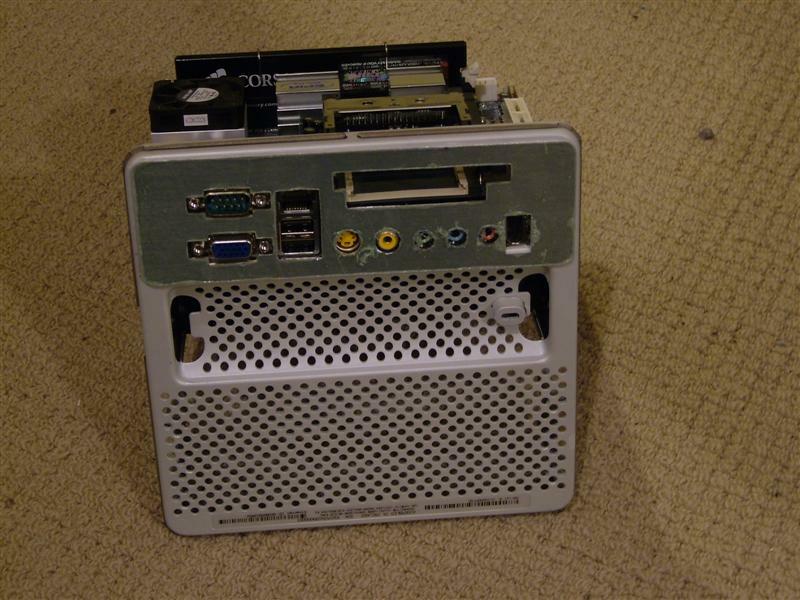 However while looking at the case I realised that it would be possible to mount the drive on its side ejecting out of the back of the case. 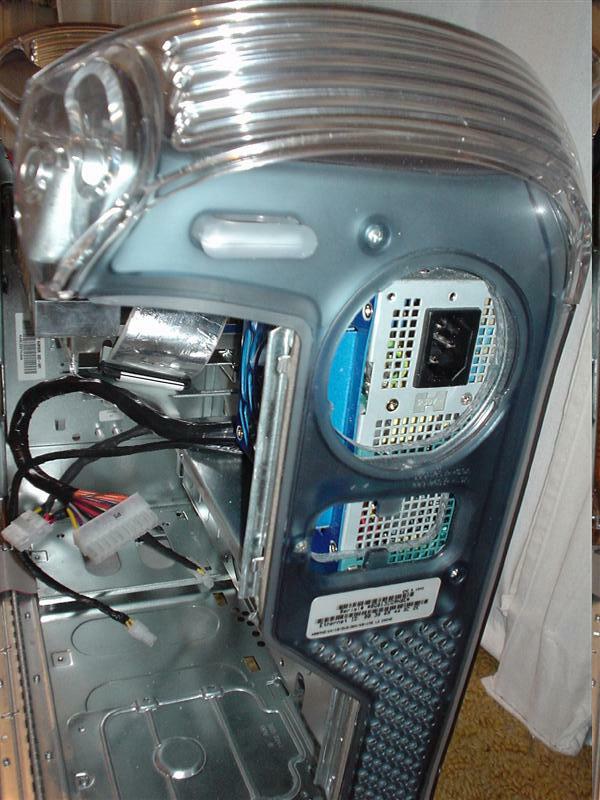 This would mean that I would need to remove the 120mm fan and its shroud but this wasn’t a problem. 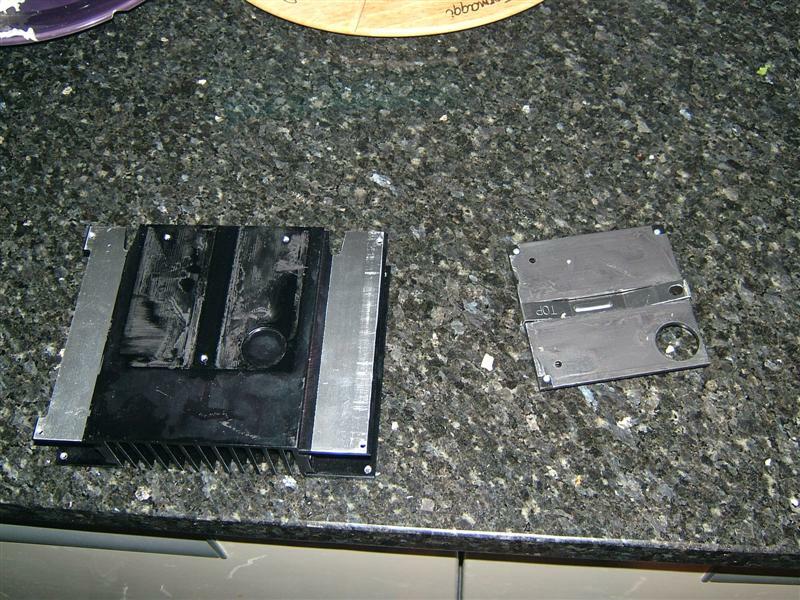 First I need to remove the screw mounts for the 120mm fan, I attacked them with a dremmel and cut them off. 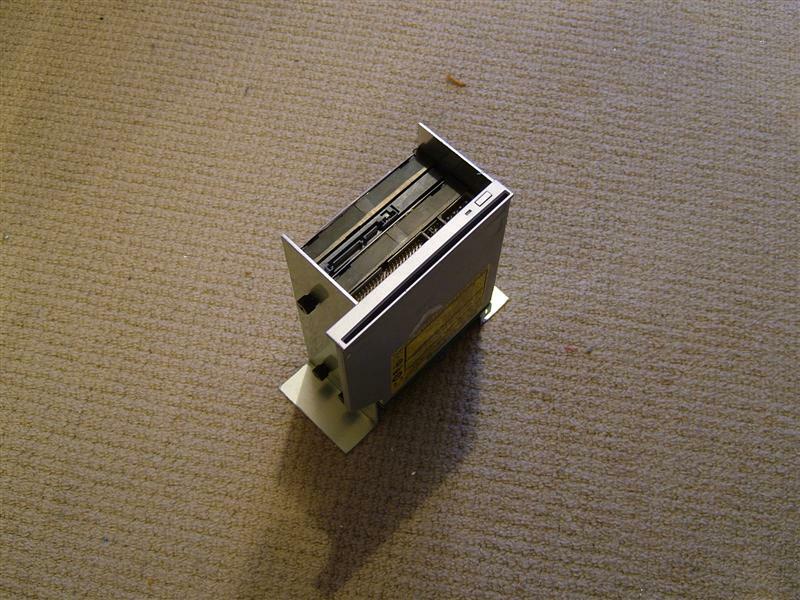 I intended to mount the drive using 2 brass brackets, after drilling the mounting points I realised I hadn’t taken into account the perspex handles at the drive wasnt able to eject. 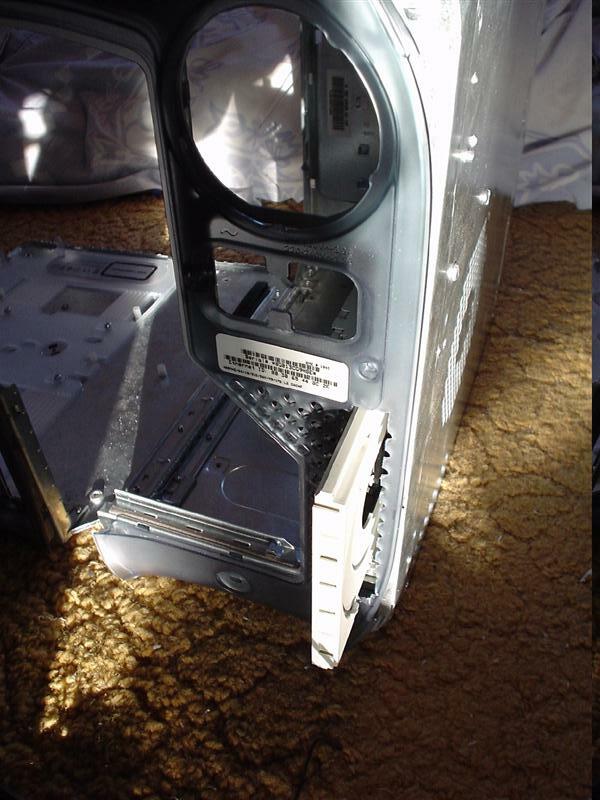 Luckily I hadn’t cut out the slot yet so I re-did the mounting with the drive raised higher. 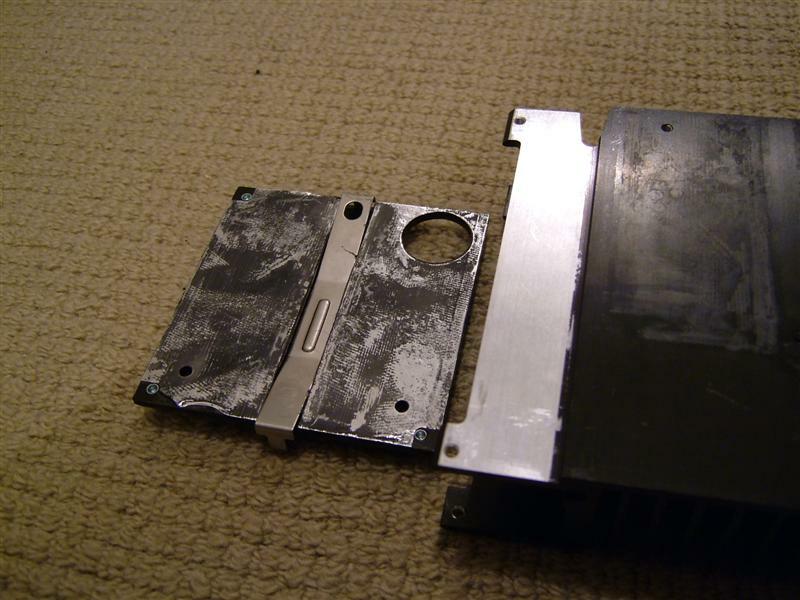 With the drive placement fixed, I cut a thin slot in the metal at the rear. 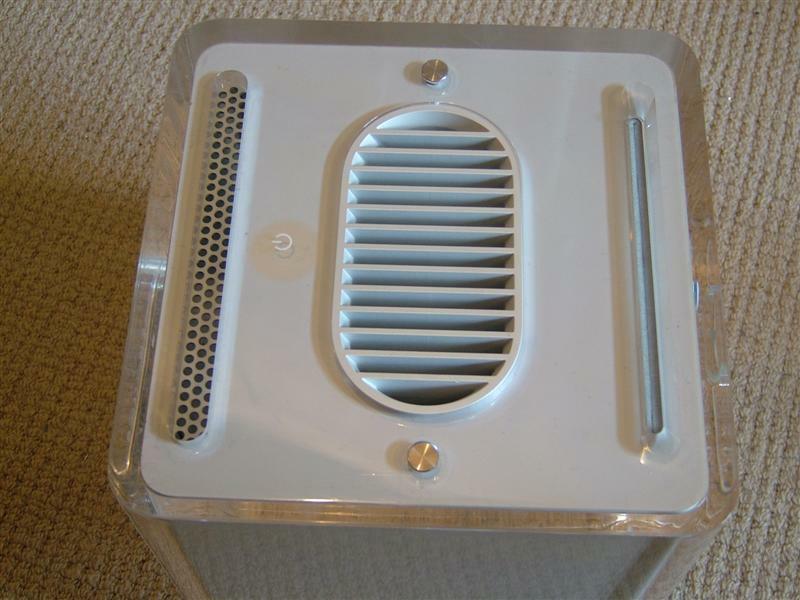 The CD is ejected via Windows or pressing the button which is accessible through one of the old vent holes. 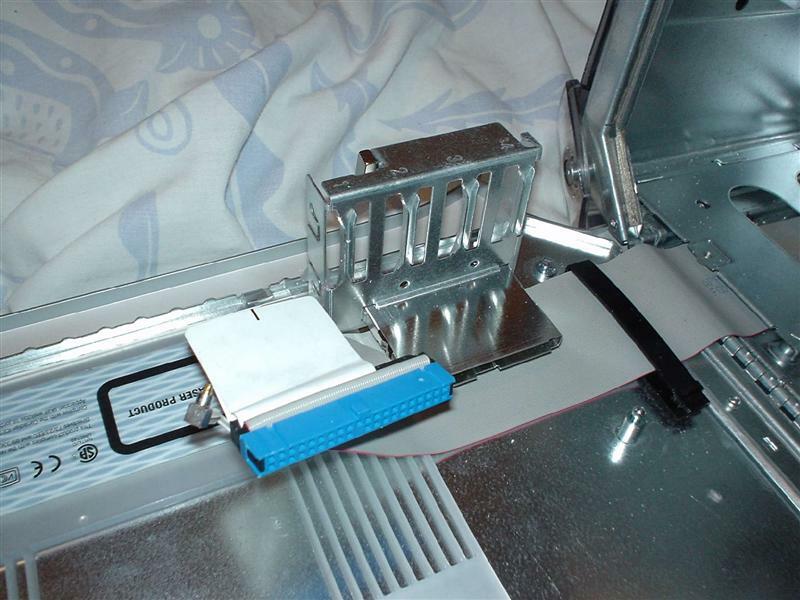 The slot being cut out of the perspex and the CD drive tray ejecting from the rear of the case. 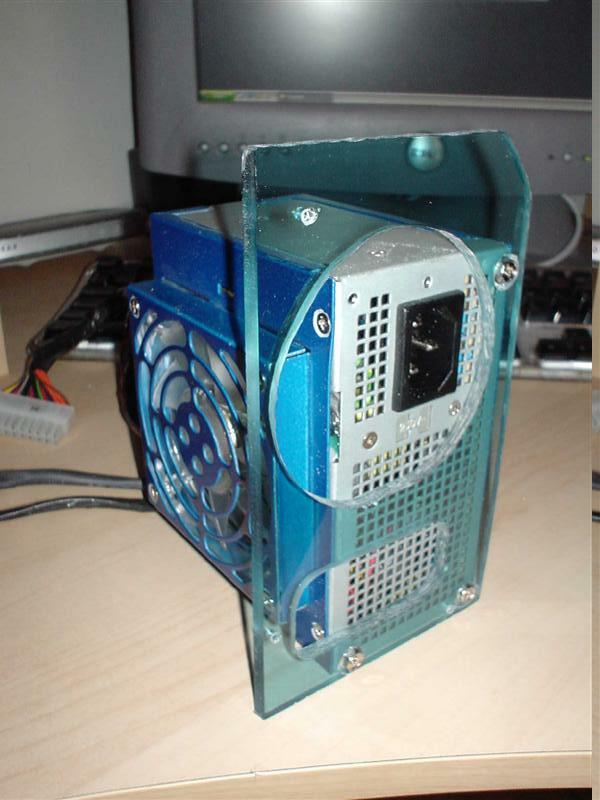 I had always wanted to add a fan to the bottom of the case, but with the 120mm case fan having to go I decided to stick a 80mm blowhole at the top of the case as well. To make the bottom blowhole I cut out the hole with my trusty dremel. 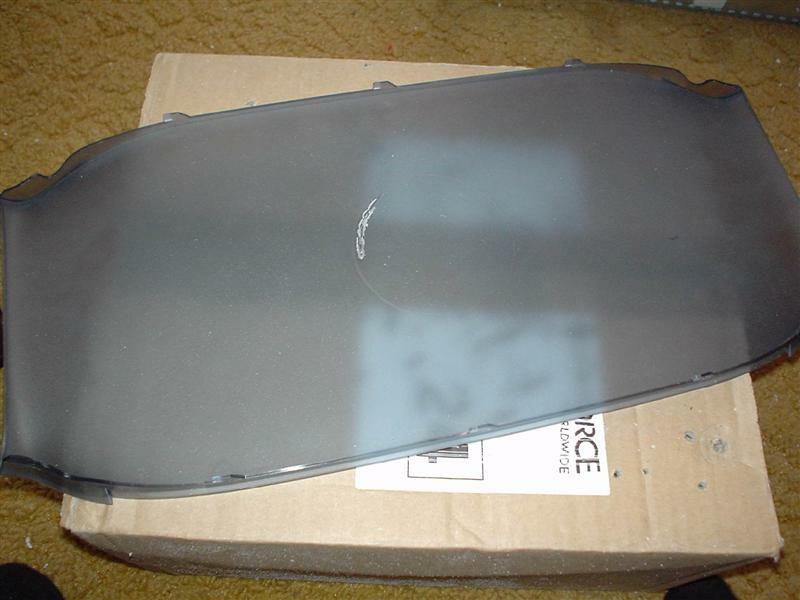 With the hole cut and filed back to shape. 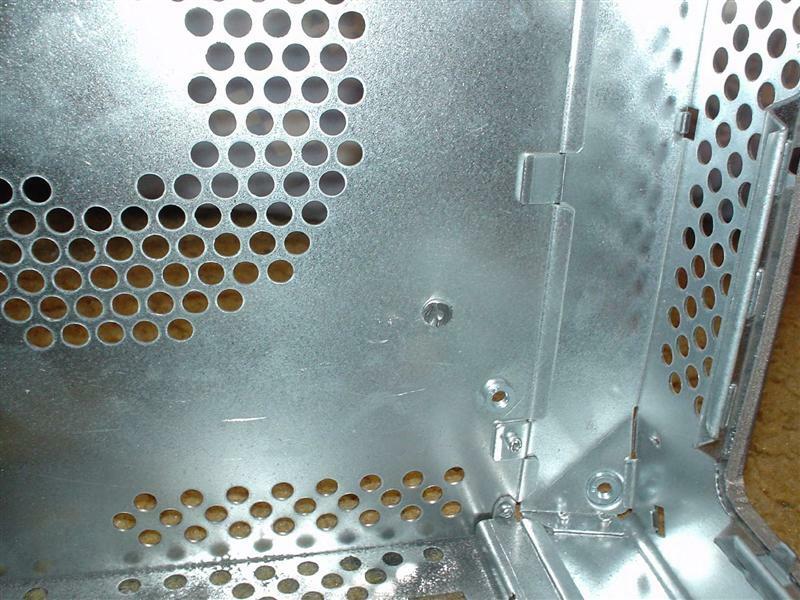 The bolt holes were drilled out as well. 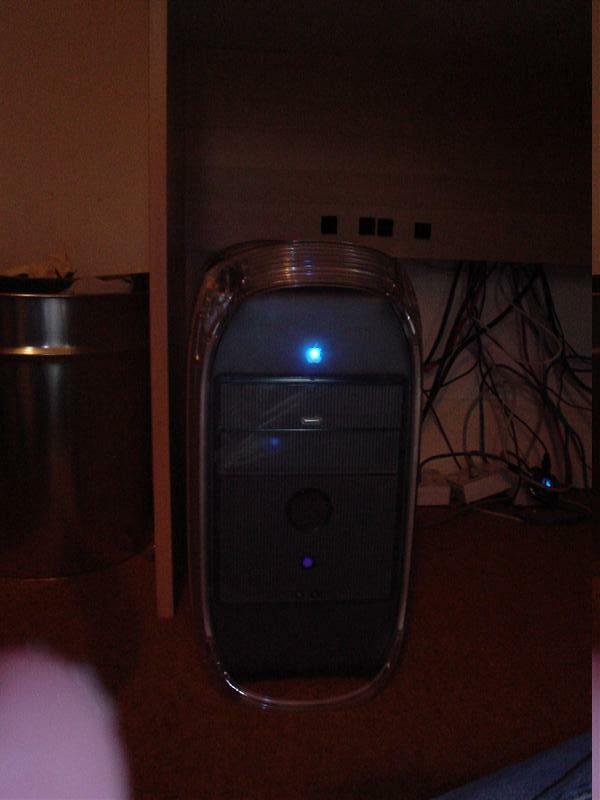 In order to prevent dust being sucked up into the case I fitted a filter to the bottom fan. 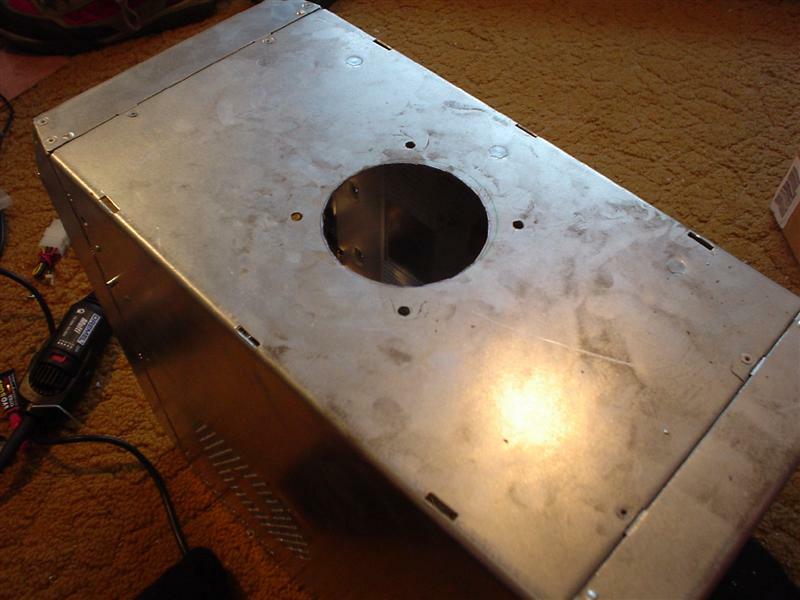 With the top fan I repeat the same dremel process as before to create the blowhole in the steel chassis. This time I added some blowhole trim as it is going to be on show. 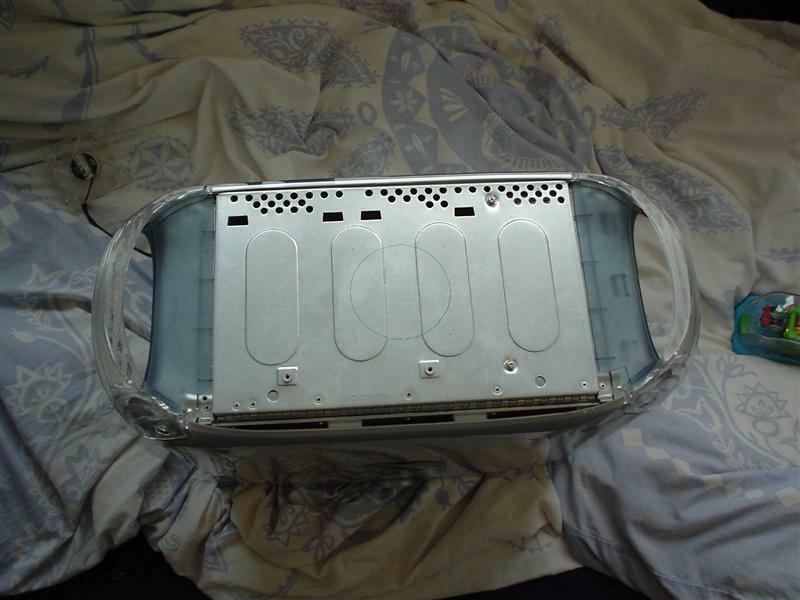 I then had to cut the perspex section as well to get air out of the case. The perspex was again cut with a dremel then filed back to shape with a sander. With the white LED fans the top blowhole looks ace. Due to the way that the case opens I needed to make an extra long PSU cable, I sourced a male and a female atx connector and set to work soldering all the wires required. Its long and boring work but it was cheaper than buying one. I wrapped the finished cable in black tape to make it look at lot nice. I also extended the p4 connector to reach the motherboard. I wanted to use the existing switches to keep the case looking as standard as possible. The existing switch circuit is setup for the mac and requires alteration for pc use. 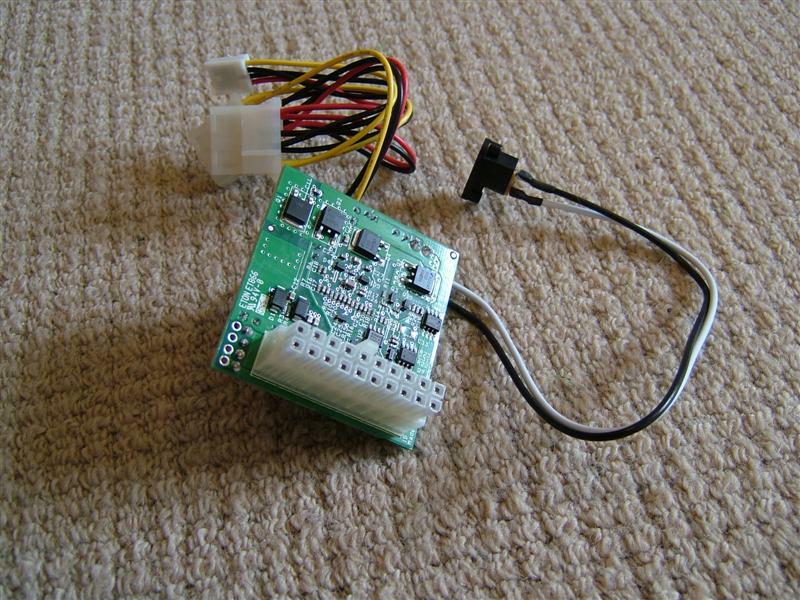 I tried to convert it but it wasnt very succesful so I ditched the circuit and bought some cheap push to make switches. 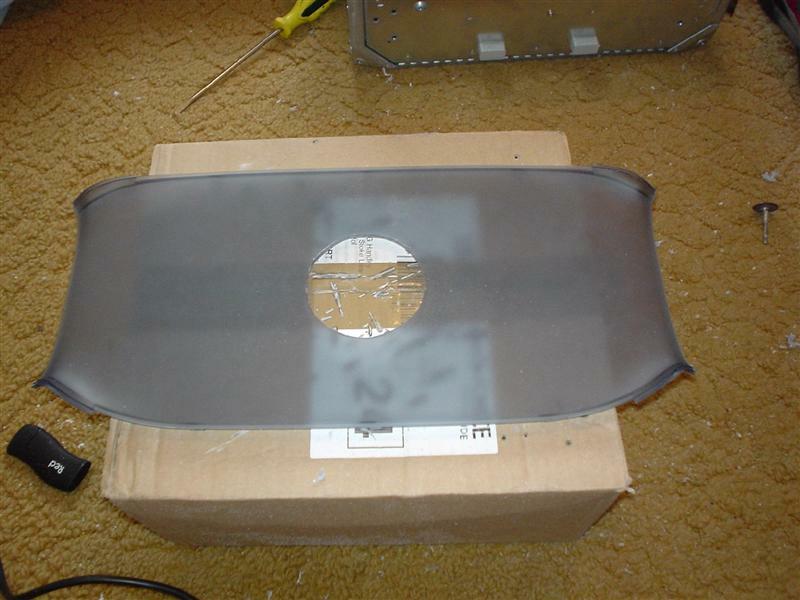 And set about making an aluminium plate to hold them in place. 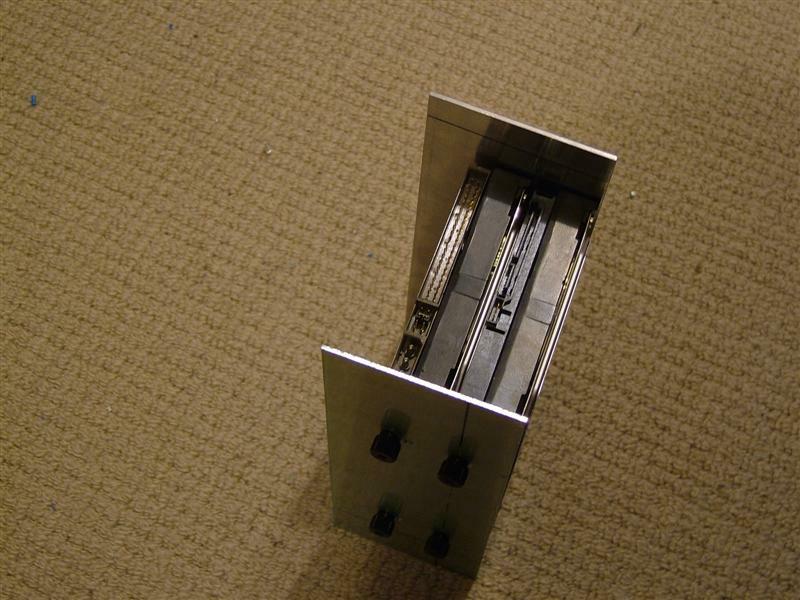 Here is the stock circuit, its mounted inside a steel square which clips into place. 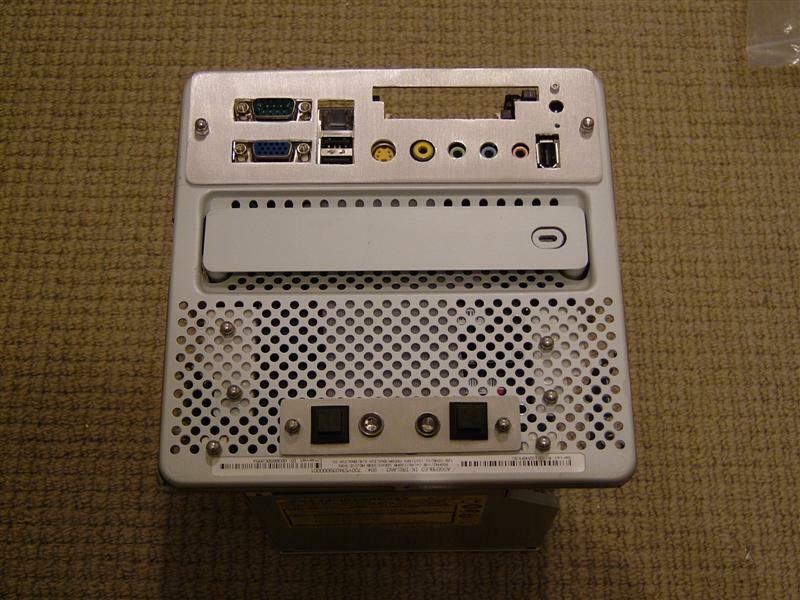 On the back there was a reed switch which disables the power buttons when the case side is opened. 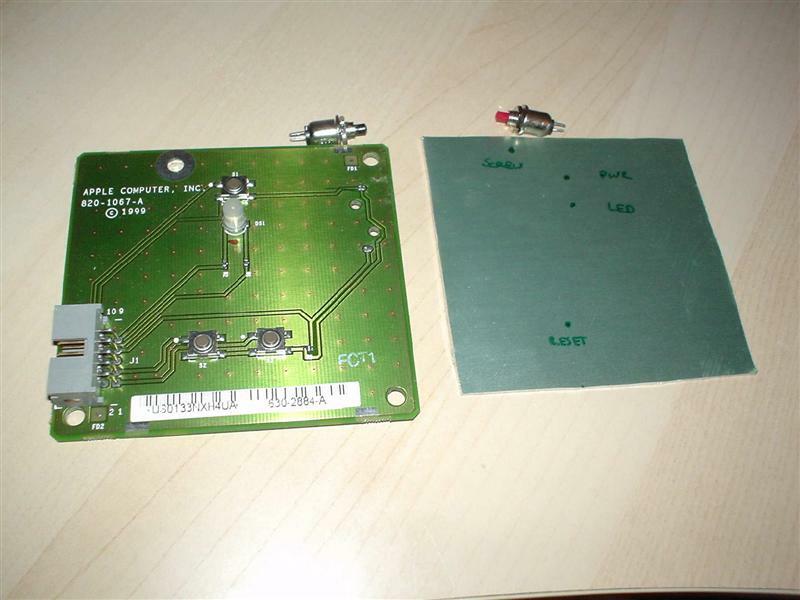 I bypassed the reed switch entirely and tried some modification of the orginal ciruit but it didn’t work. 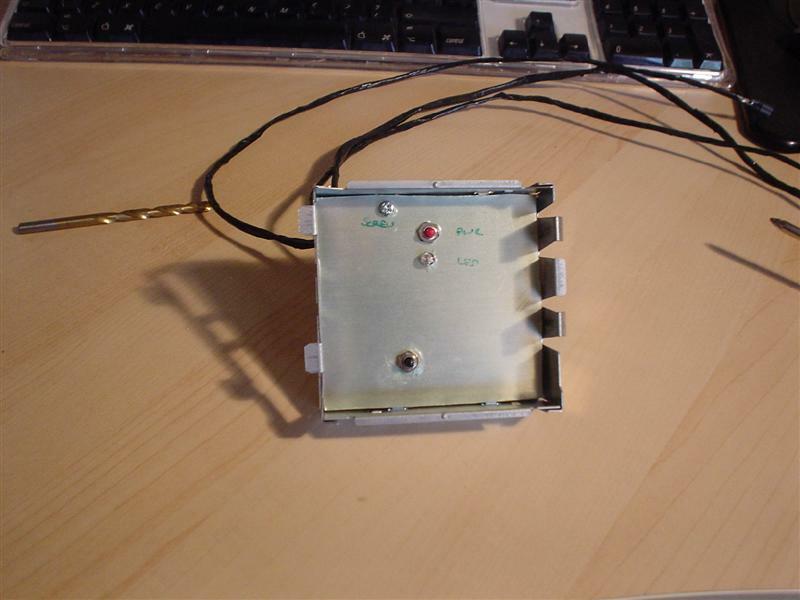 Here’s the alternate switch setup, I made a sqaure of aluminium and drilled the holes for the two switches and the LED. With all the modding done it was time to put everything into the case and boot it up for the first time. It worked fine with the side down, booting first time. 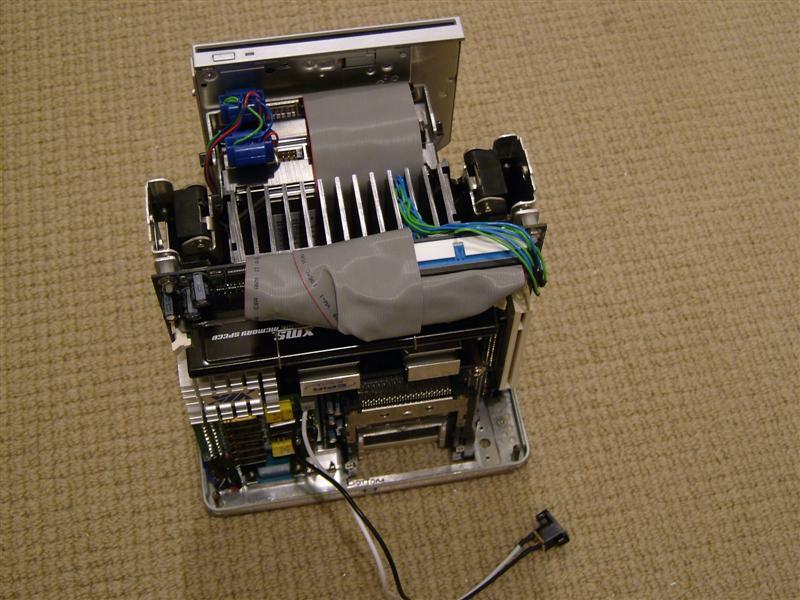 However, when I closed the case the system shut itself down straight away. 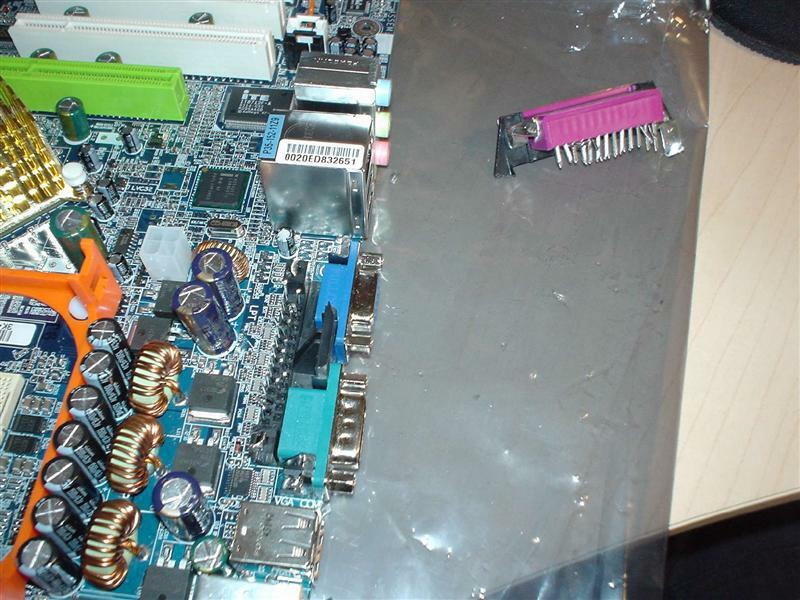 I quickly found that the motherboard was shorting out on the square of metal keeping the plastic section used to open and close the case in place. I used some tape to insulate the piece of metal and it was all sorted. I took the perspex panels off and gave them a good scrub down in the bath and then removed the fine scratches with Novus polish. I use the system as my day to day system, using it for games and work. 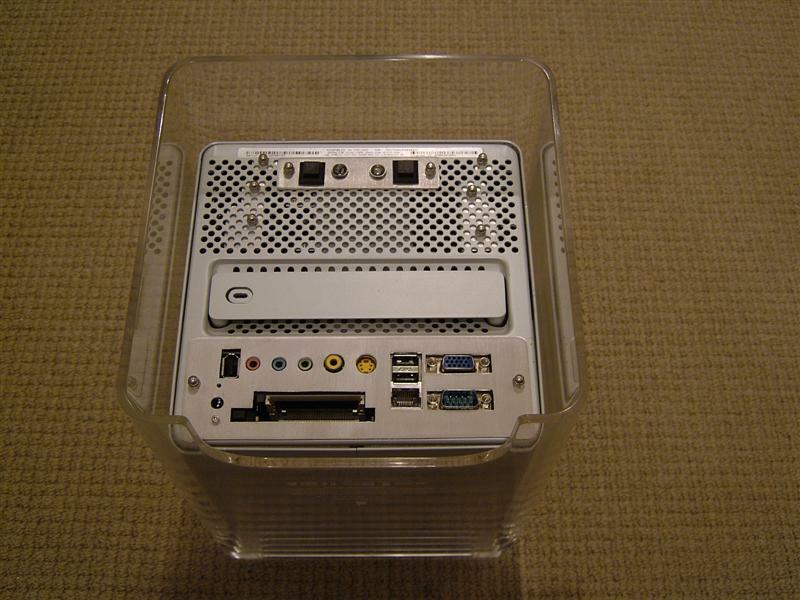 I love the case, it looks great and is fairly easy to cart around. Here are the final selection of pictures.